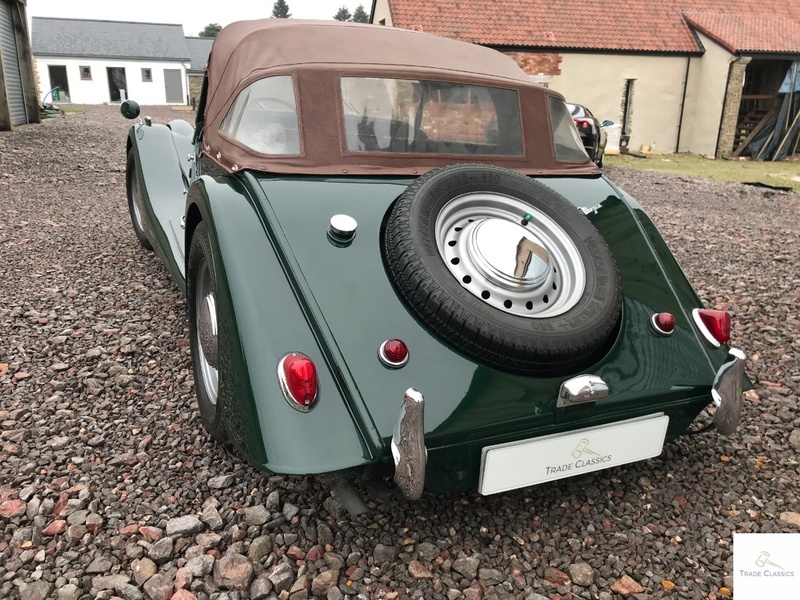 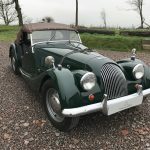 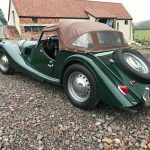 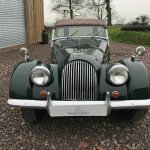 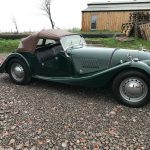 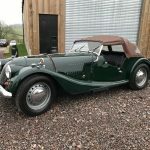 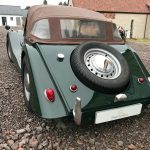 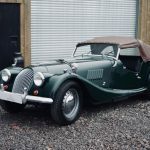 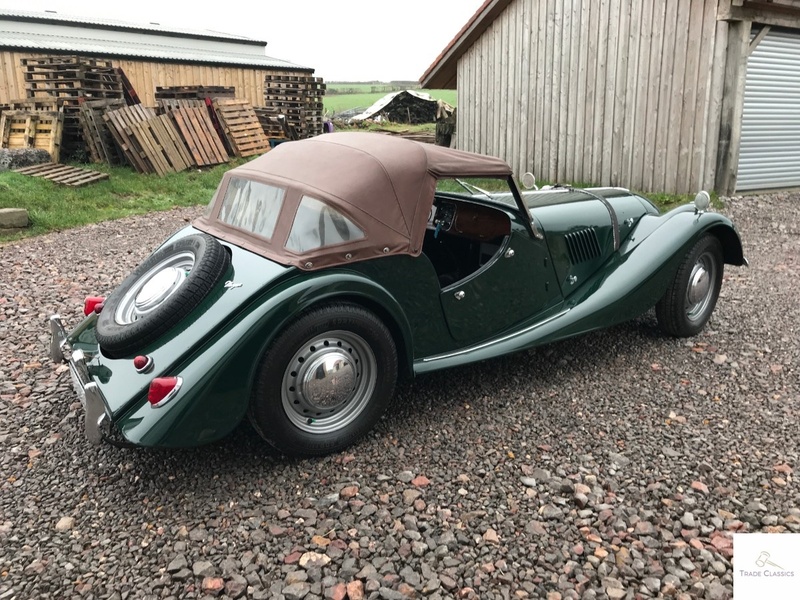 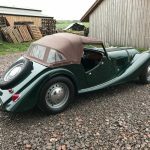 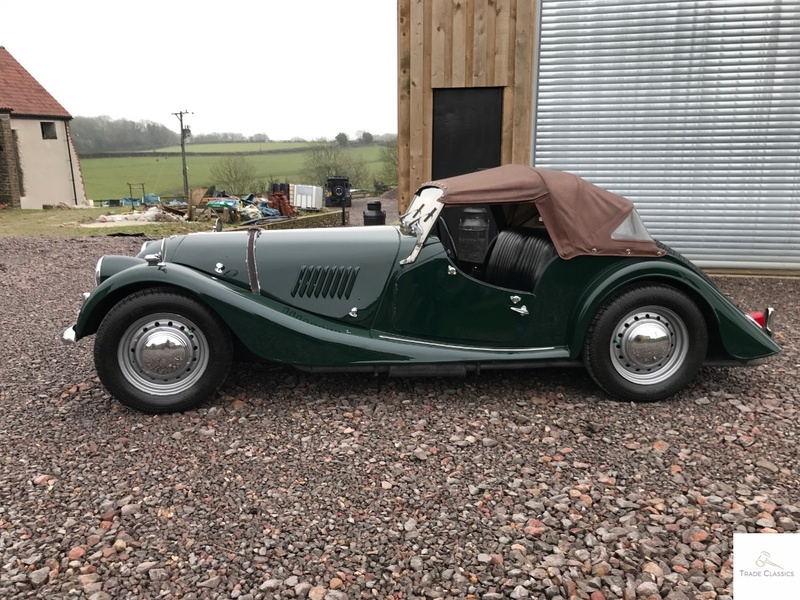 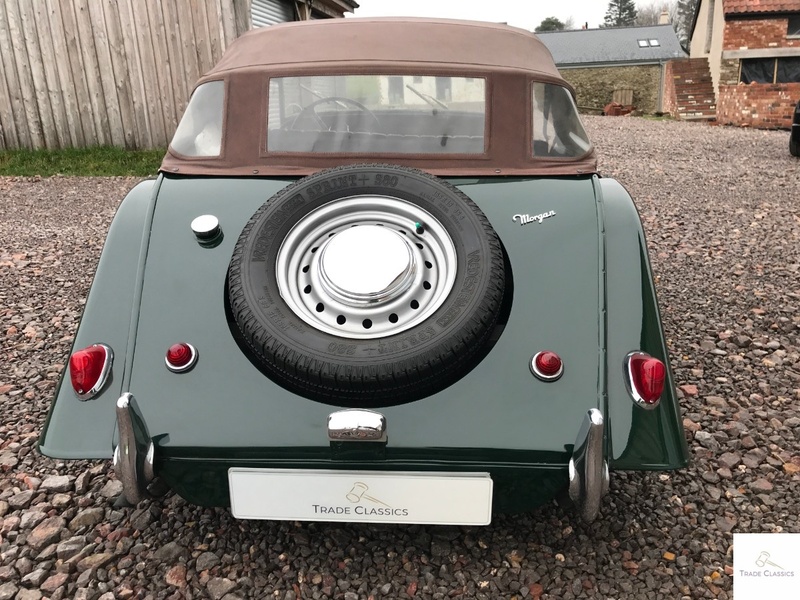 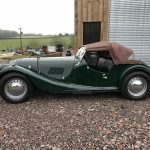 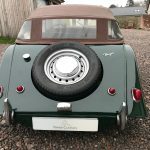 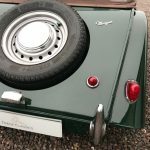 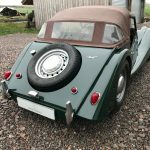 This quirky little Morgan is open to offer pre-auction. 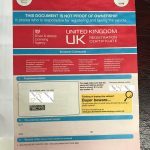 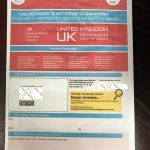 Get in touch with us below to put in an early offer. 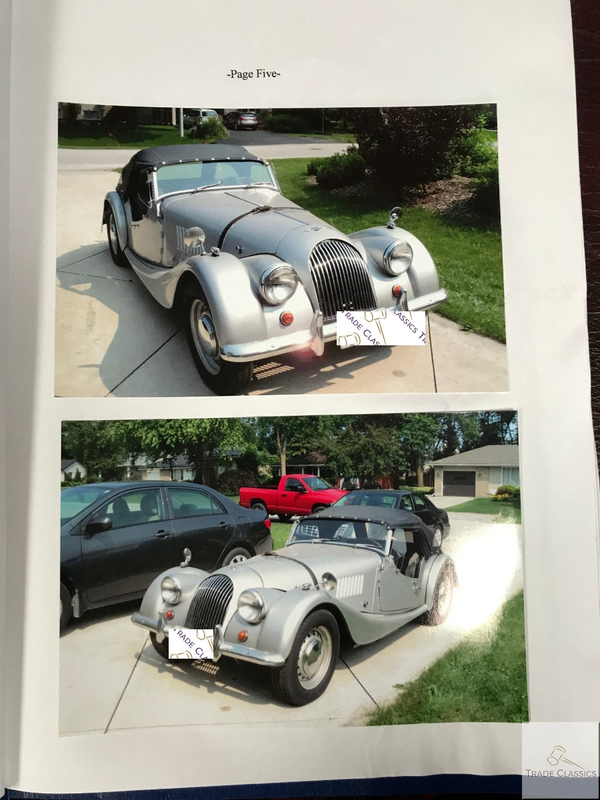 Make an offer before auction? 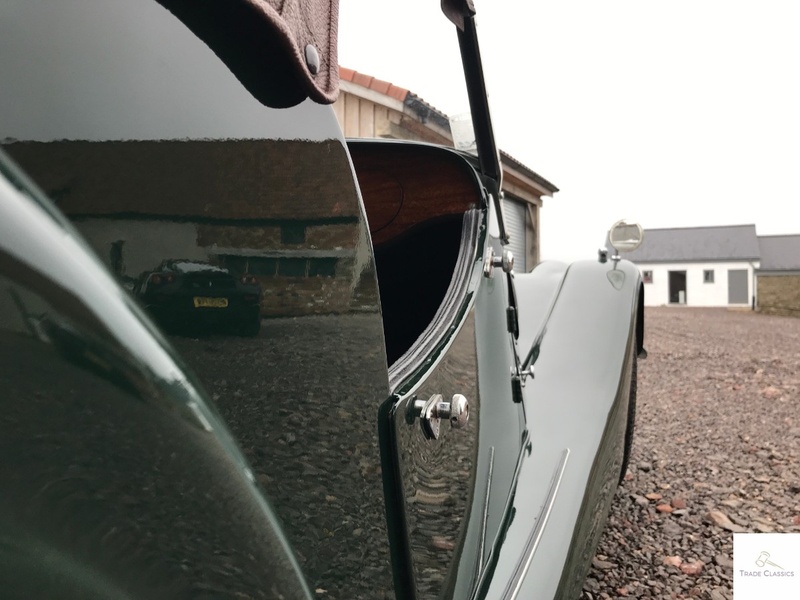 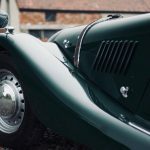 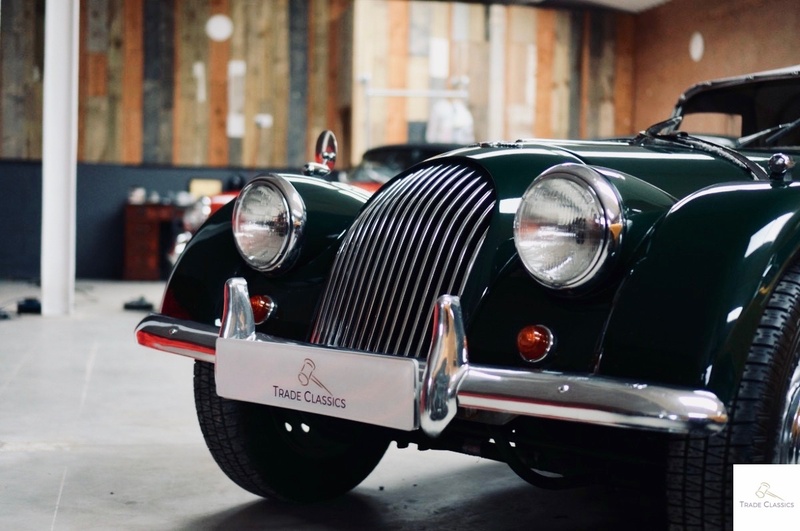 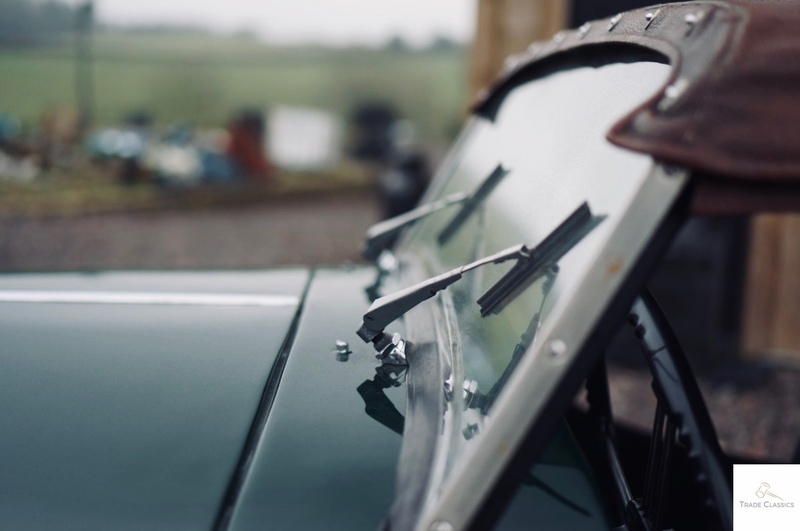 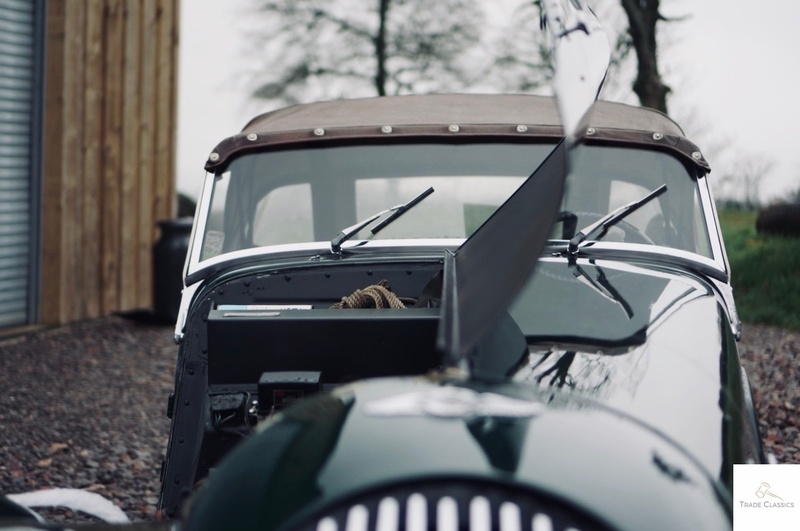 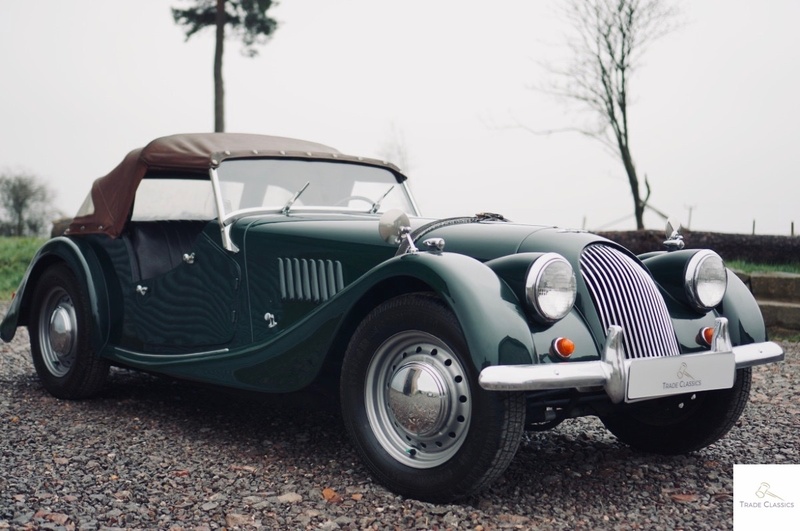 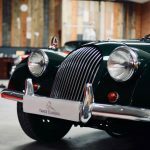 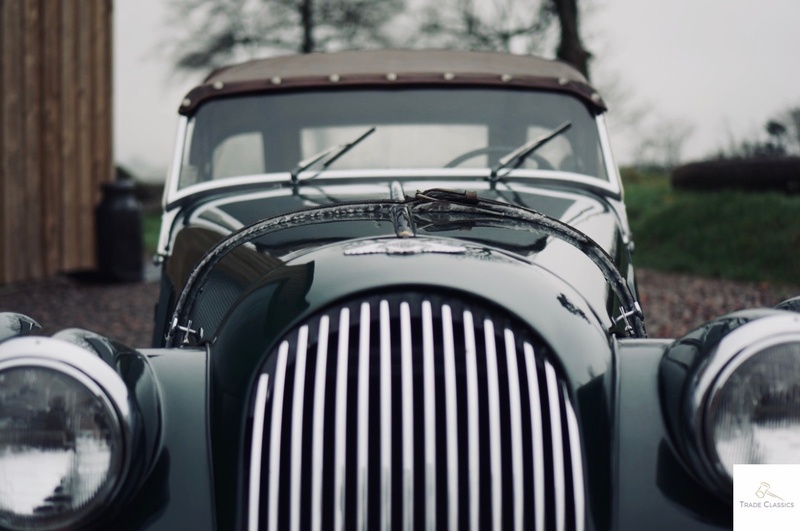 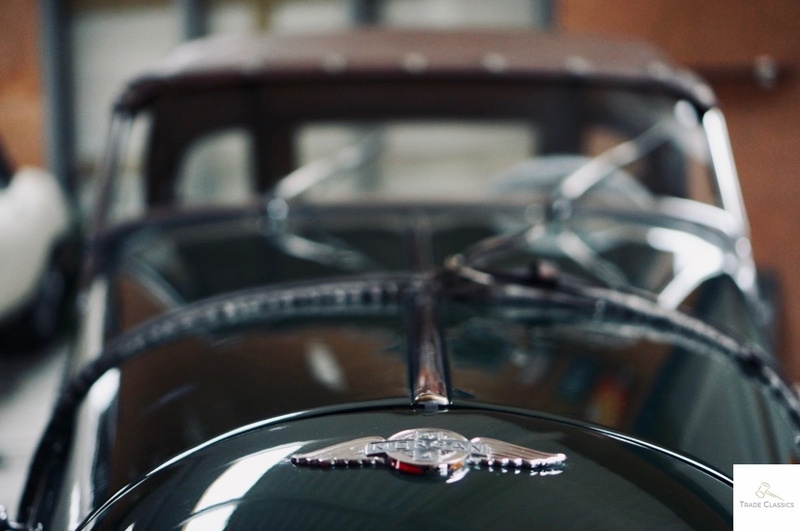 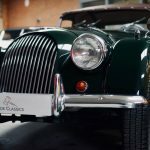 Morgan has been building cars by hand in their factory in Malvern for 100 years now. 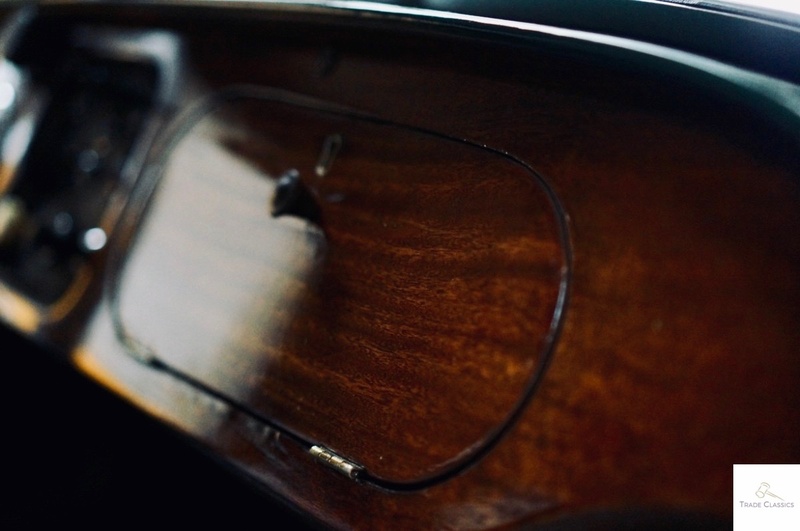 They are unique in that wood has featured in their construction in some shape or form, even to this day. 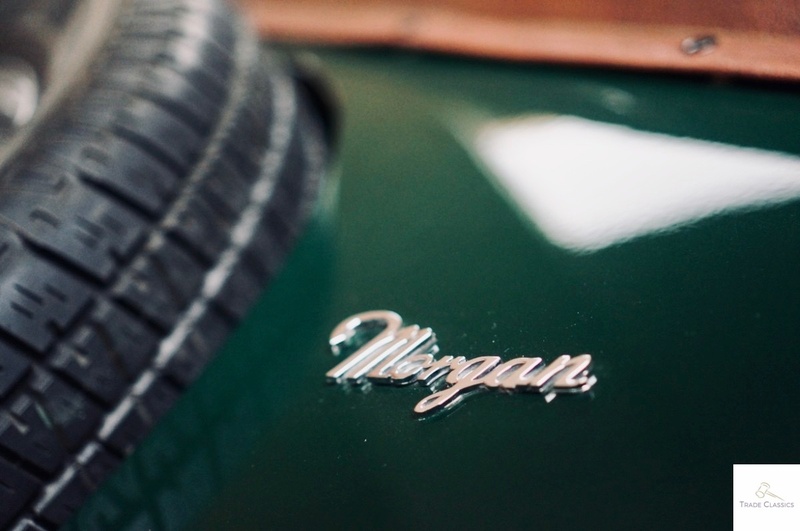 When Morgan first started production, the cars, or should we say “cyclecars”, were the order of the day. 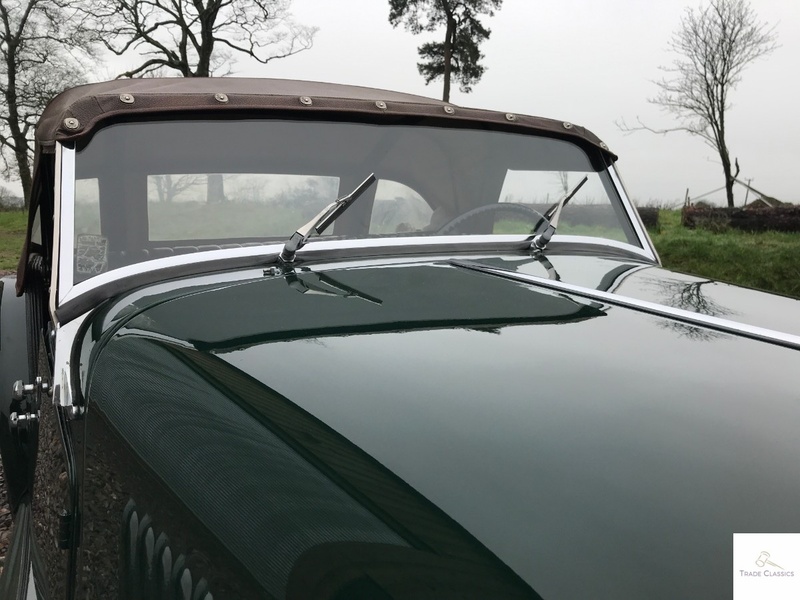 Coming in 2 or 4 seater combinations, with V twin engines. 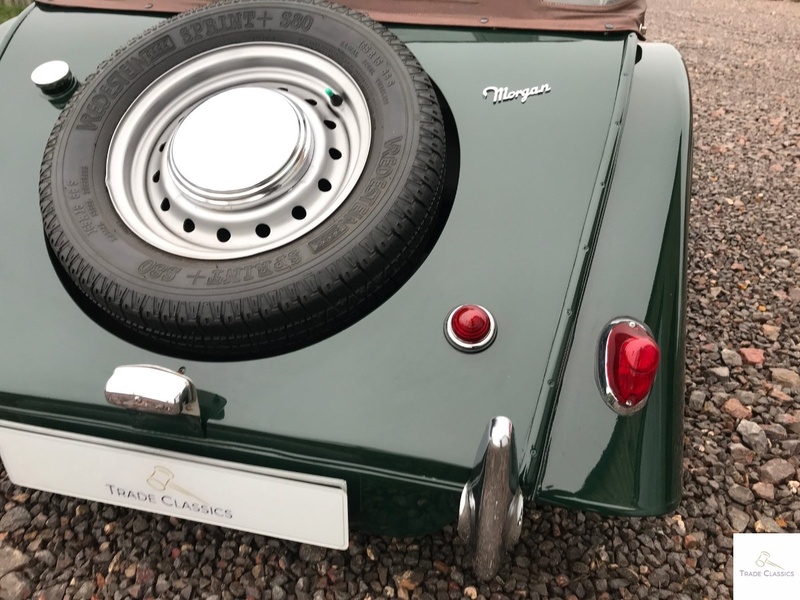 Another unique facet to the marque that still exists today! 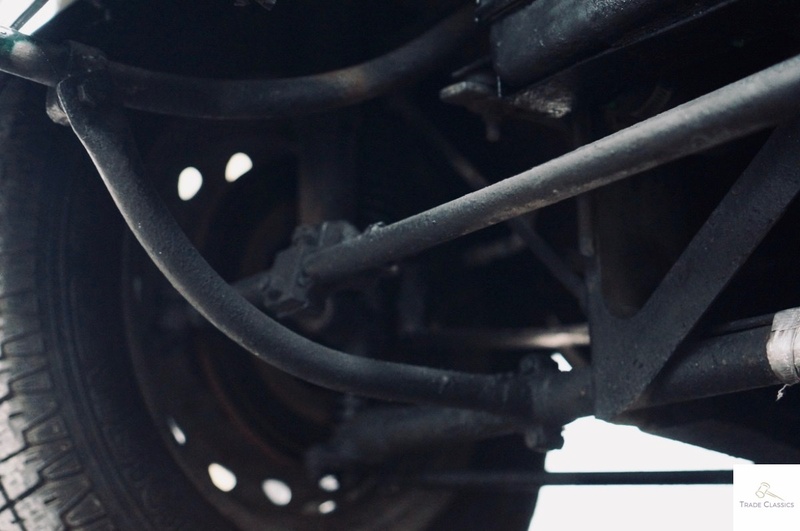 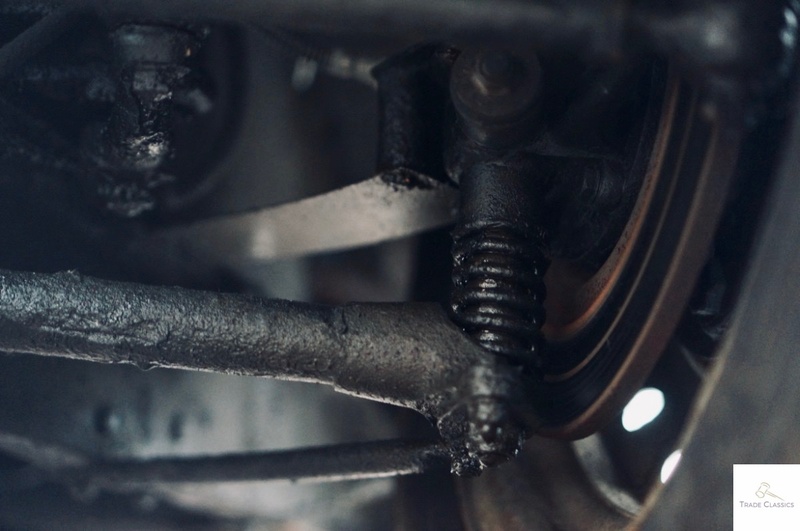 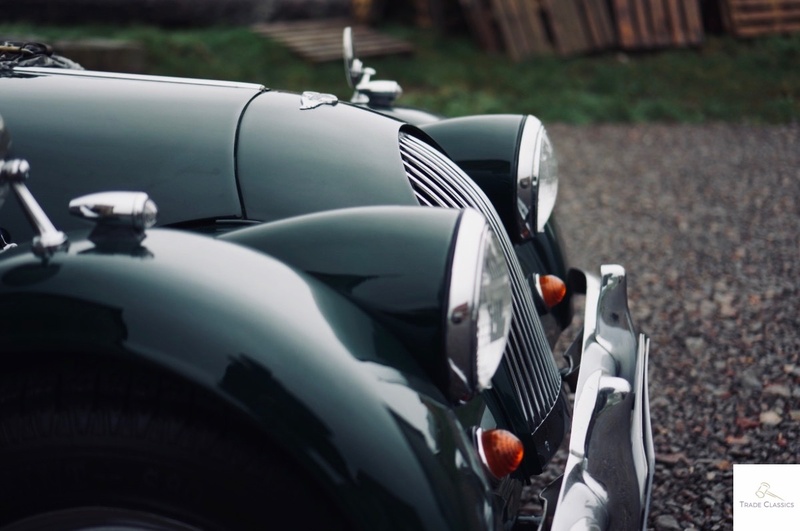 Production of a 4 wheel car began in 1935, known as the 4-4 or 4/4, denoting the 4 wheels, and the 4 cylinder engine. 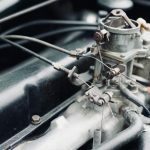 That same naming convention and set-up exists to today, with the engine displacement changing over the years. 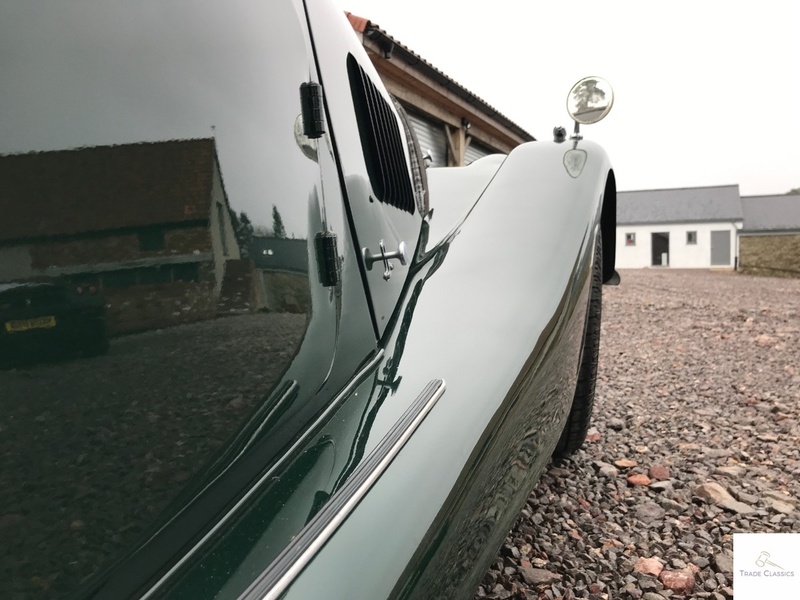 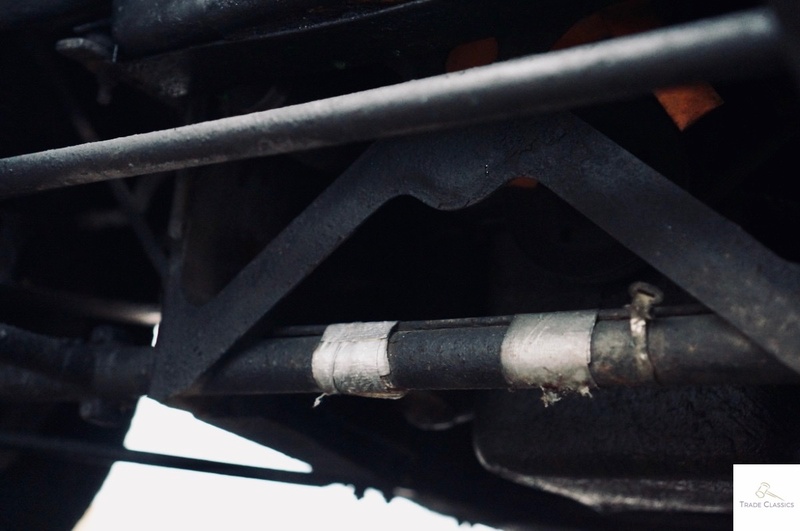 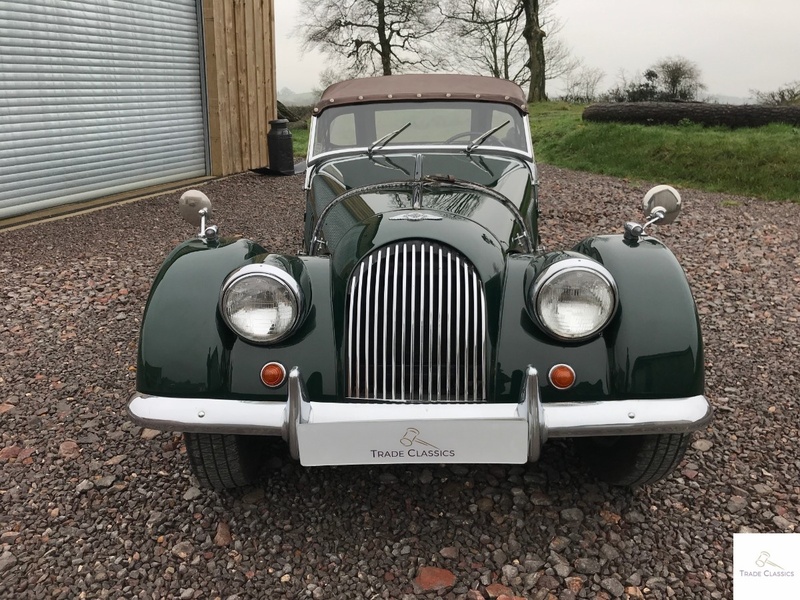 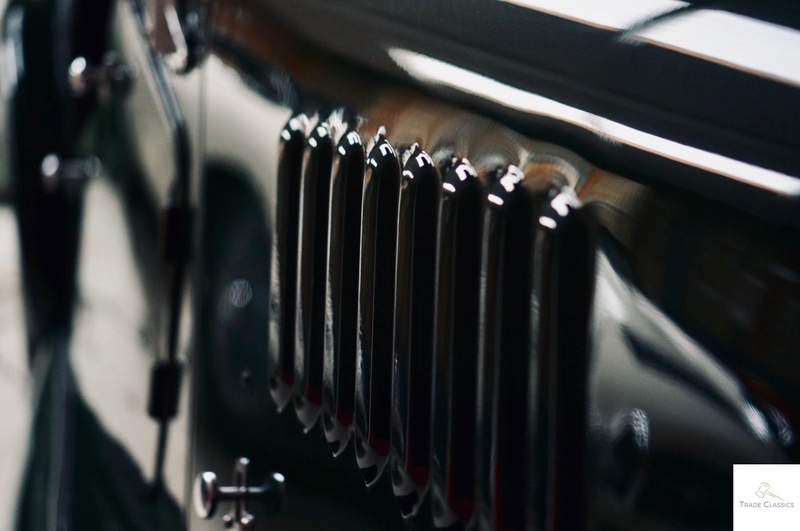 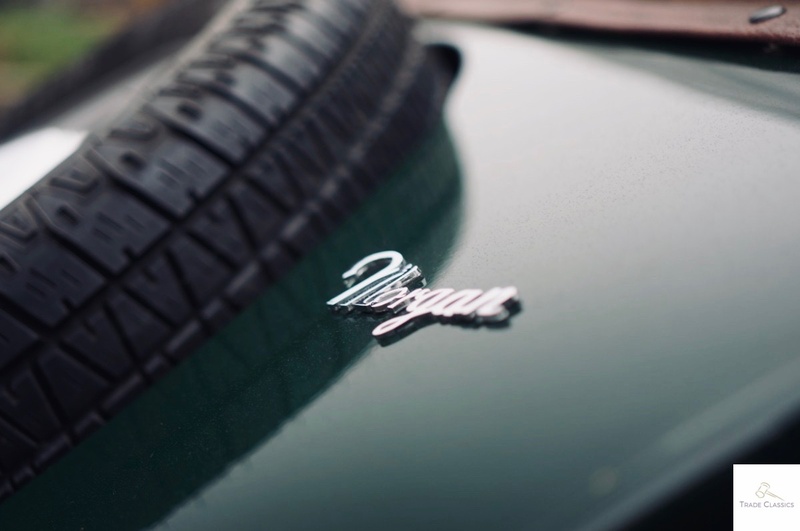 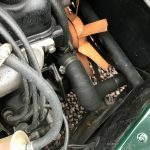 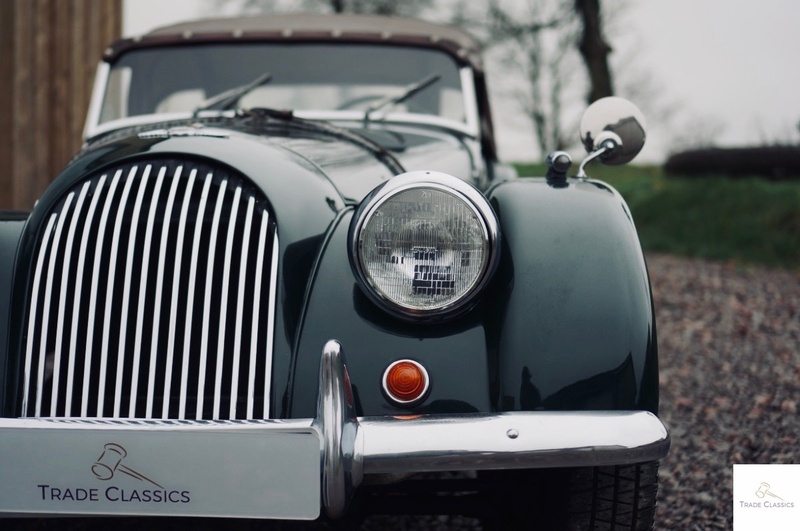 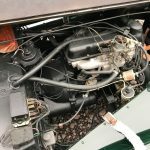 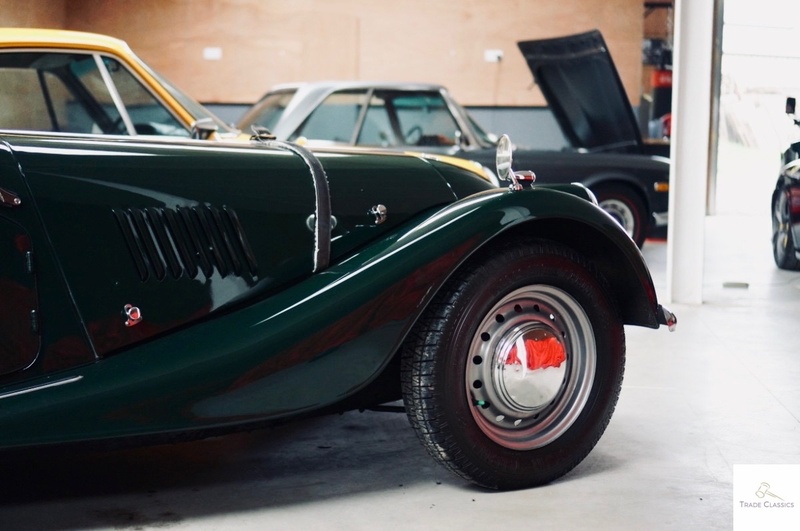 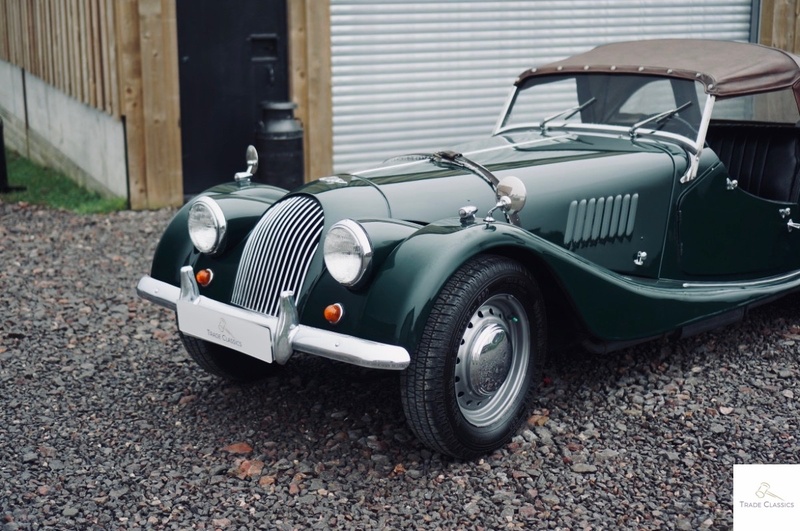 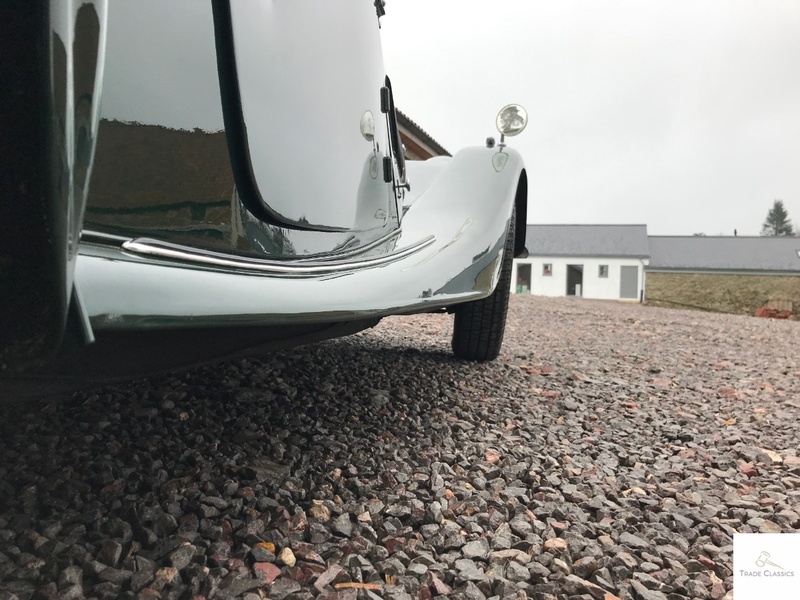 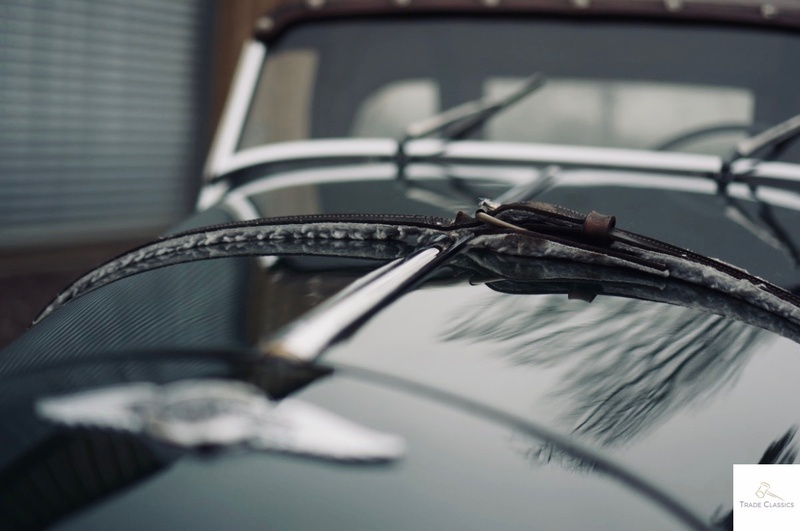 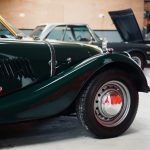 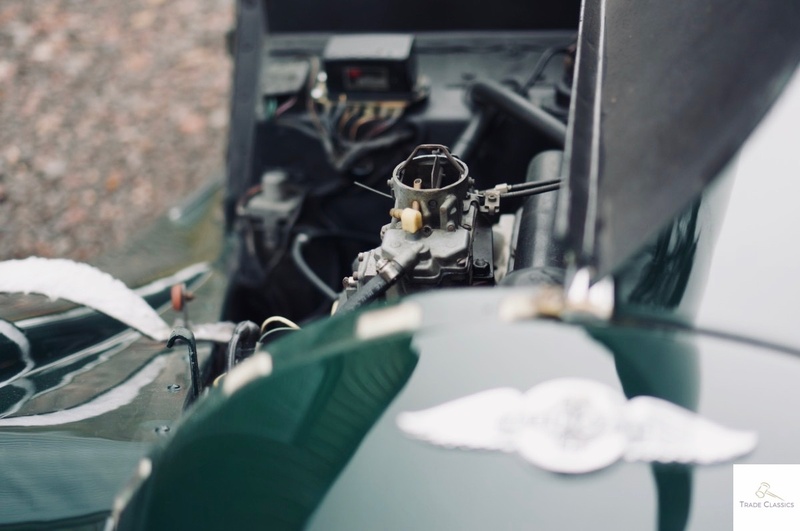 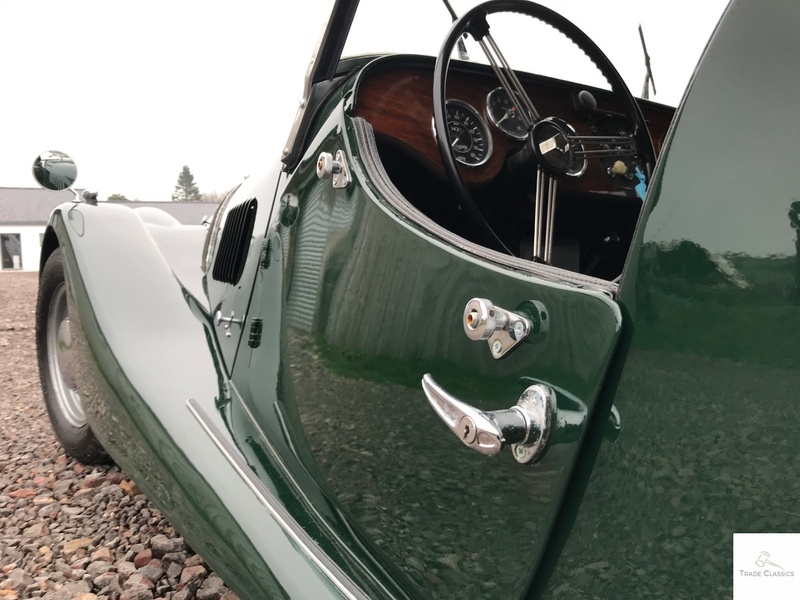 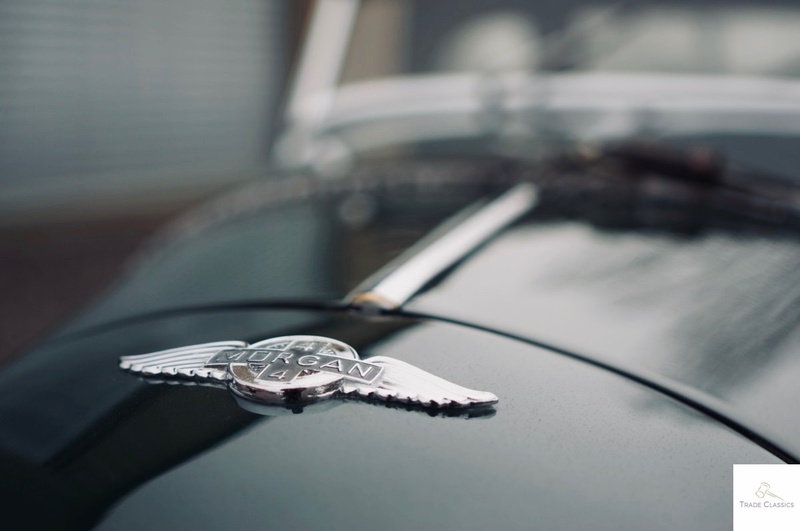 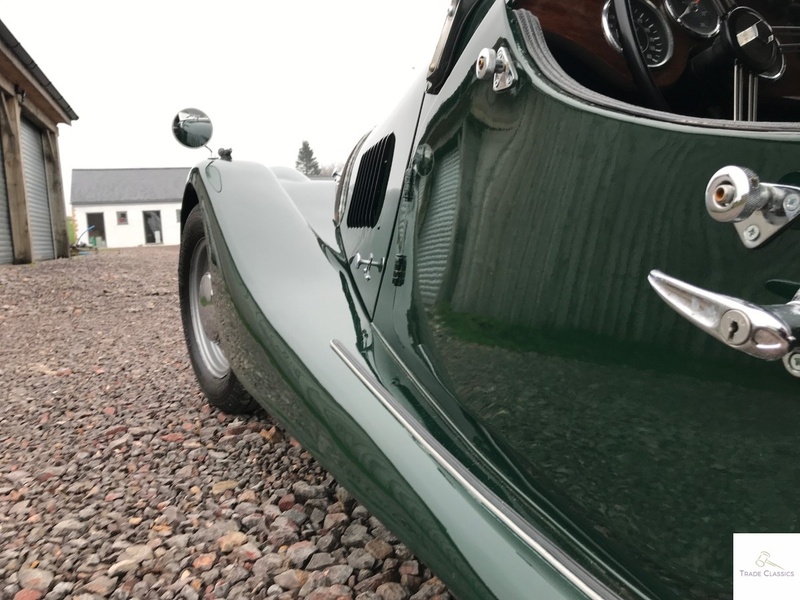 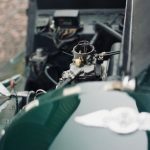 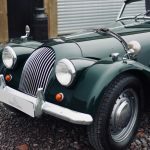 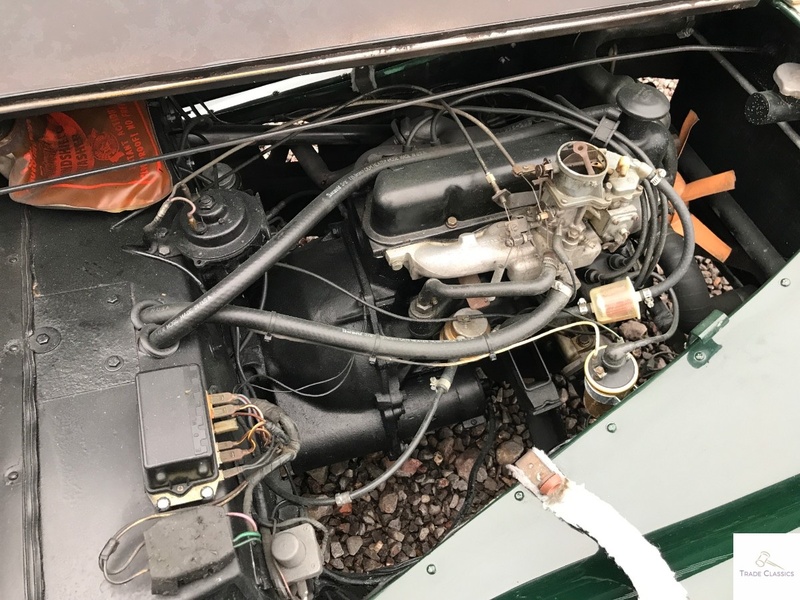 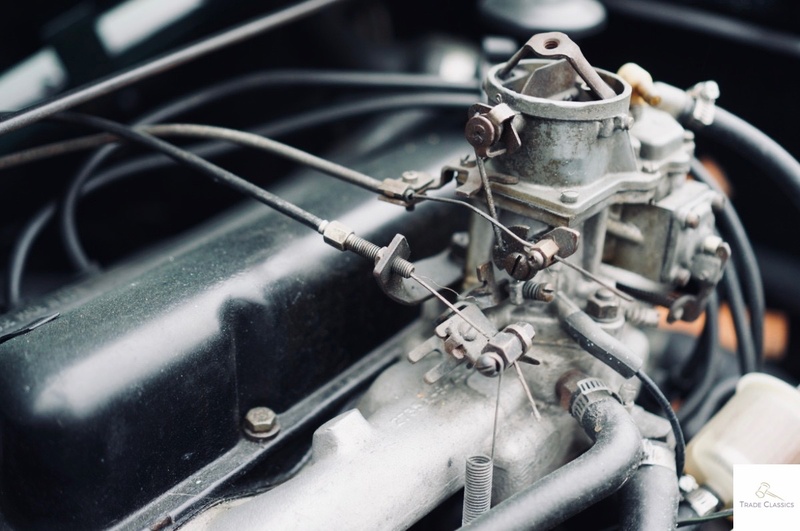 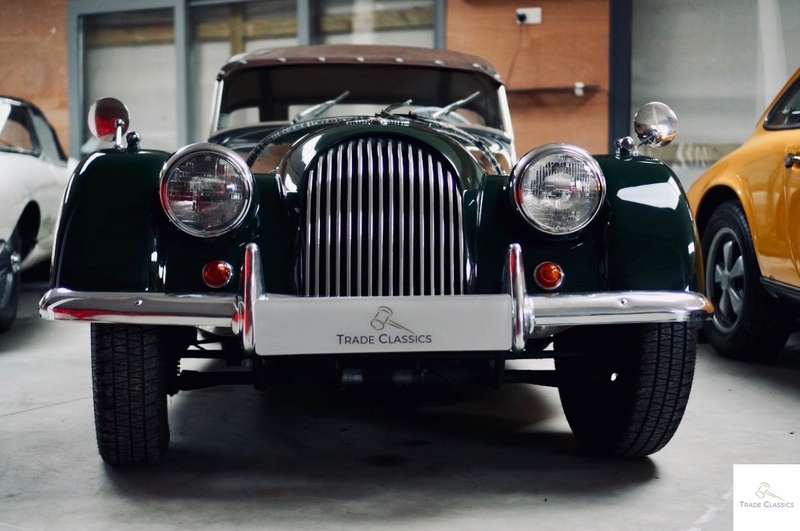 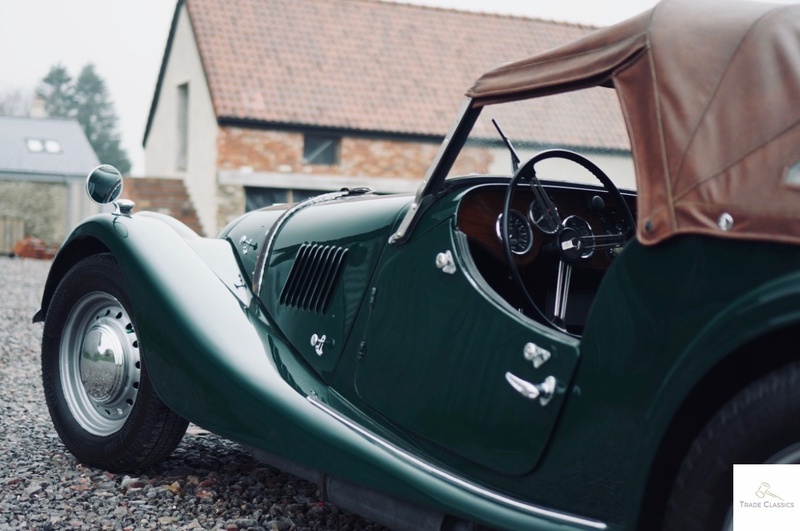 This particular example was built in 1969, and is often denoted as the Morgan 4/4 1600, signifying the 1.6L capacity of the Ford 4 cylinder engine that powers it through the roads. 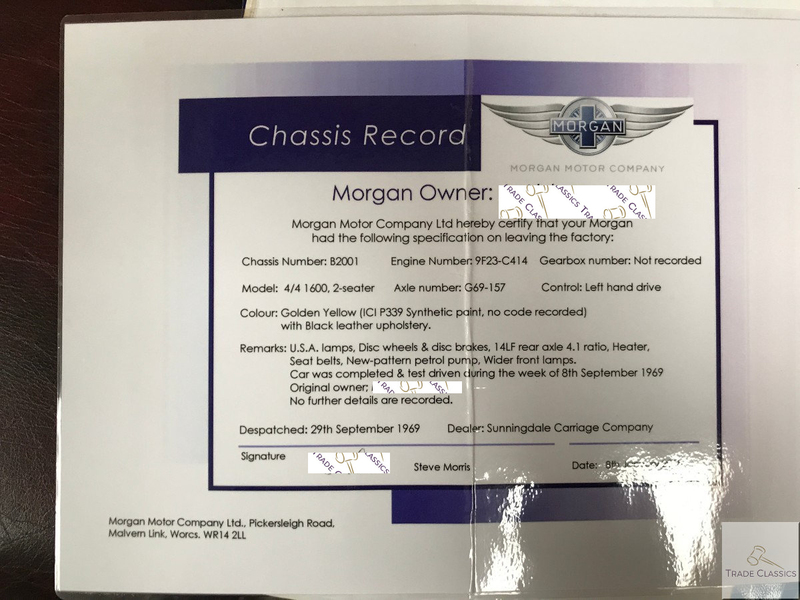 Arun is the owner of this Morgan 4/4, and it’s been part of his collection of cars for a few years now. 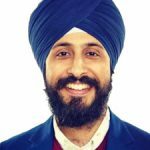 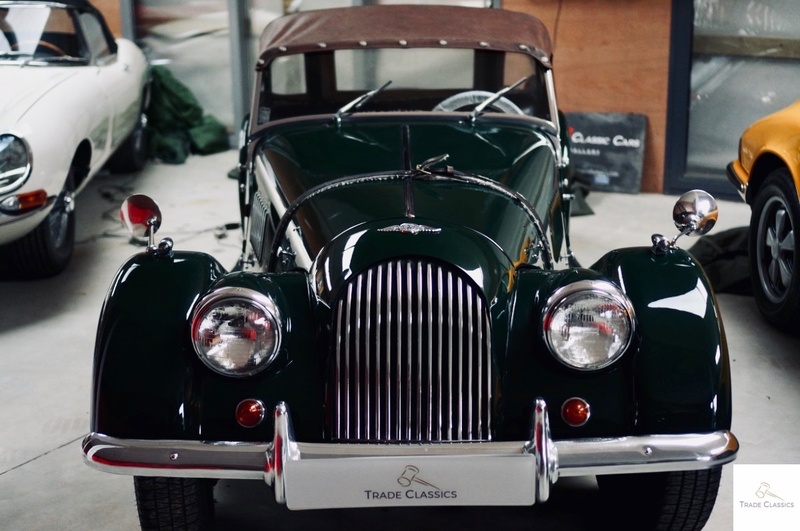 Arun is very much a car guy, and is lucky to own a collection of cars that he’s built up over time, picking cars that he has a passion for. 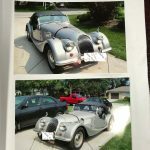 This particular car he acquired from Canada after his uncles friend, who was the owner from new, passed away. 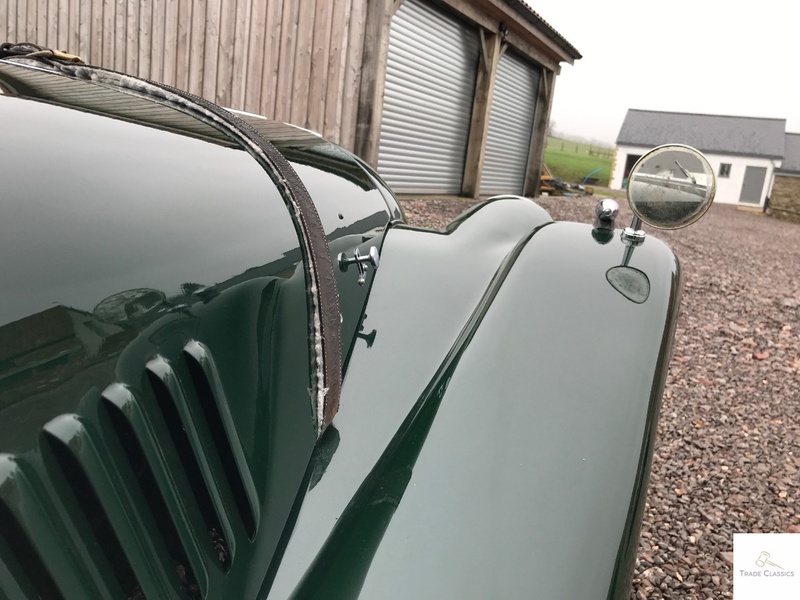 With the family connection, Arun knows that this car was original shipped in a yellow/orange colour, then being changed to silver, and now to racing green. 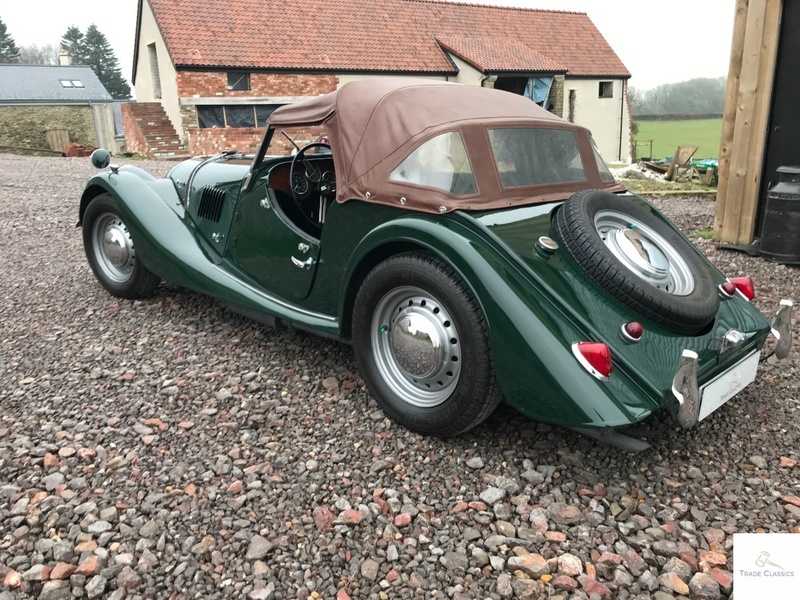 Arun’s not used the car much, just to local club meets and pub lunches, but describes it like “a little pea shooter”, very apt we think. 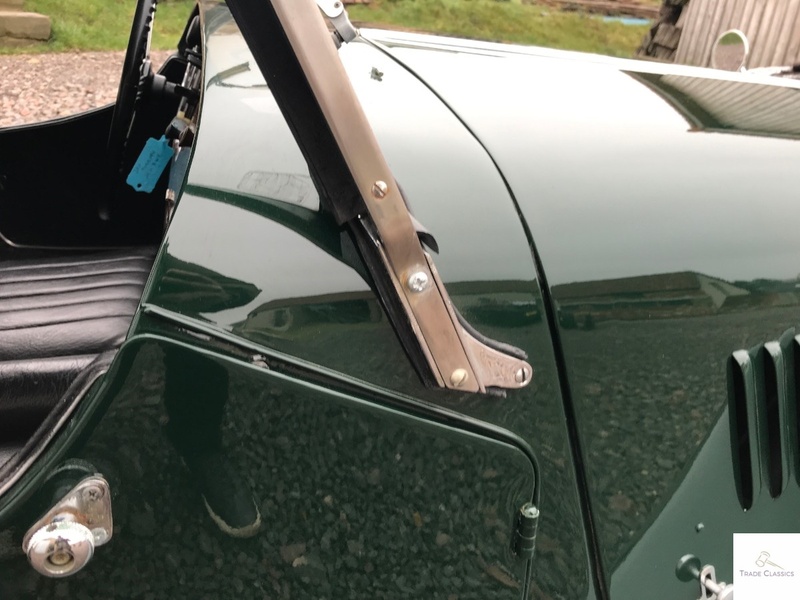 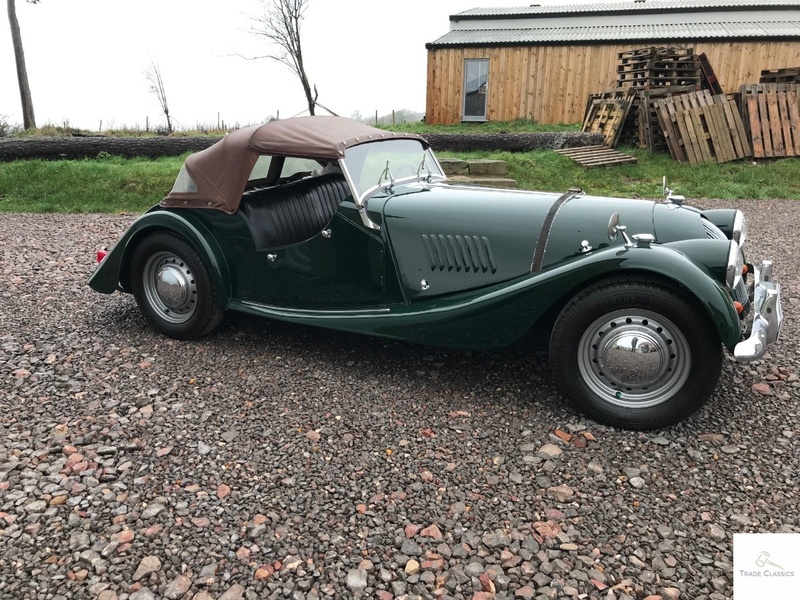 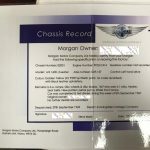 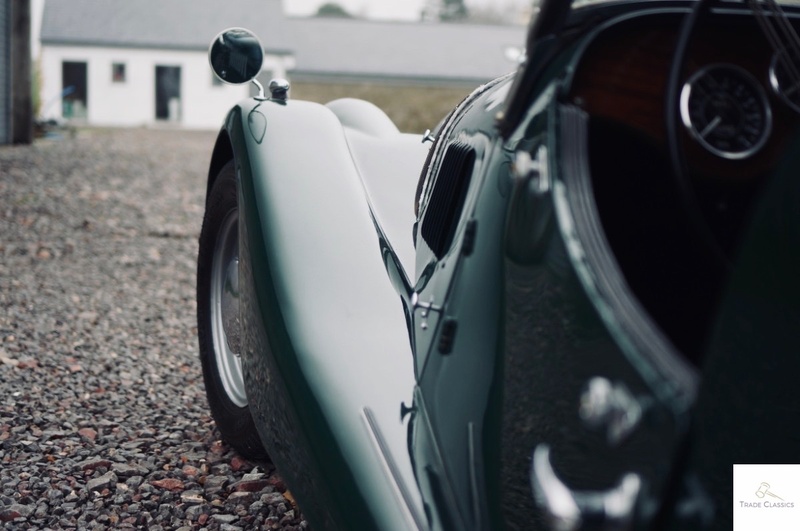 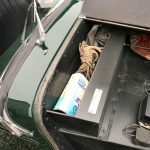 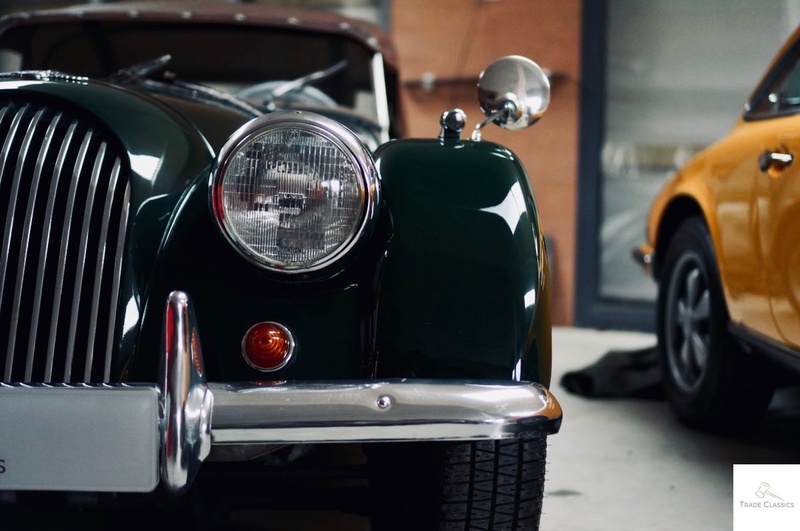 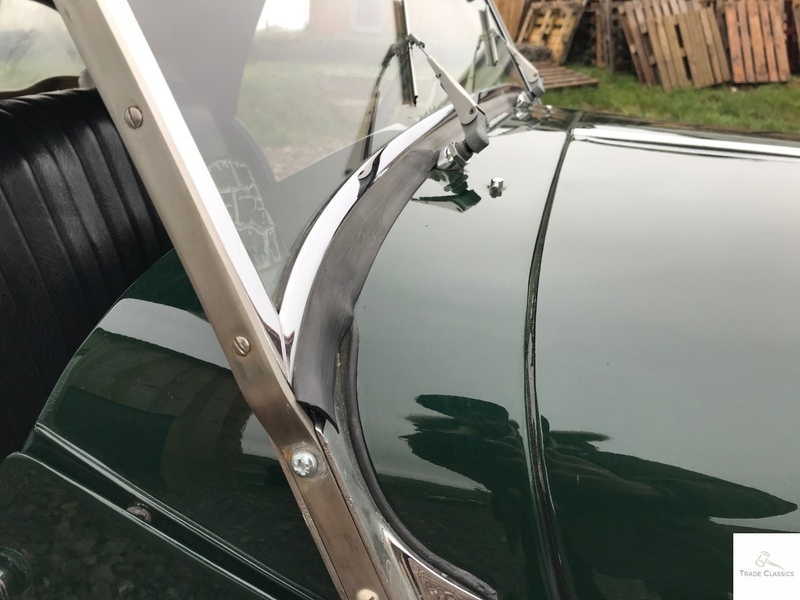 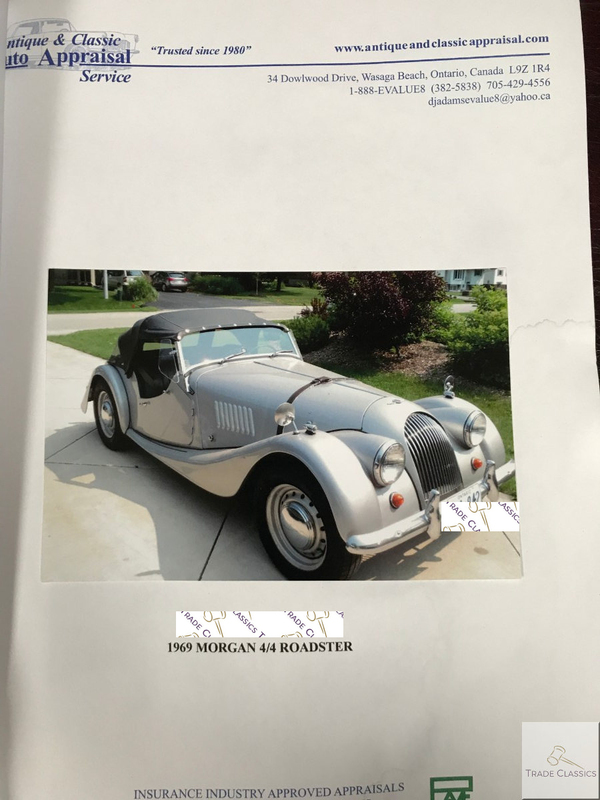 Being a car guy, he’s now set his sights on a new car he’d like to buy, and so the Morgan will be leaving the stable to make room for a new car, and to free up some capital for the next purchase. 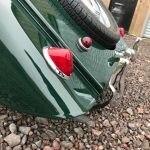 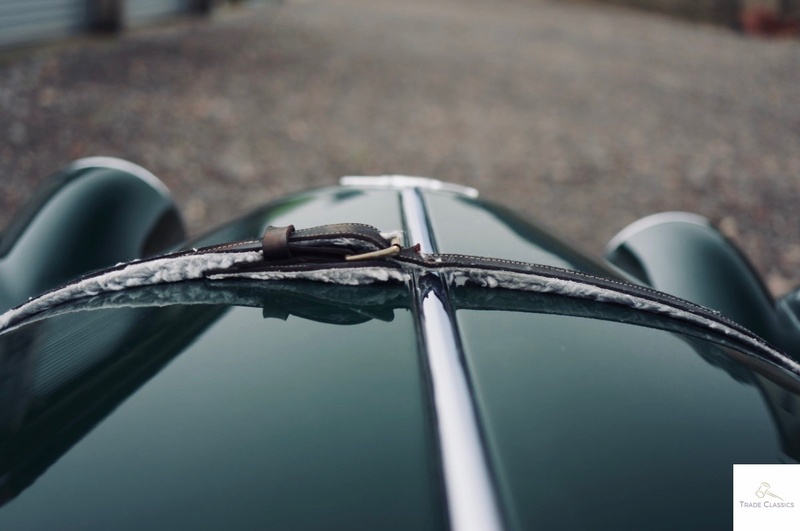 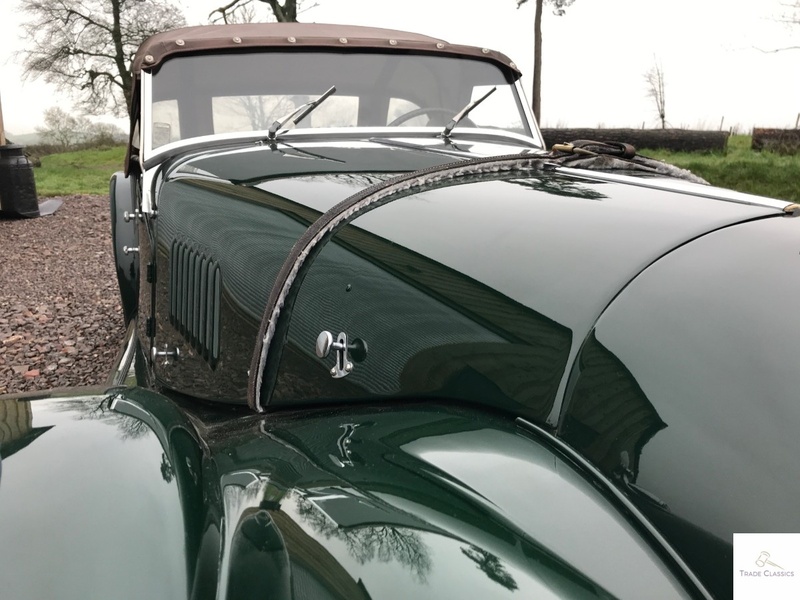 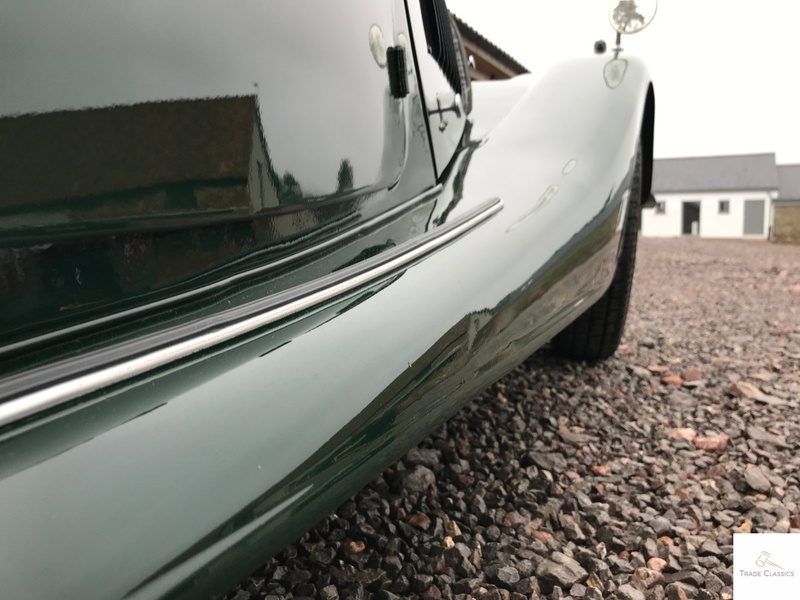 The 4/4 is now finished in British Racing Green, having originally been painted a yellow/orange colour from factory. 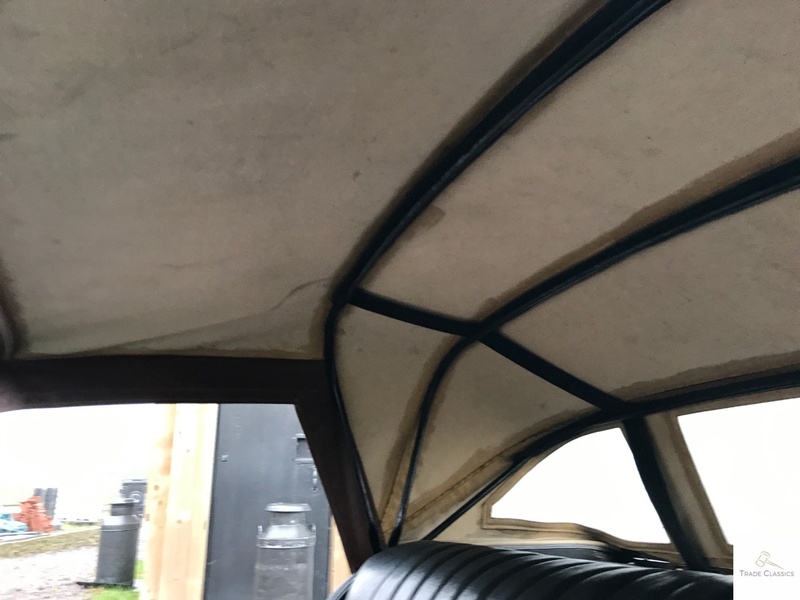 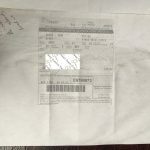 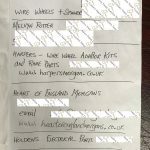 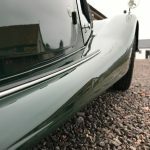 The car has been well looked after, and a paint commission post shipping by Arun explains the great condition. 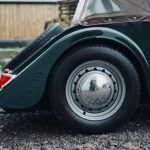 Steel wheels wrapped in Vredestein tyres across the 4 wheels! 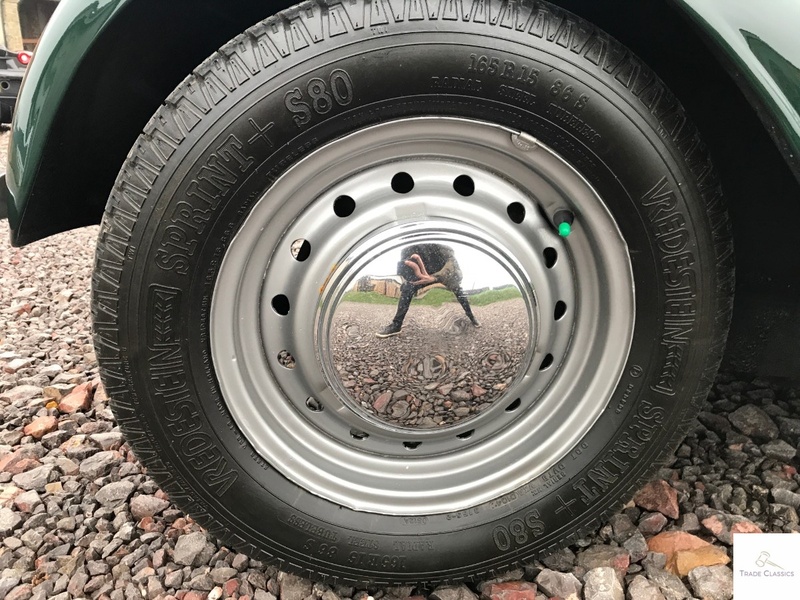 The wheels presented in good condition, one of the chrome hub-caps had a dent as observed in the images. 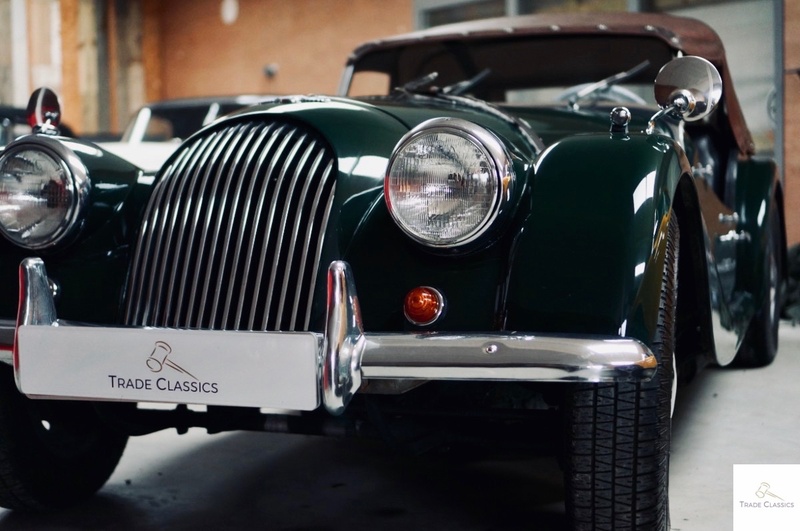 Take a look at the video review for the full detail. 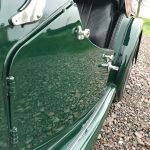 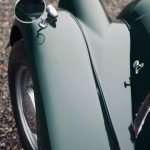 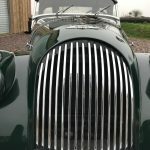 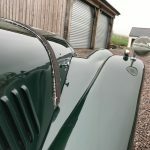 The bodywork on this Morgan is in great condition. 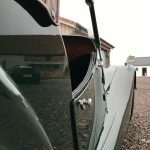 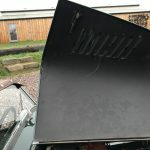 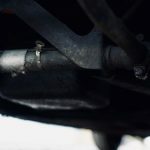 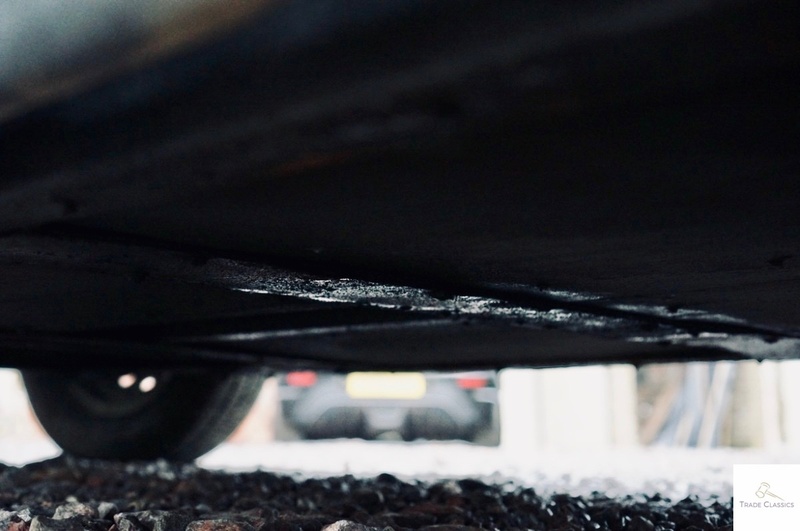 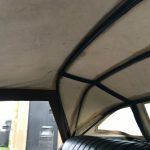 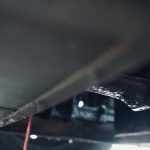 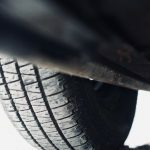 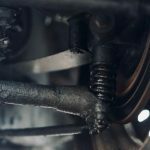 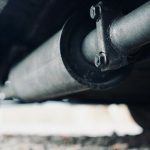 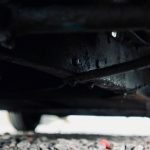 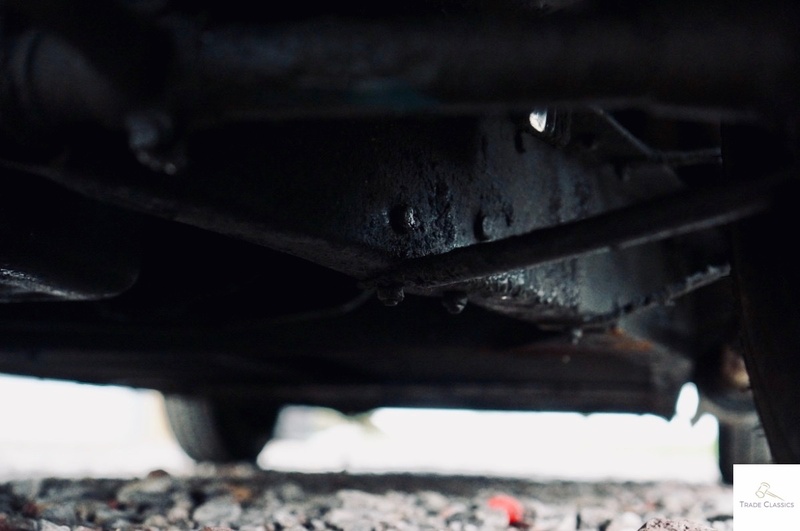 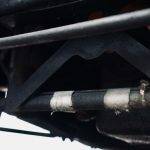 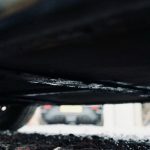 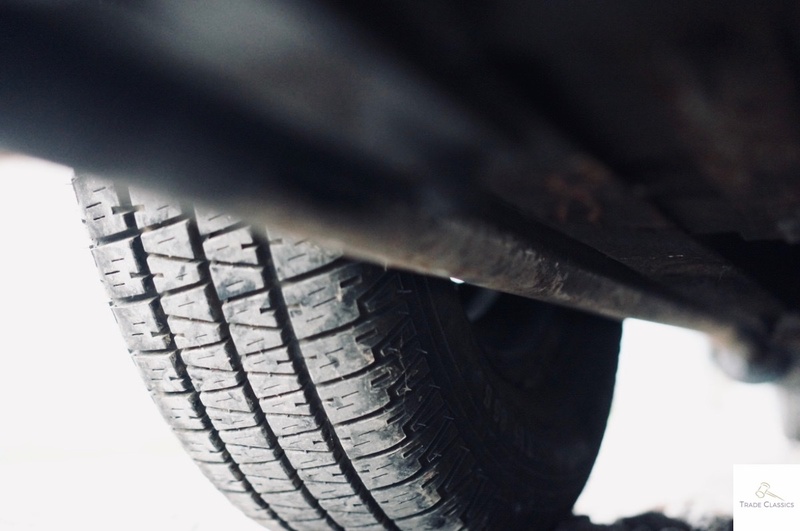 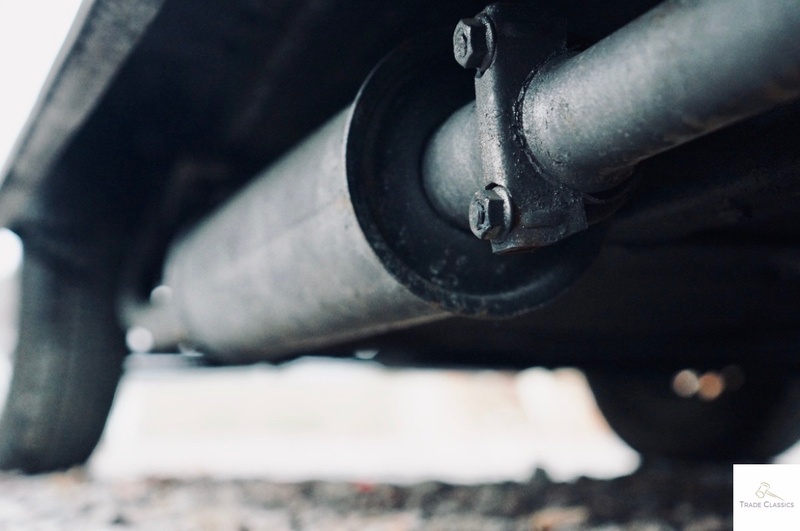 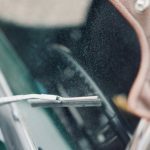 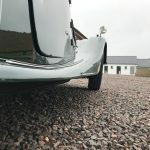 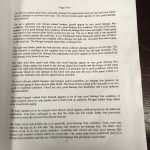 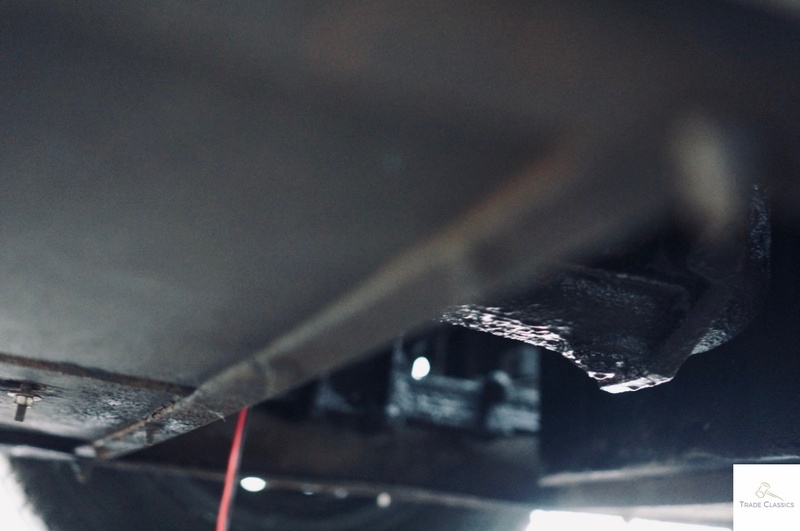 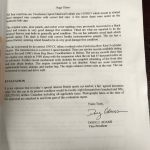 We didn’t observe any defects across the bodywork, and no rust or rot observed with the car having been well looked after. 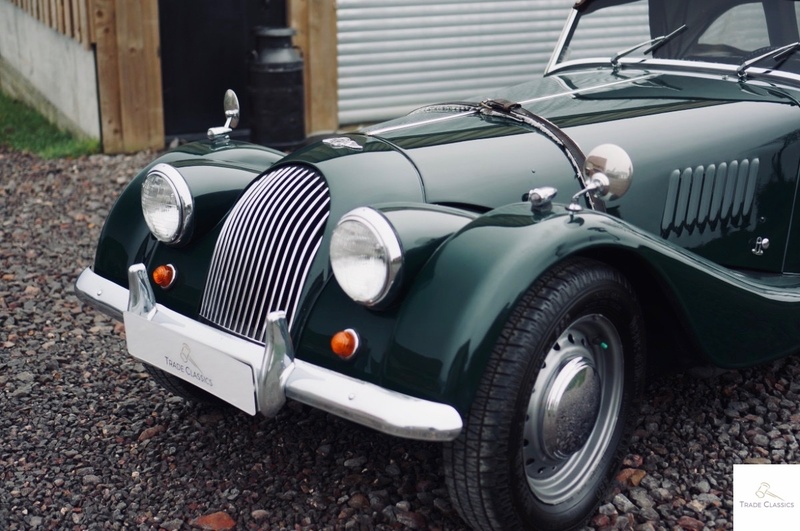 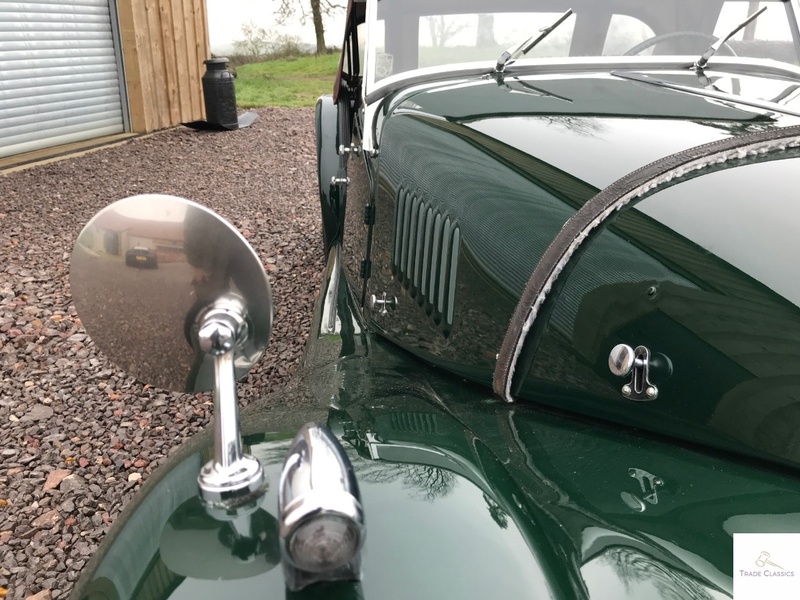 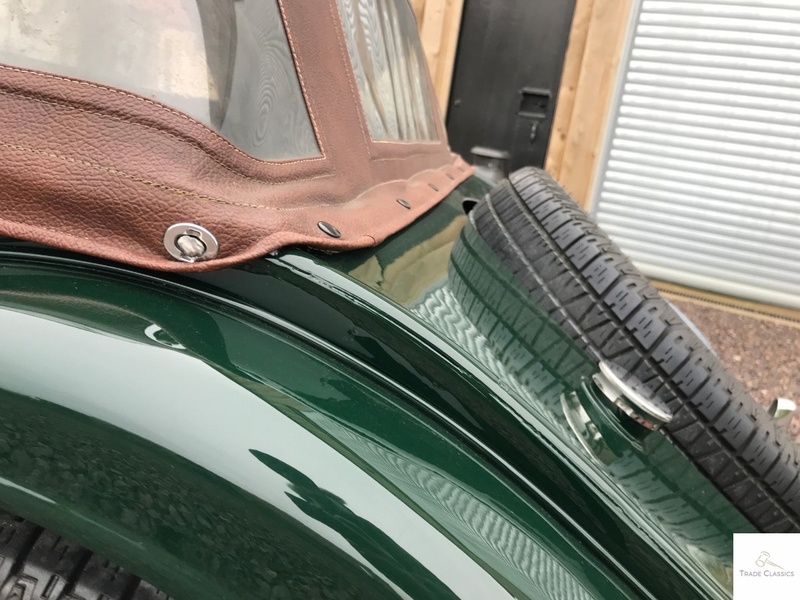 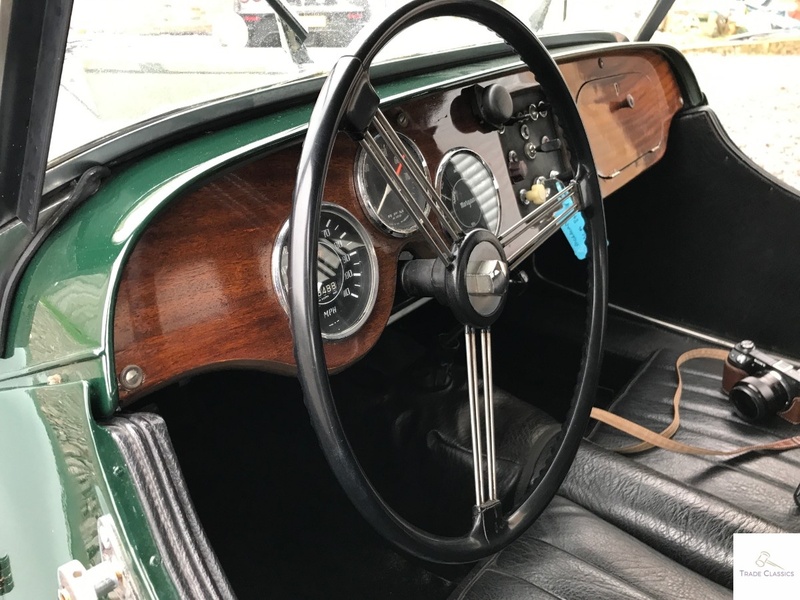 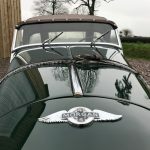 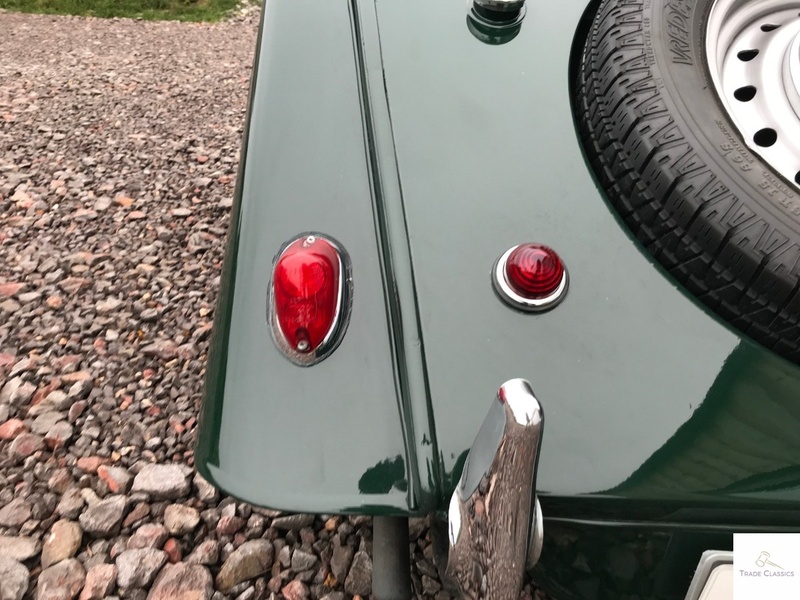 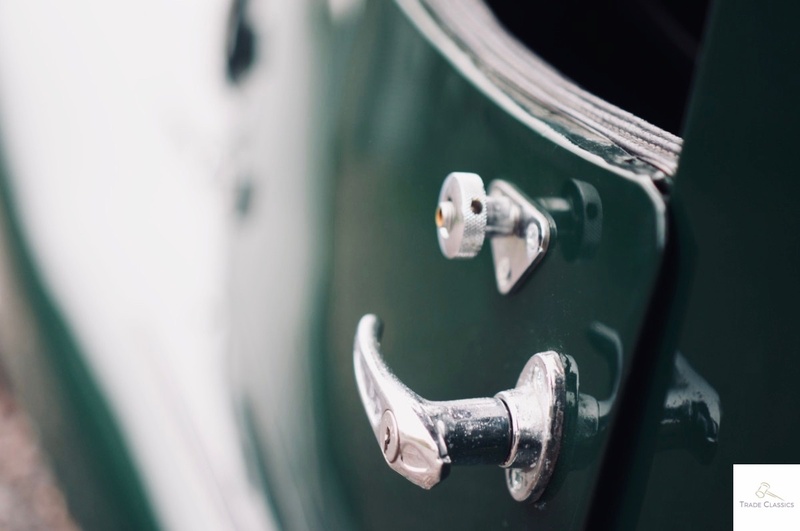 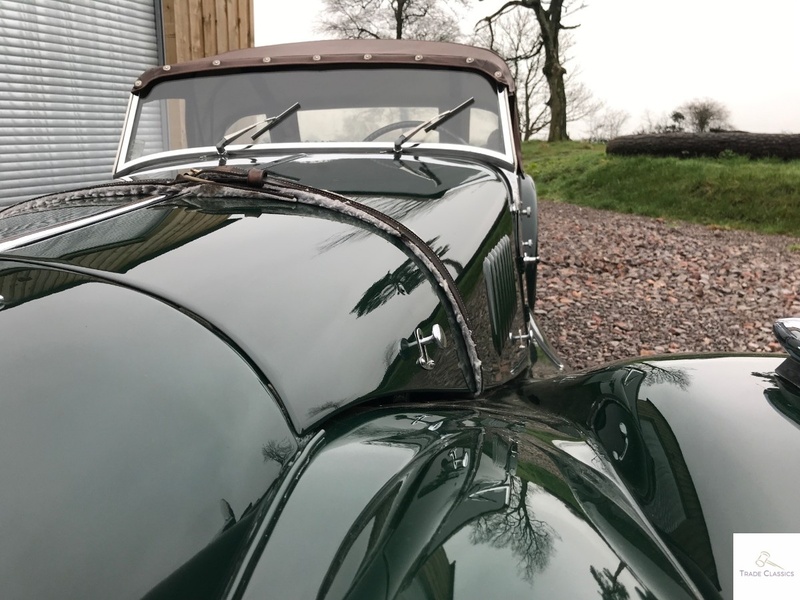 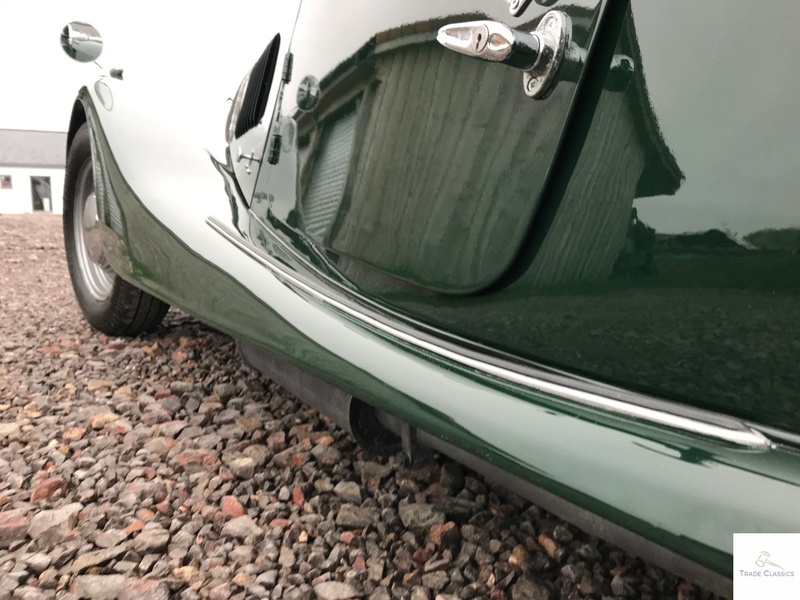 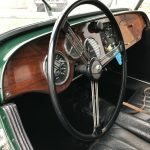 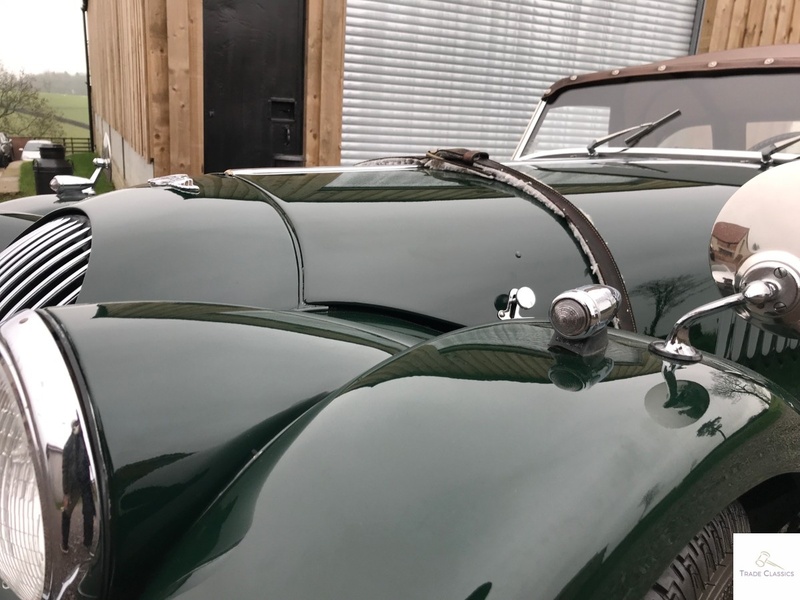 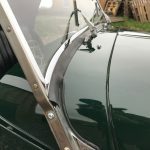 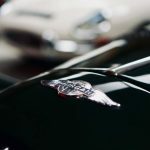 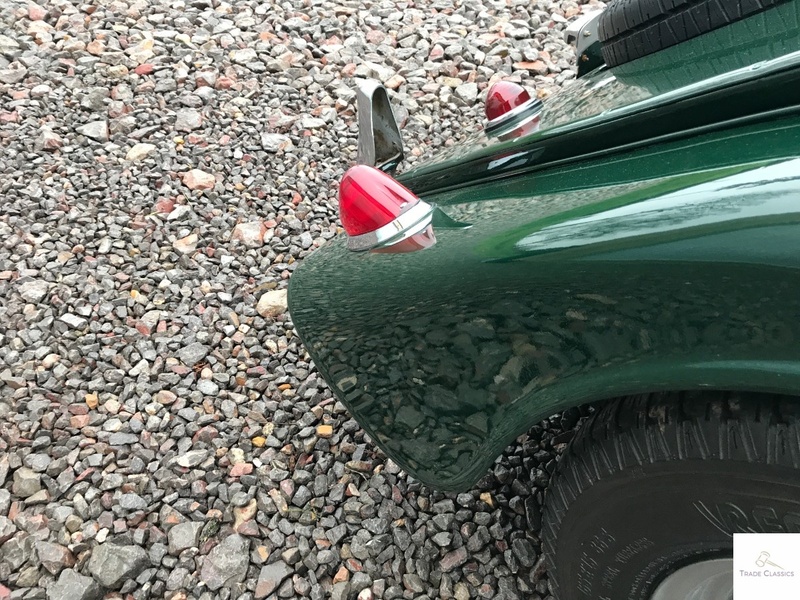 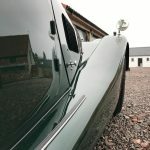 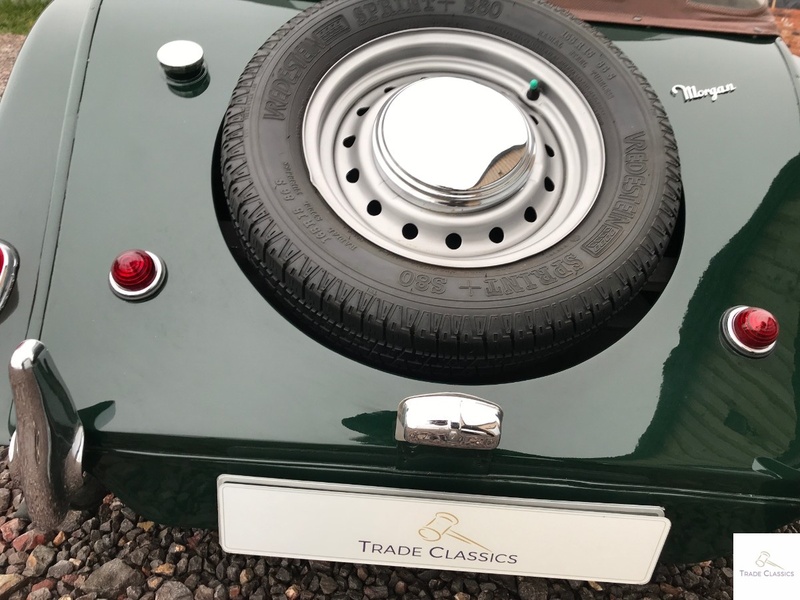 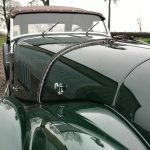 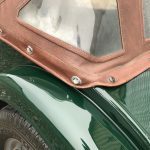 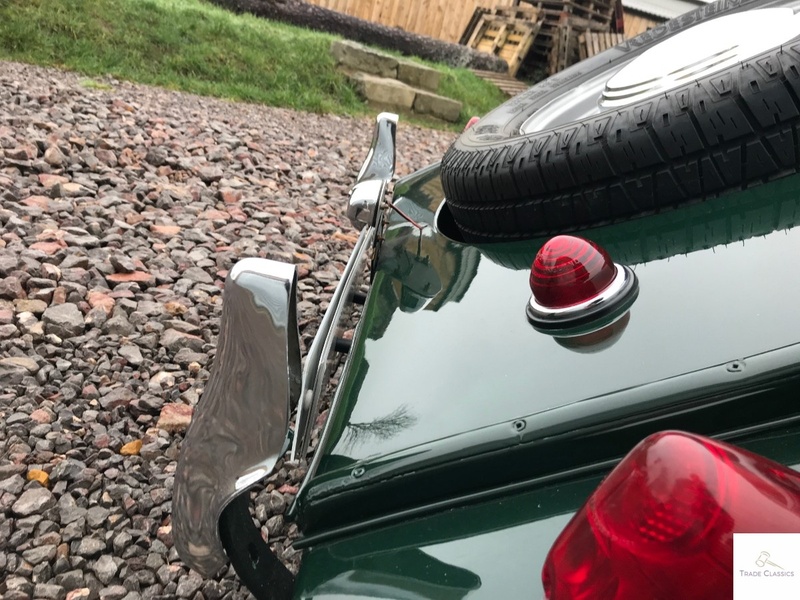 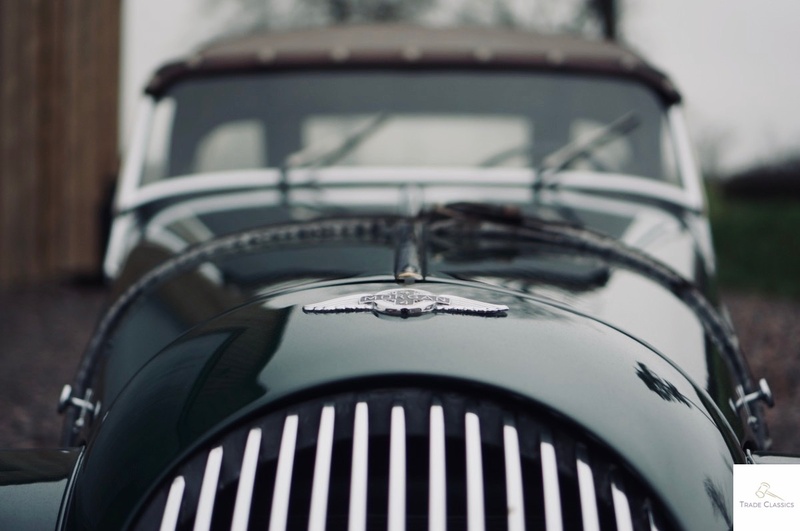 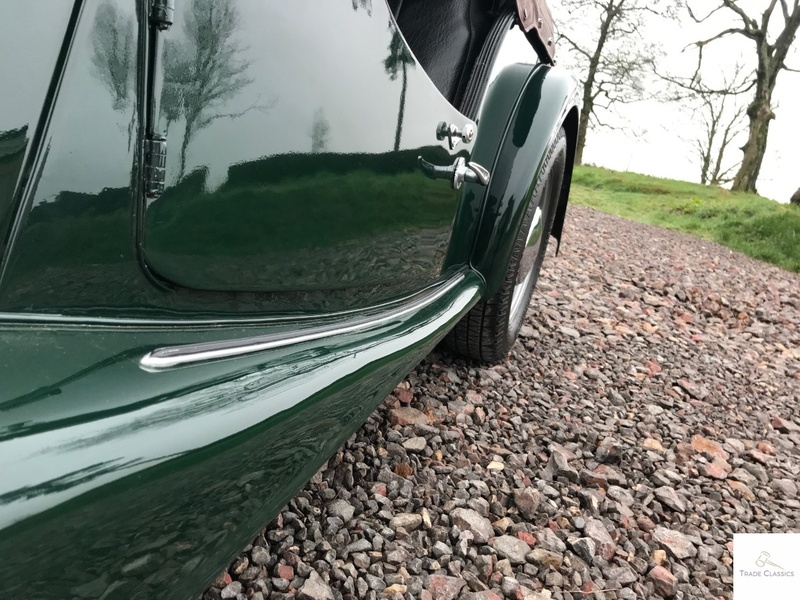 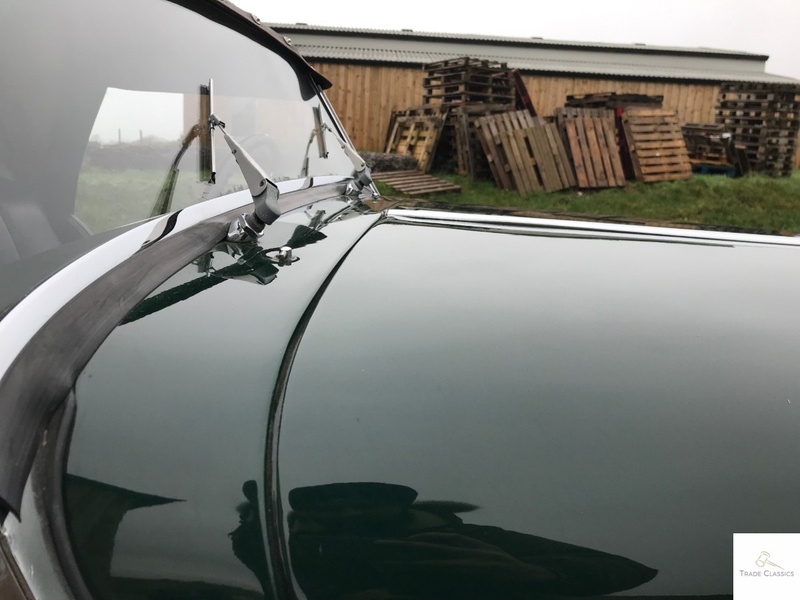 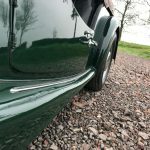 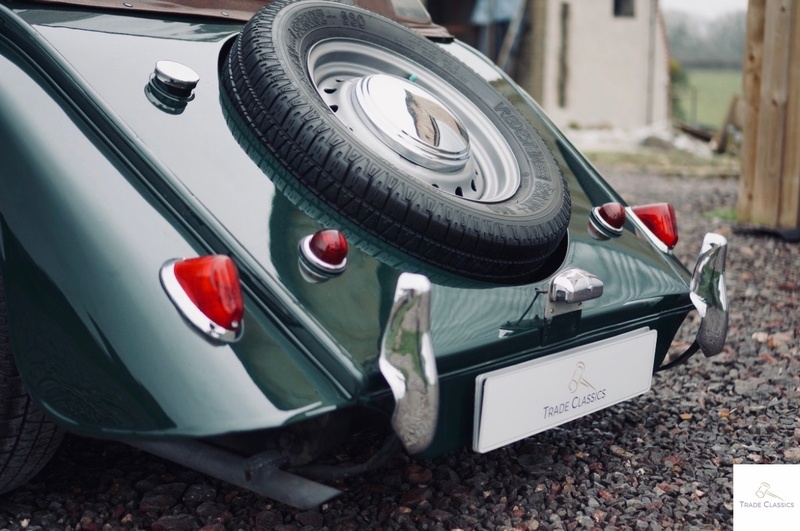 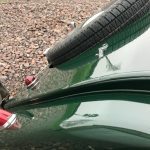 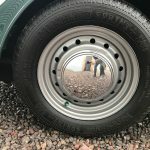 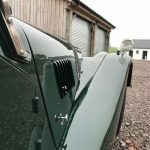 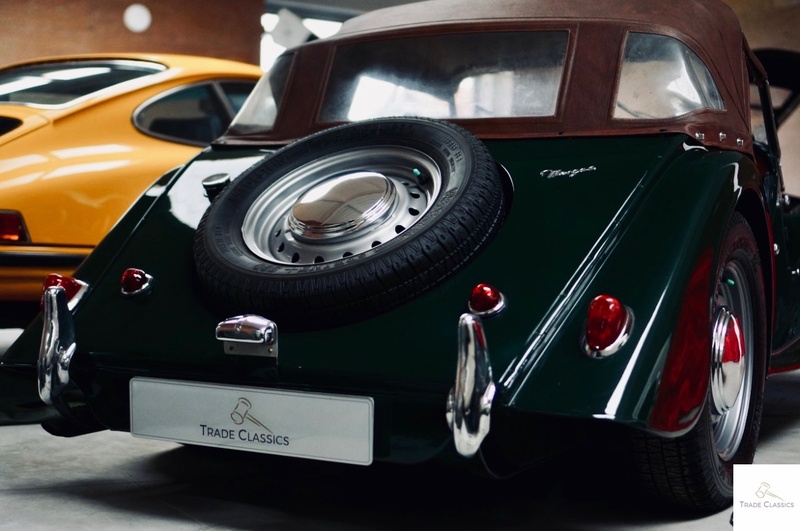 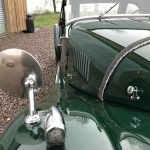 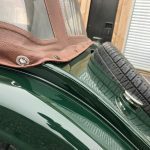 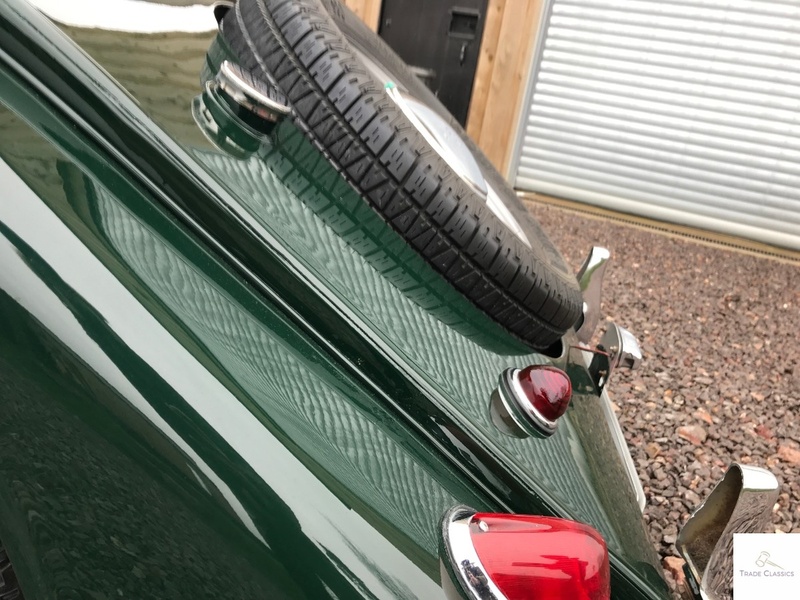 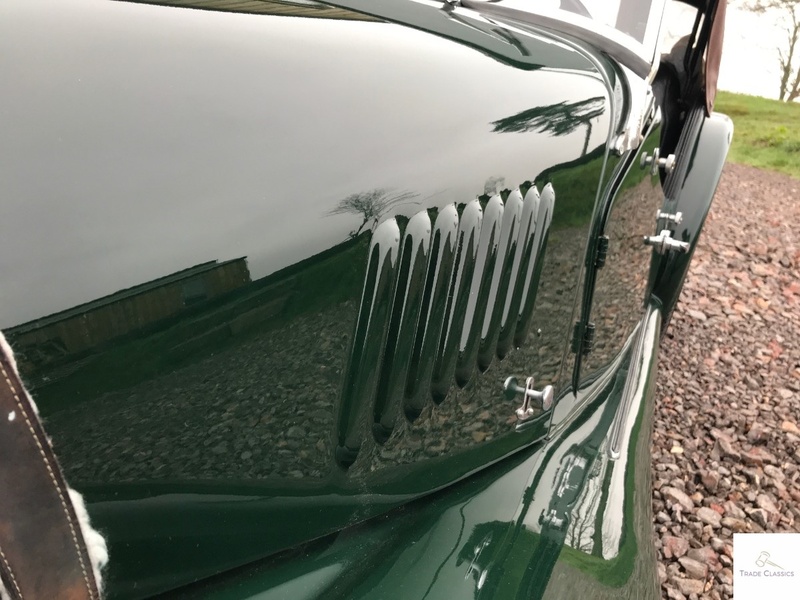 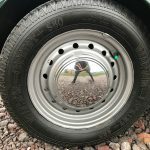 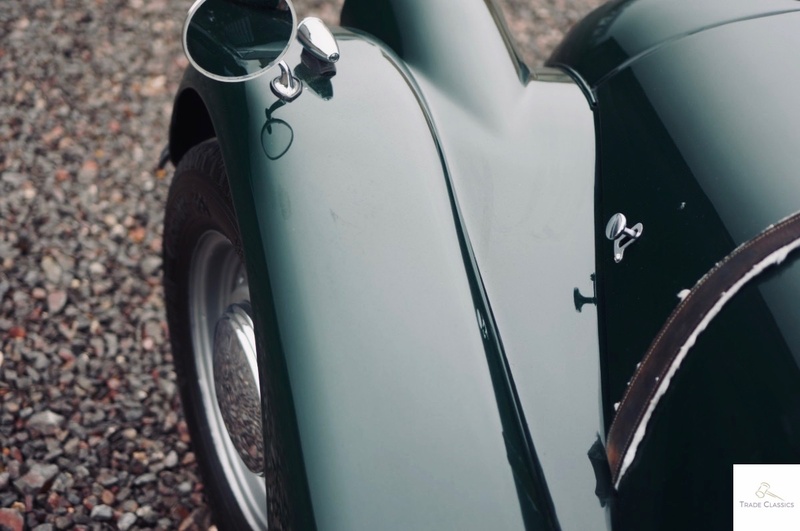 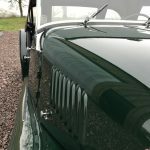 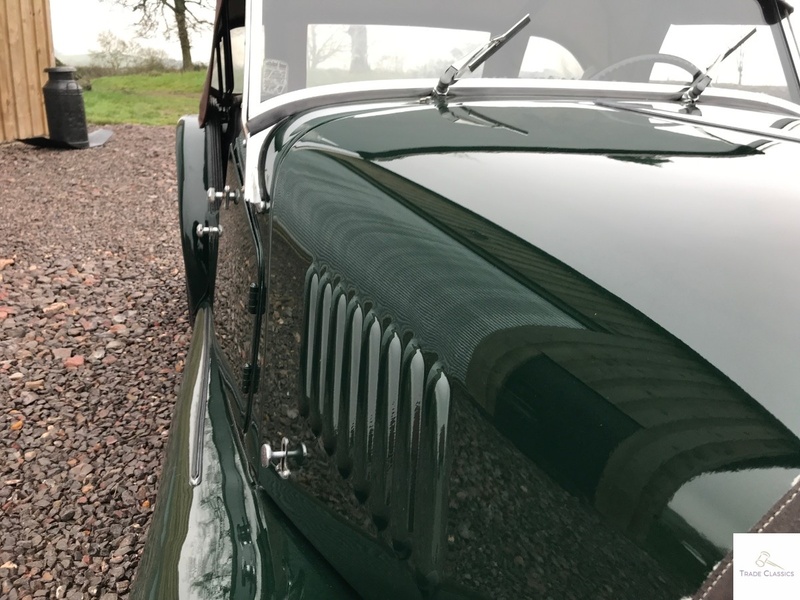 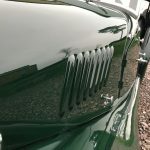 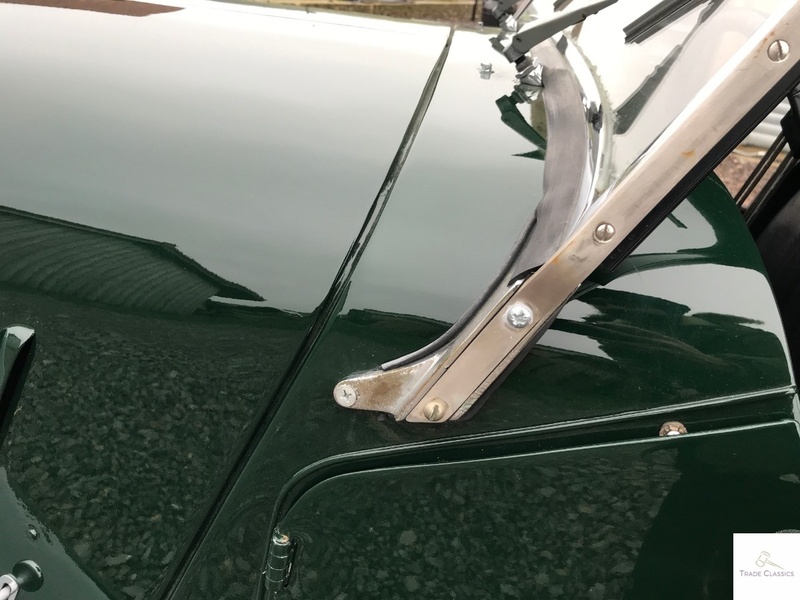 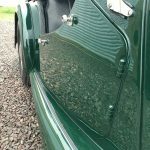 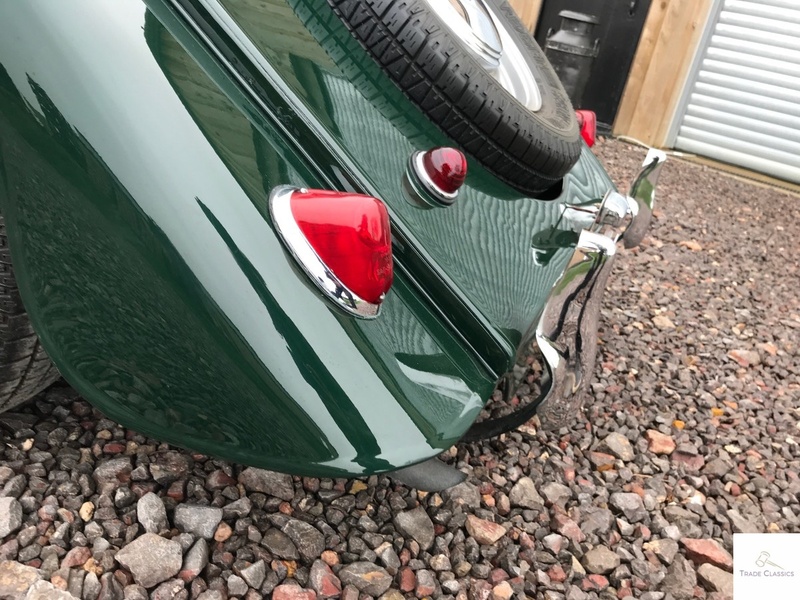 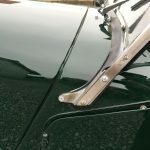 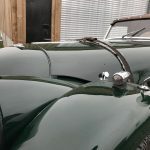 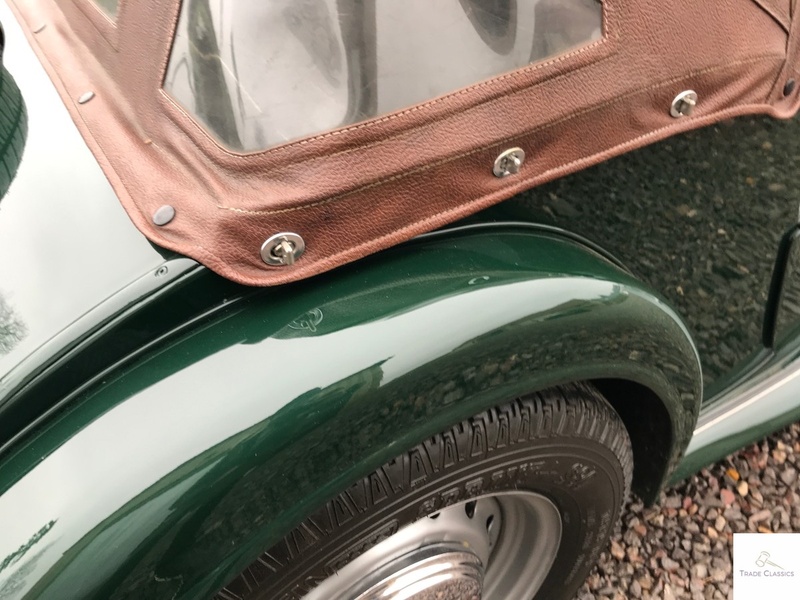 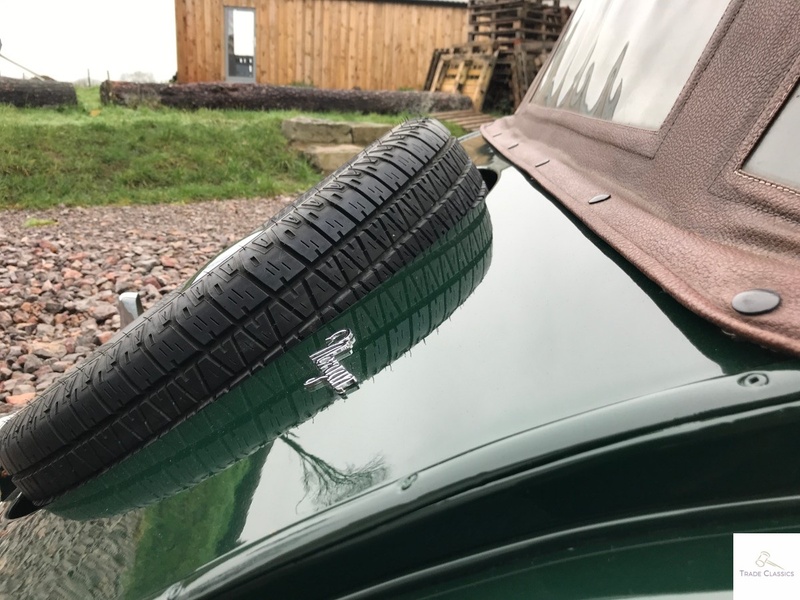 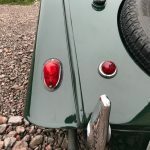 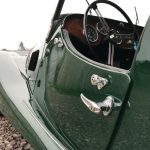 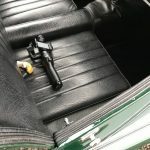 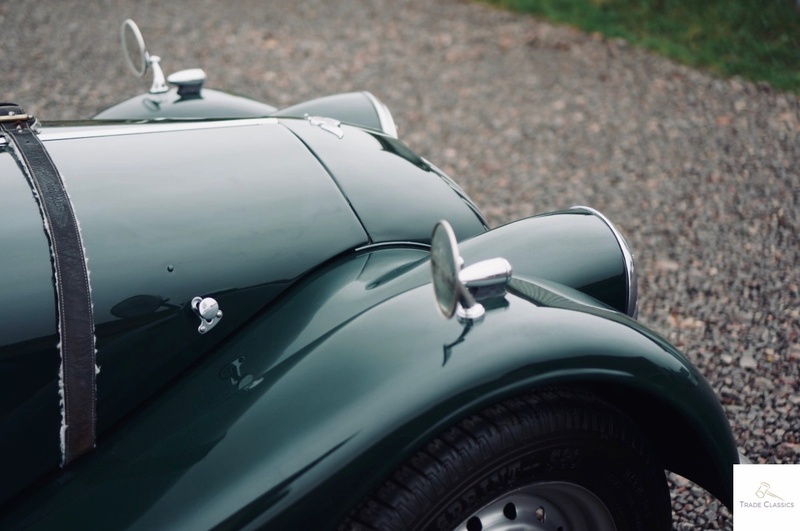 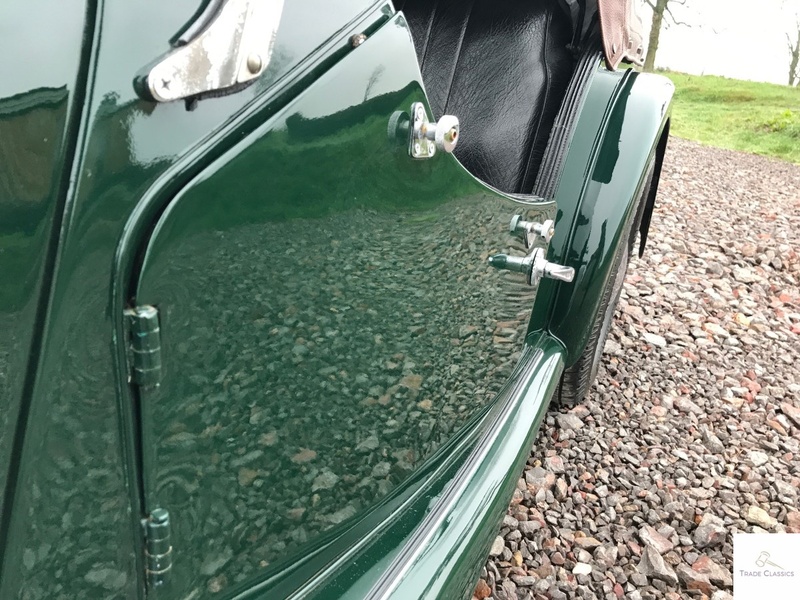 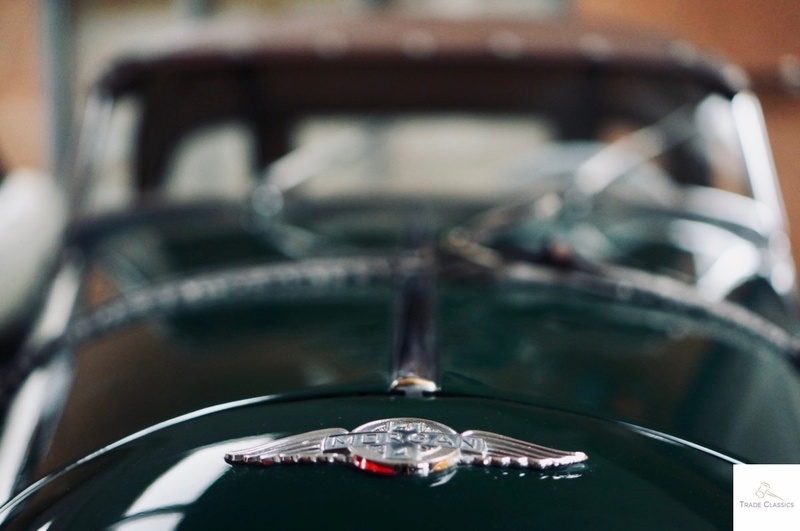 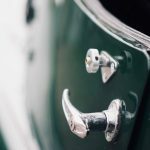 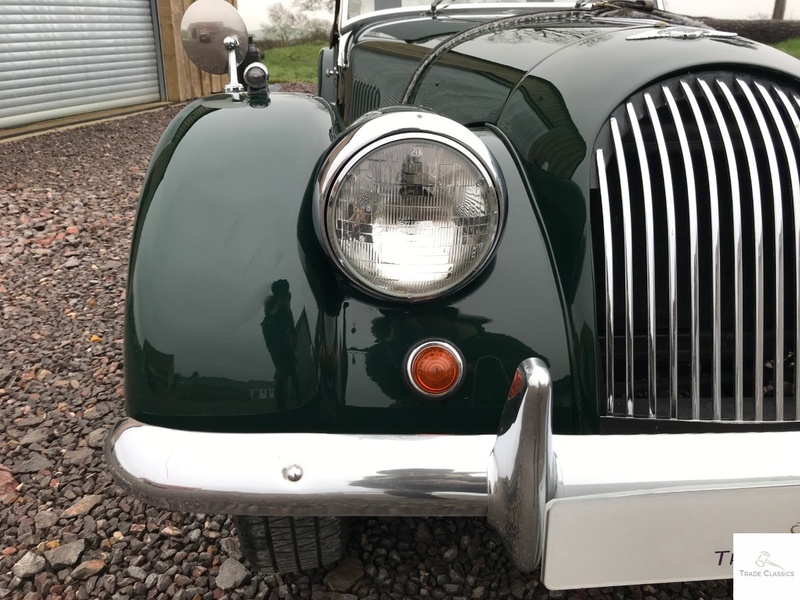 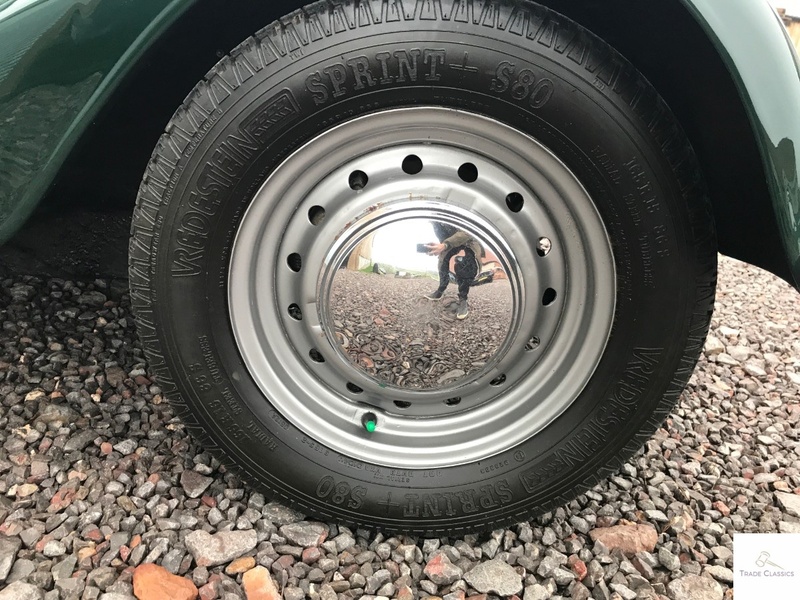 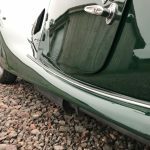 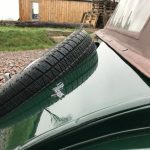 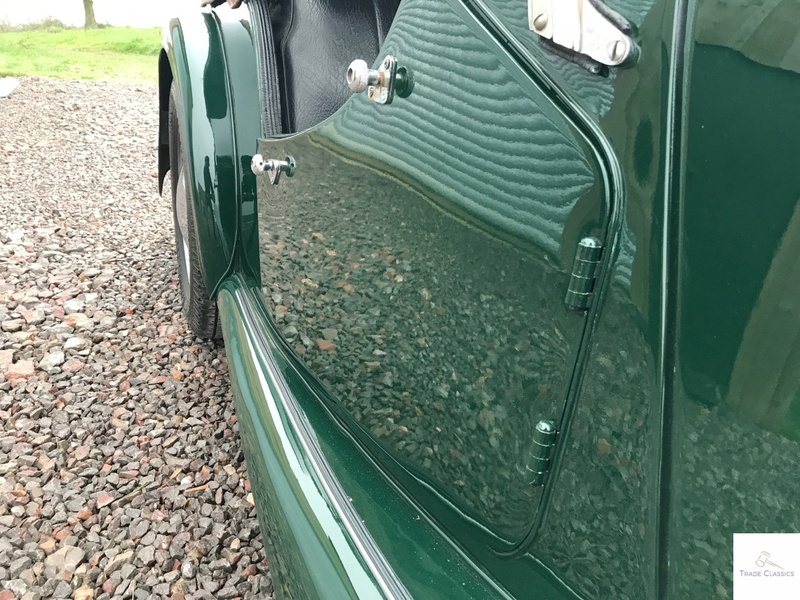 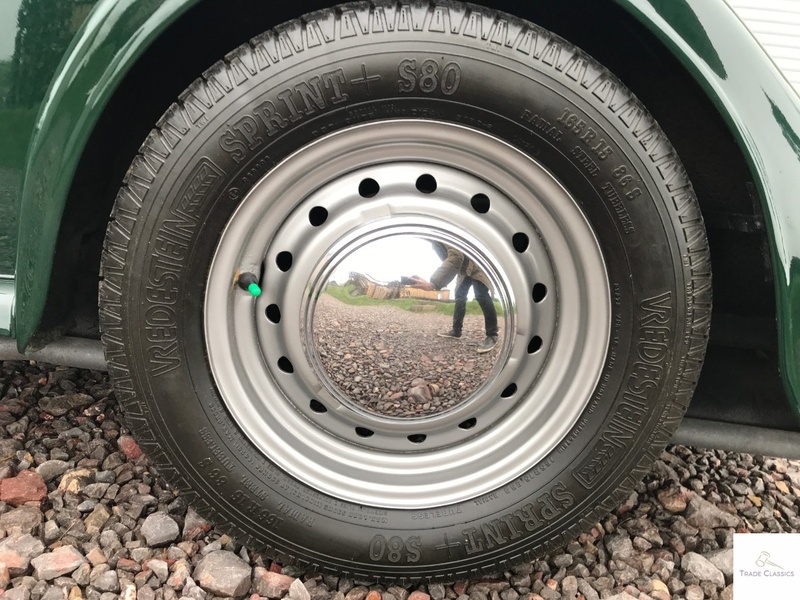 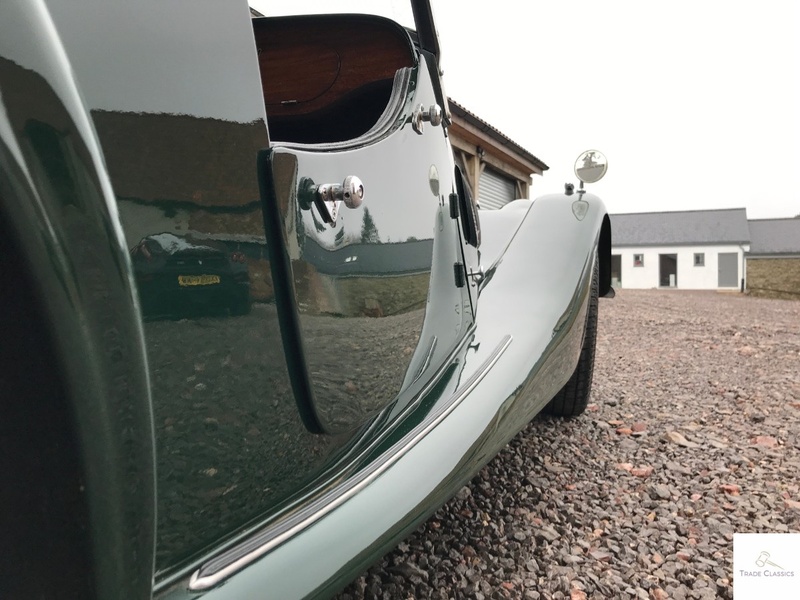 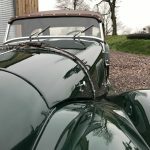 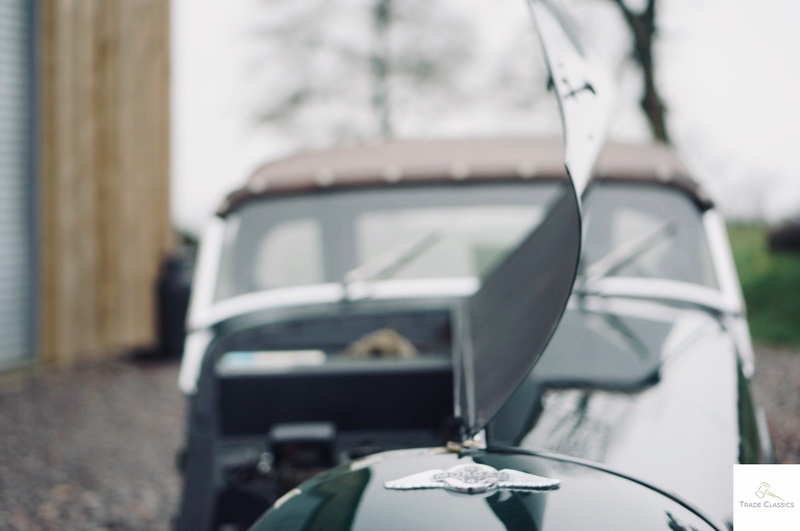 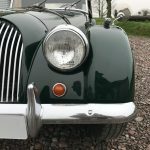 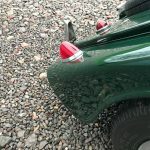 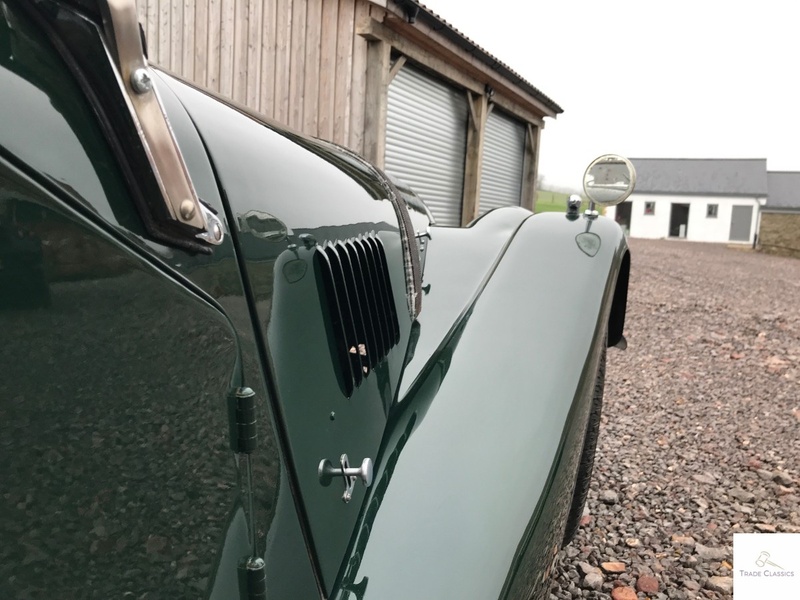 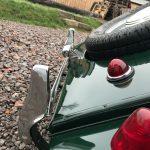 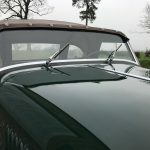 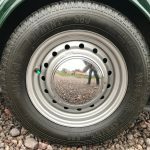 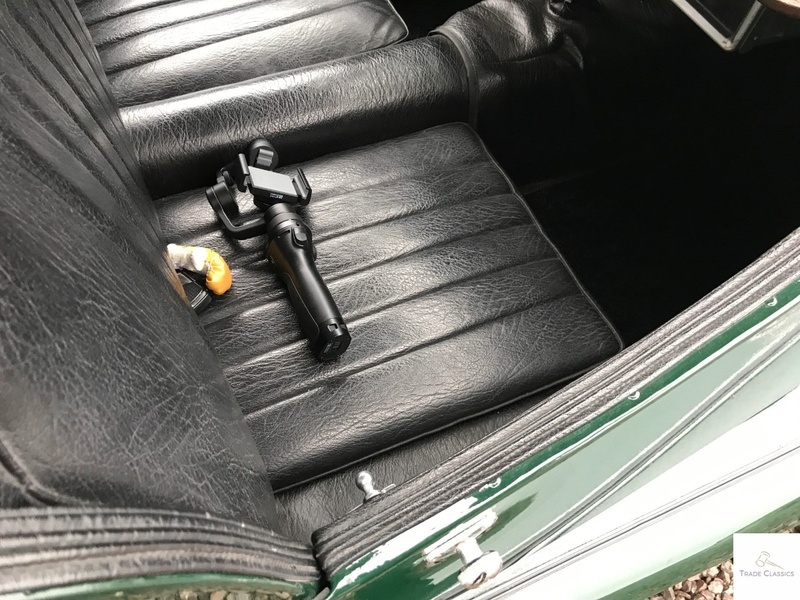 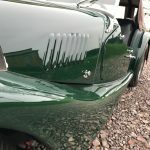 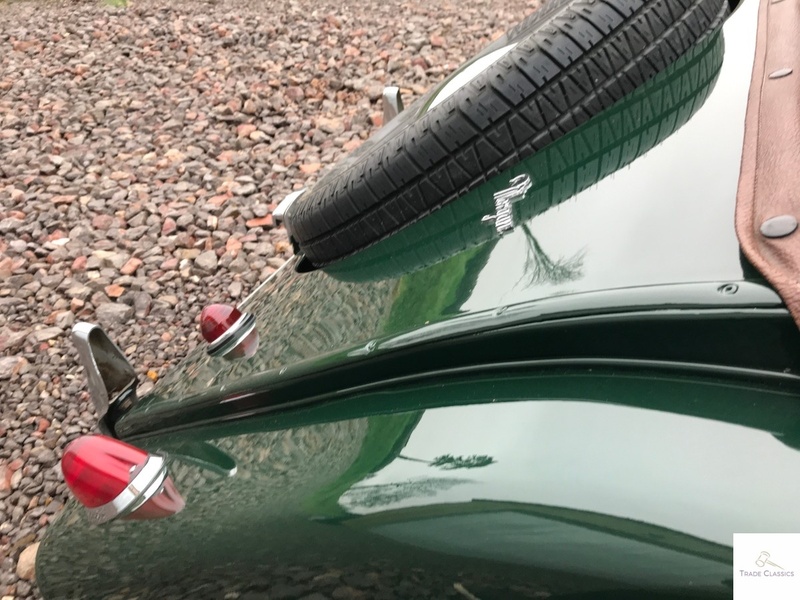 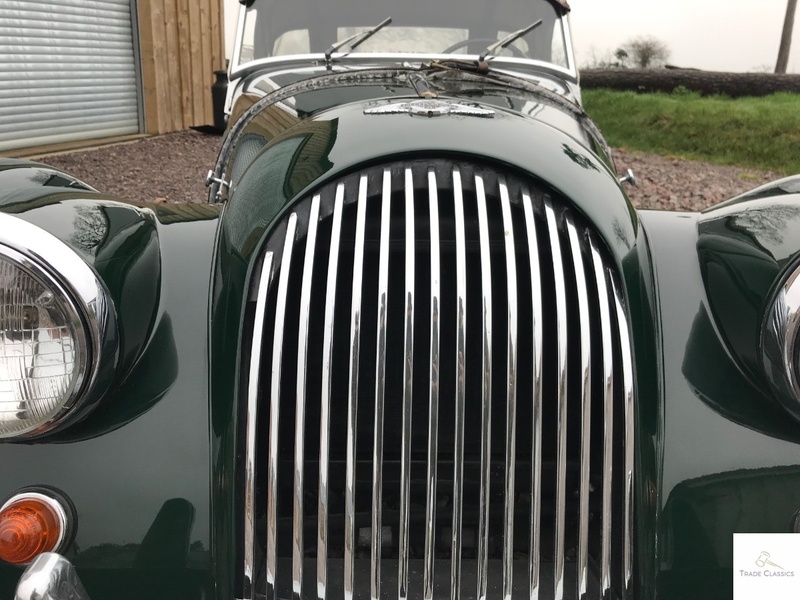 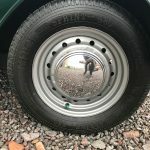 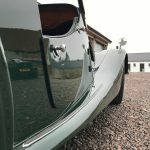 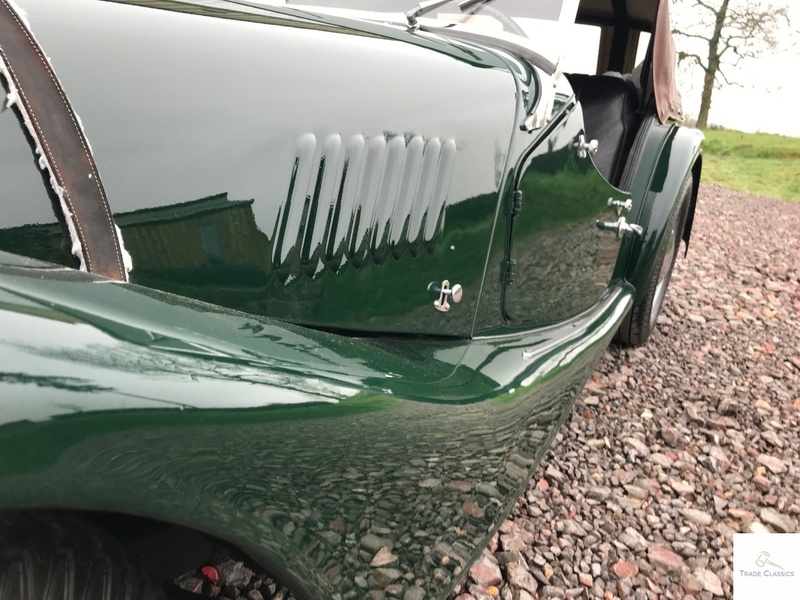 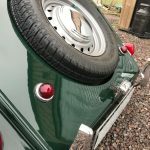 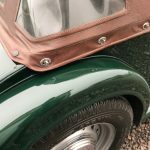 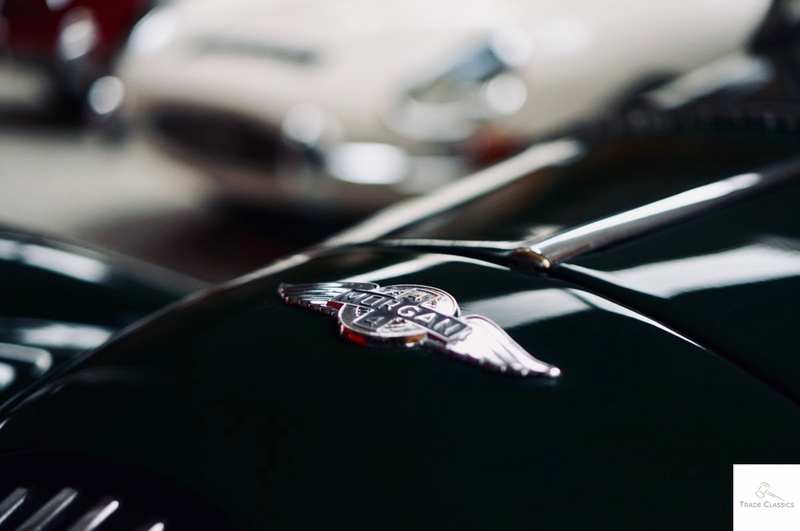 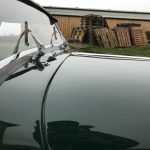 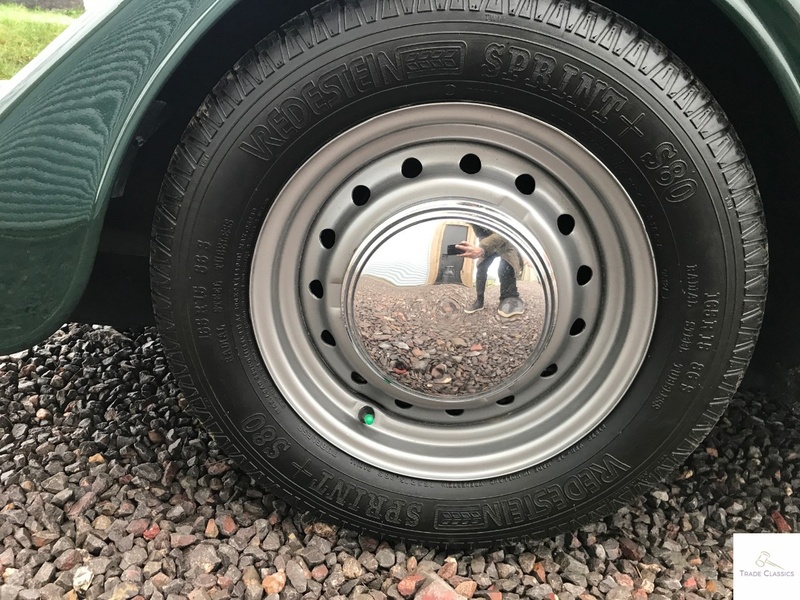 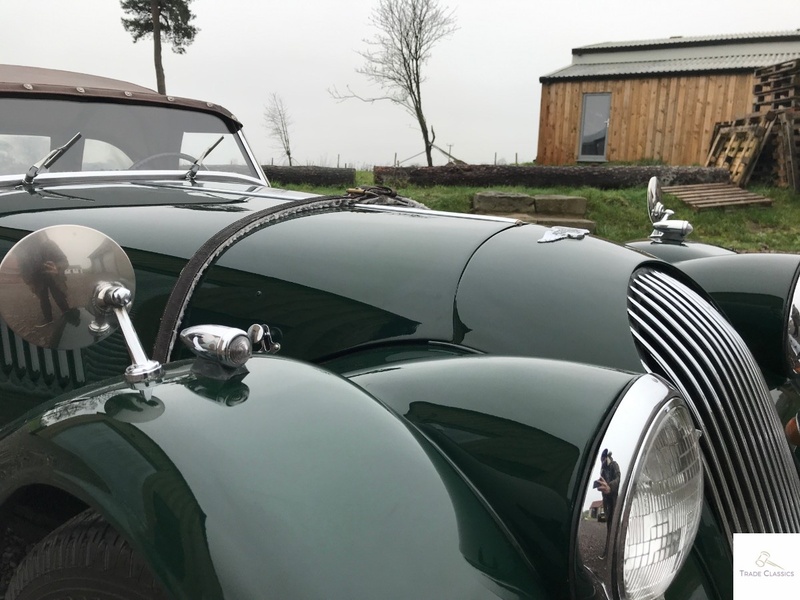 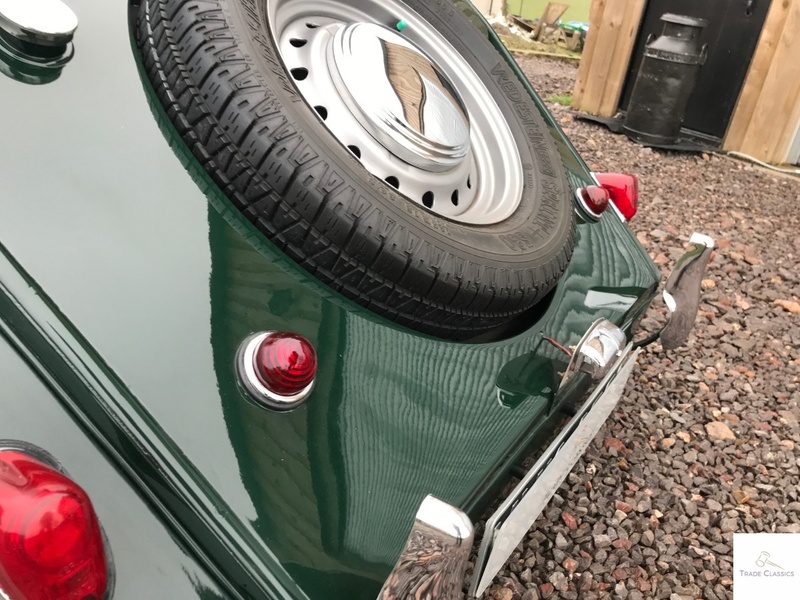 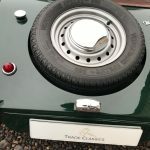 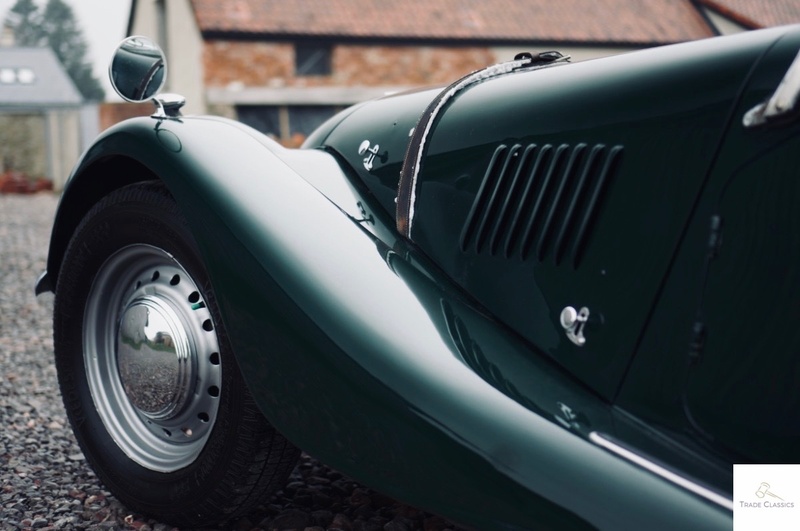 When Arun imported the car in to the UK, it suffered some damage to the British Racing Green paintwork, and so he commissioned for it to be repainted. 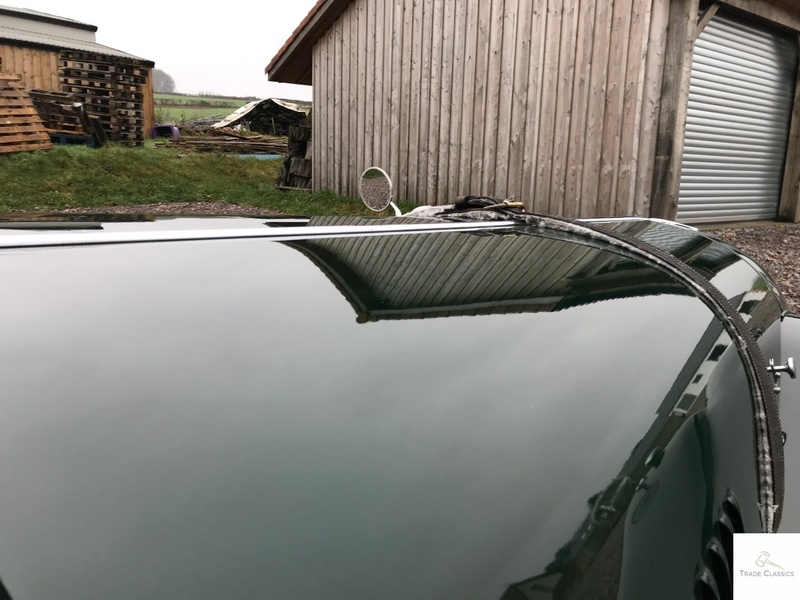 As such, the paintwork is even across the entire car, and we didn’t observe any damage or imperfections. 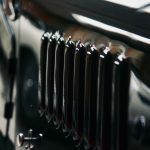 Take a look at the video for a complete review. 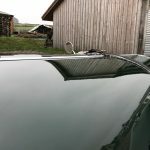 All the glass and trim on the car looked good. 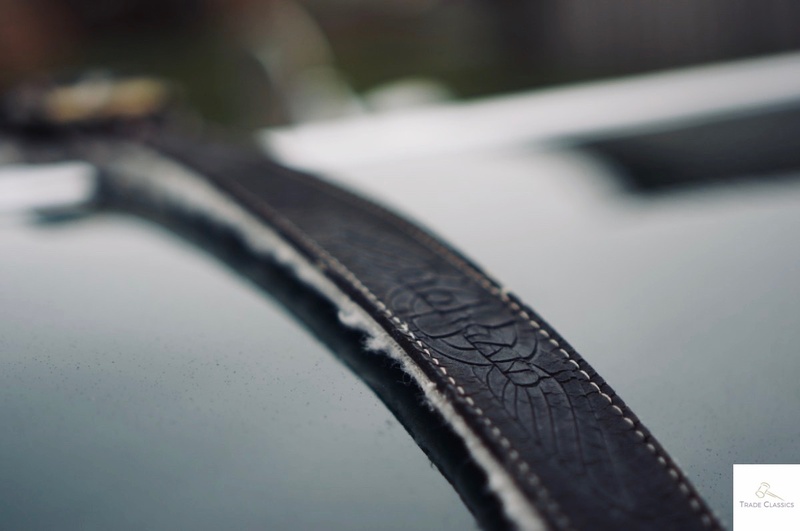 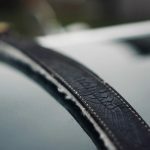 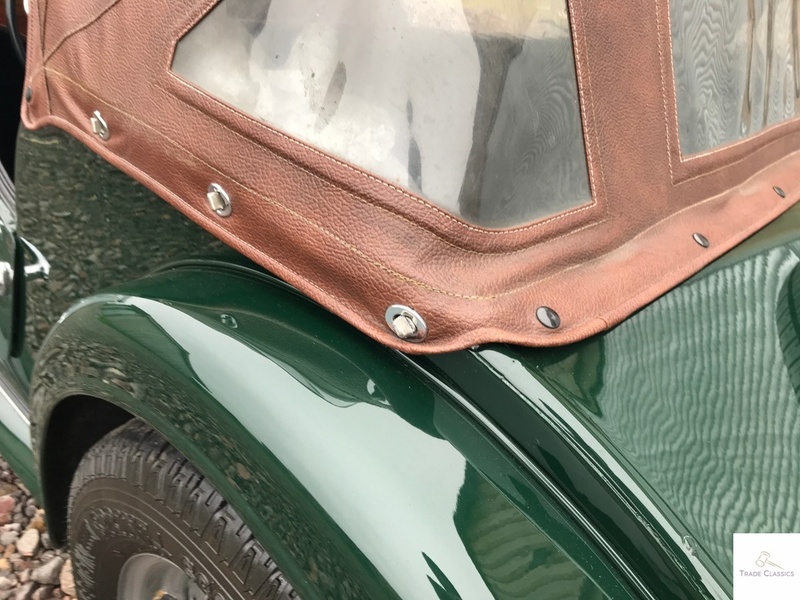 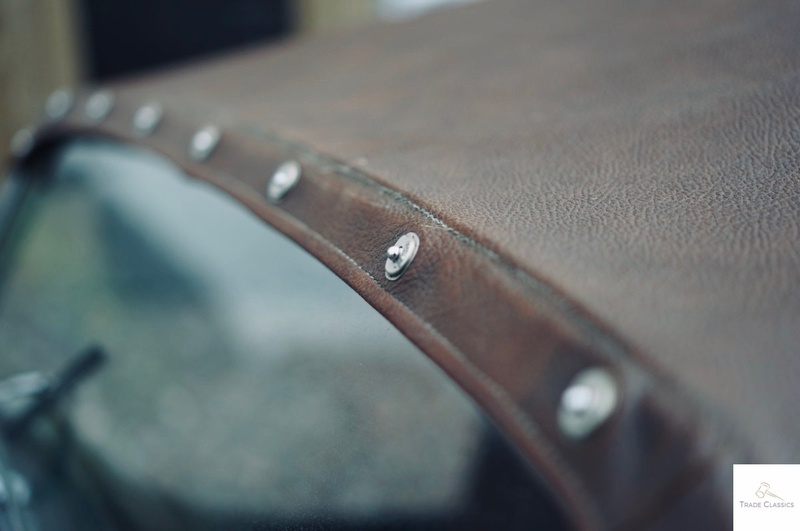 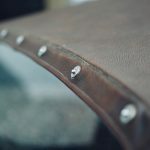 The leather hood had a nice patina to it as pictured in the images. 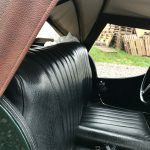 Black leather and black carpets with some wood thrown in, as you would expect with a Morgan. 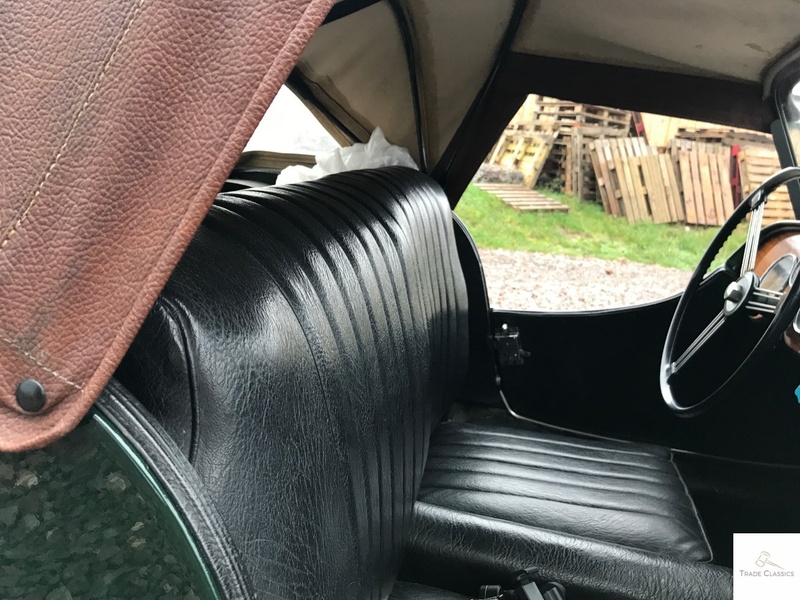 The interior on this car is simple, the very nature of this car is more about enjoying the outside. 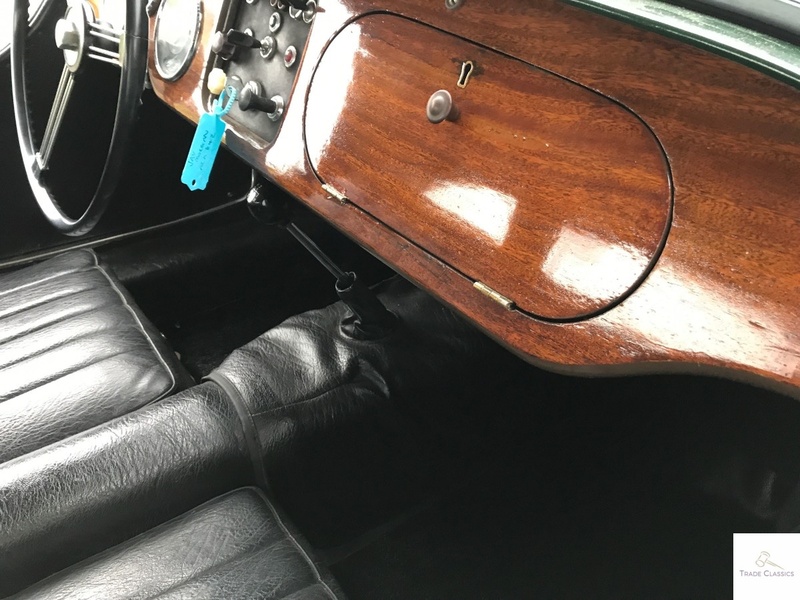 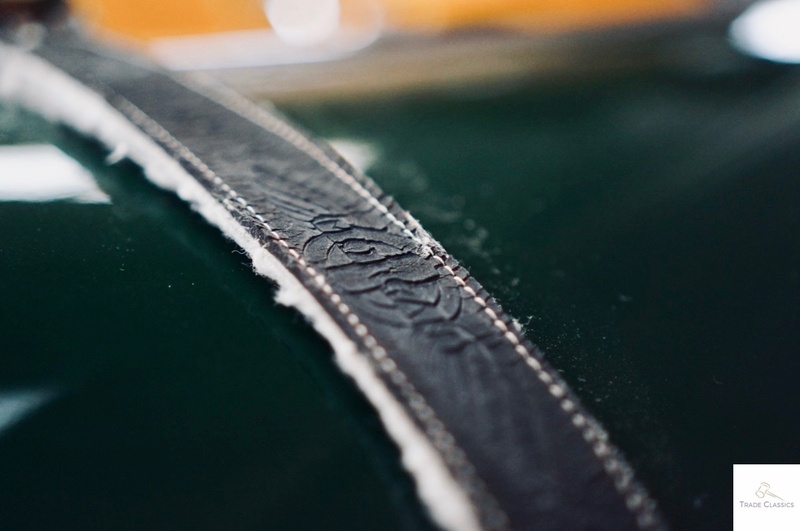 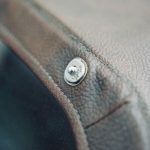 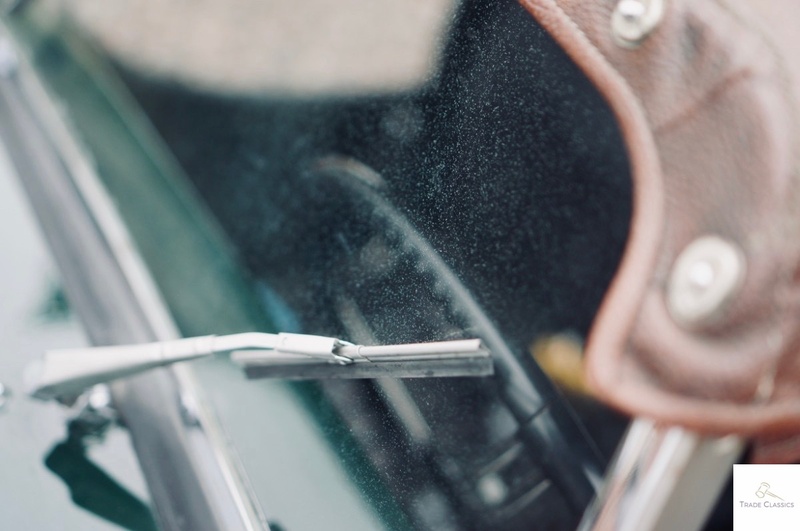 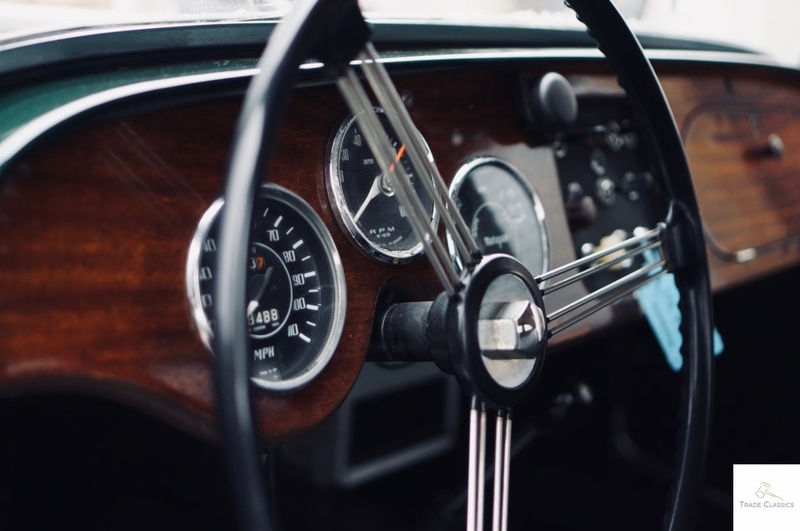 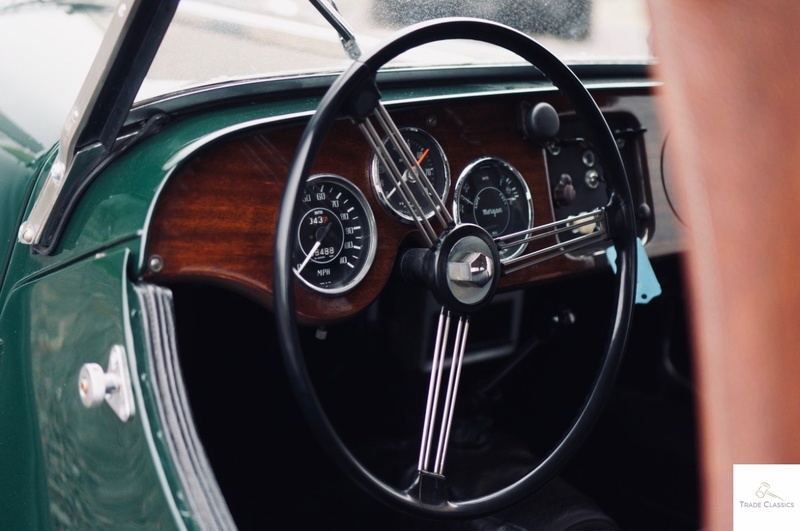 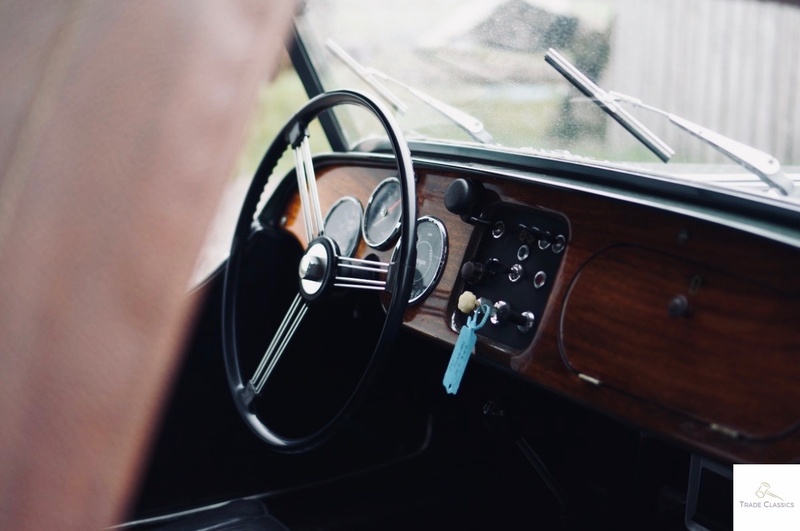 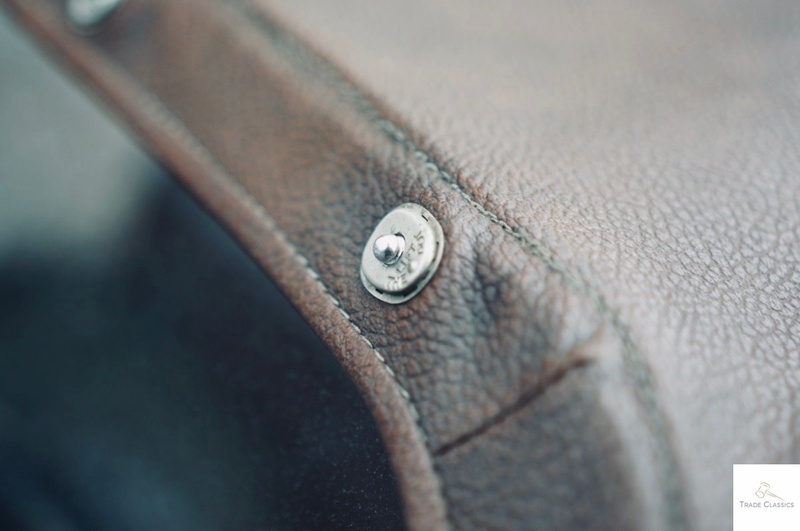 The leather seats show no major wear or tear, just looking as you would expect of a car from 1969. 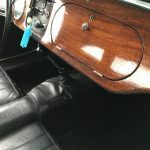 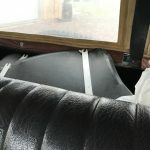 Carpets and other trim follow a similar suit in the cabin. 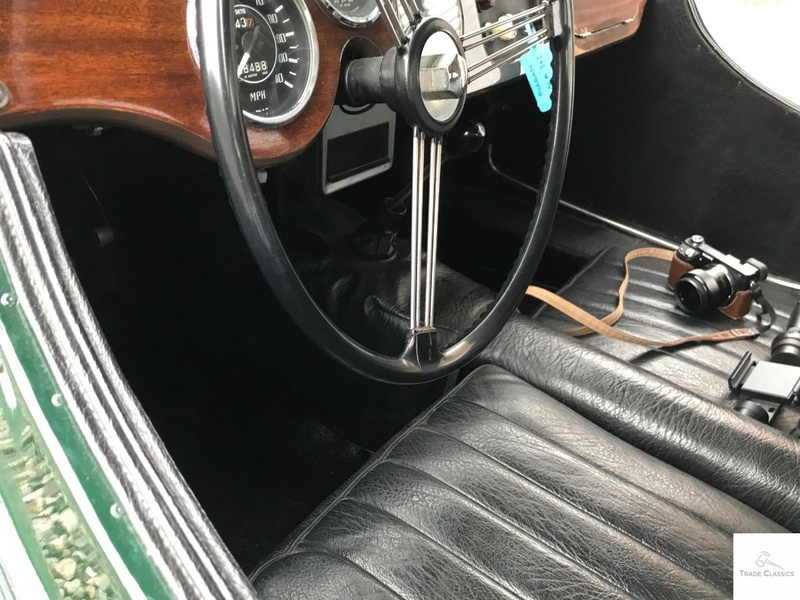 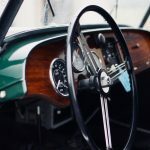 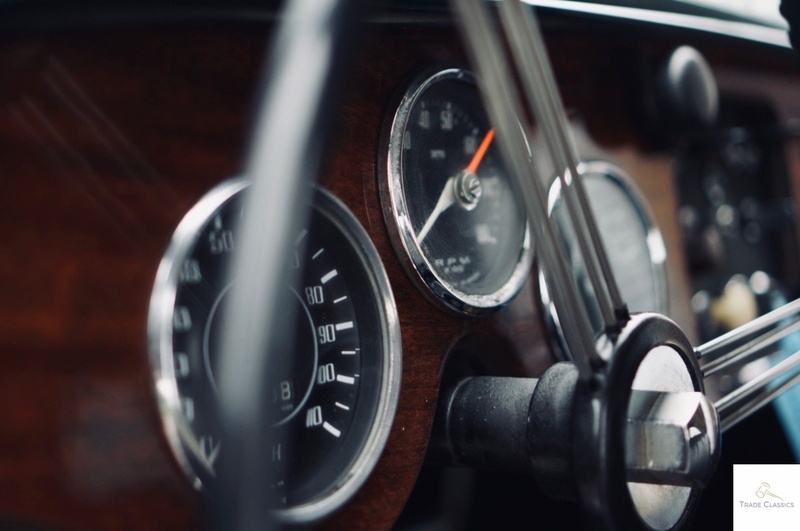 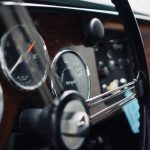 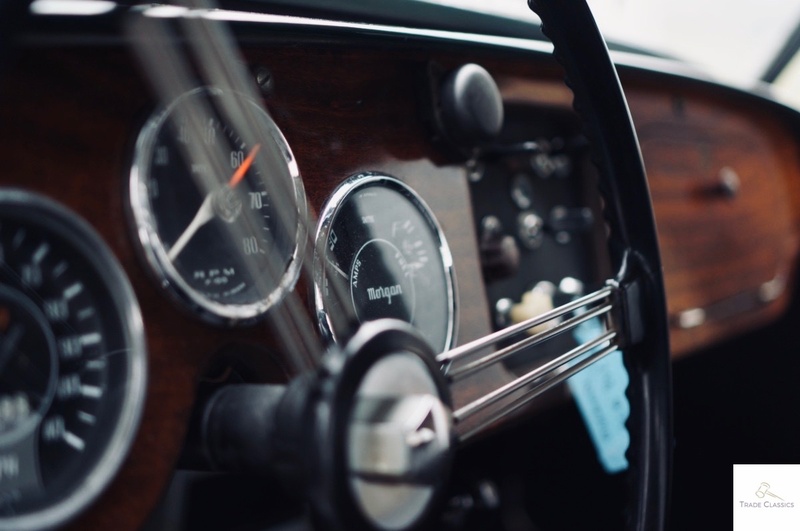 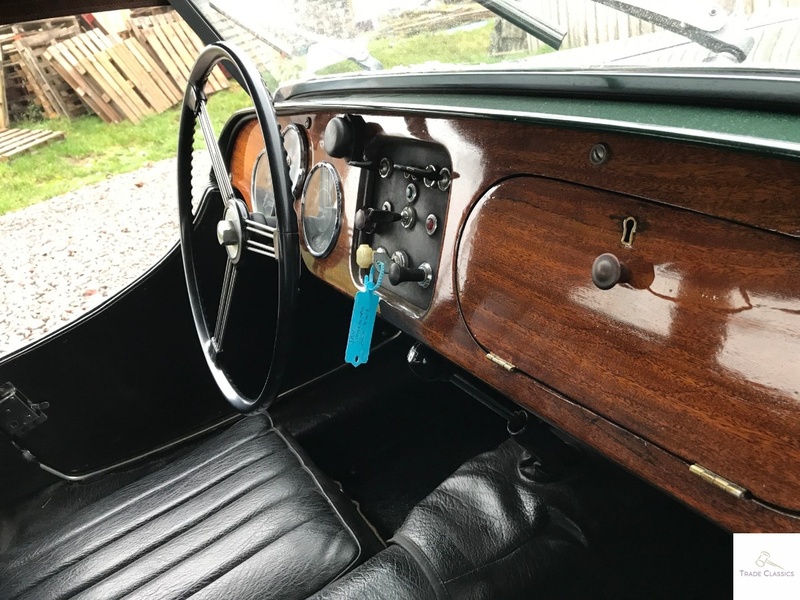 A lovely little dashboard, with the dials set in wood. 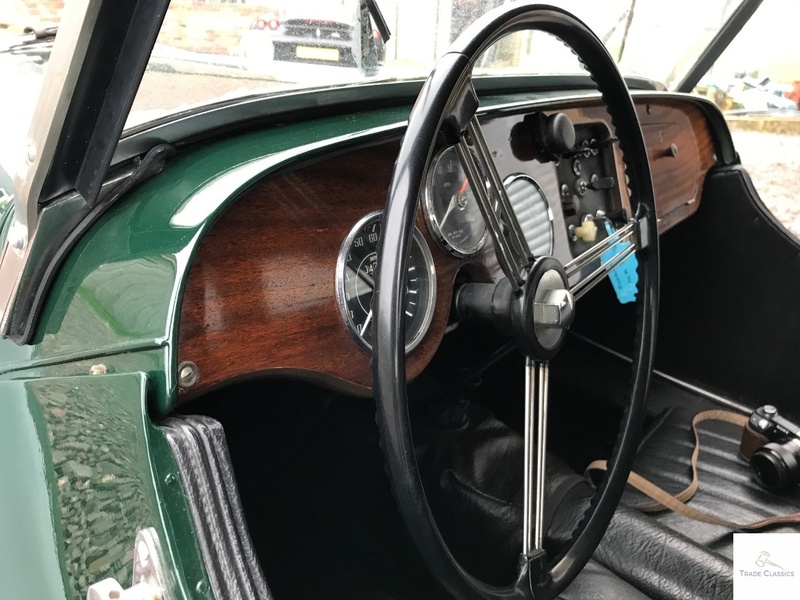 The look in great condition, very legible, and the wooden dashboard also looking great. 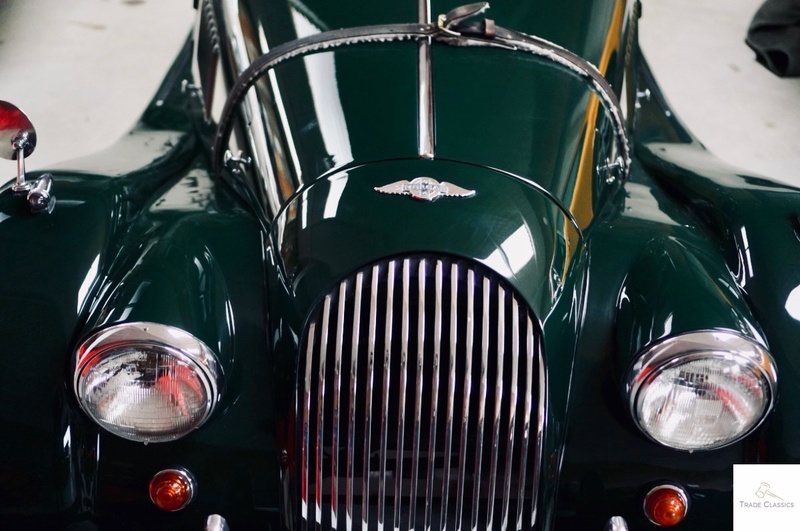 Watch the video to see the detail. 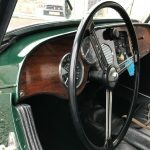 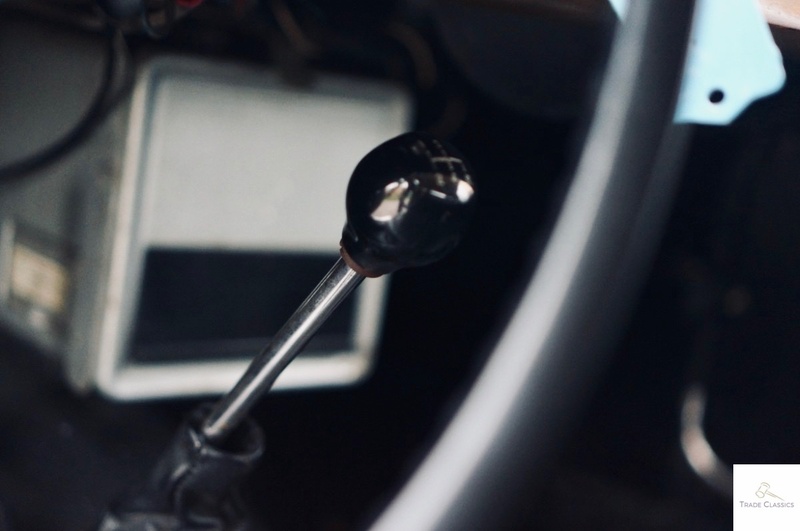 The steering wheel and gear stick are finished in a combination of black plastic and steel. 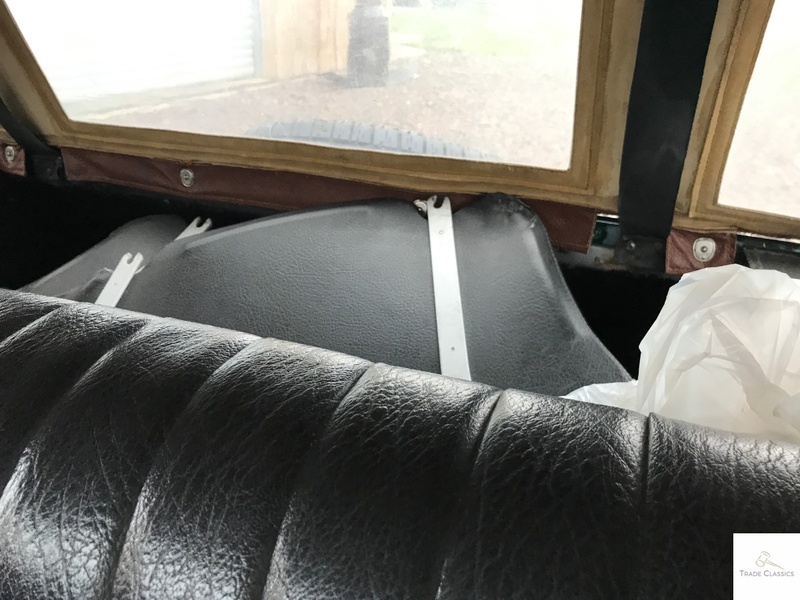 They both look great and in line with the age of the rest of the cabin. 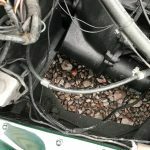 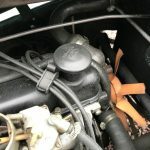 The car started from cold, after a few tries to get fuel in to the system, having not been used for some time. 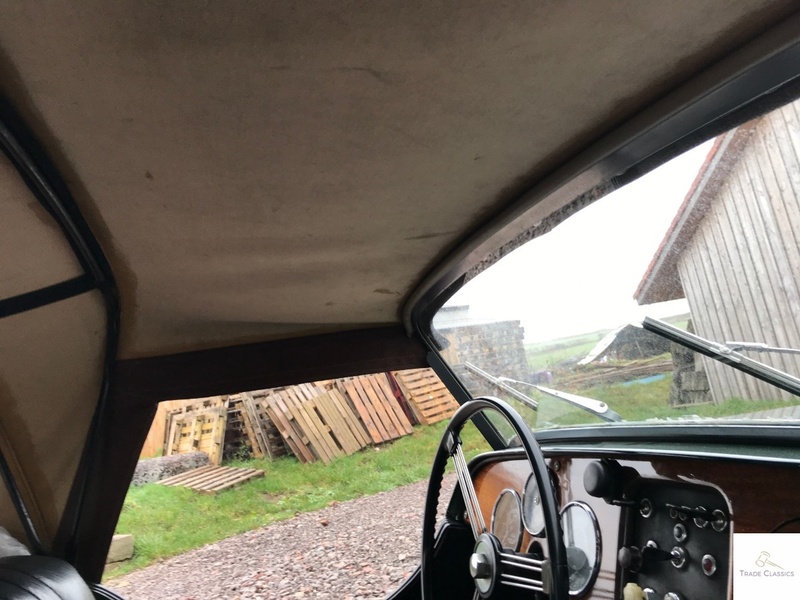 Arun drove the car around the local land, reversing in to the garage to show a basic test of the car running. 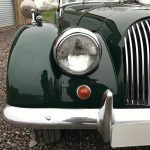 Arun assures us that the car performs as you would expect for a Morgan 4/4. 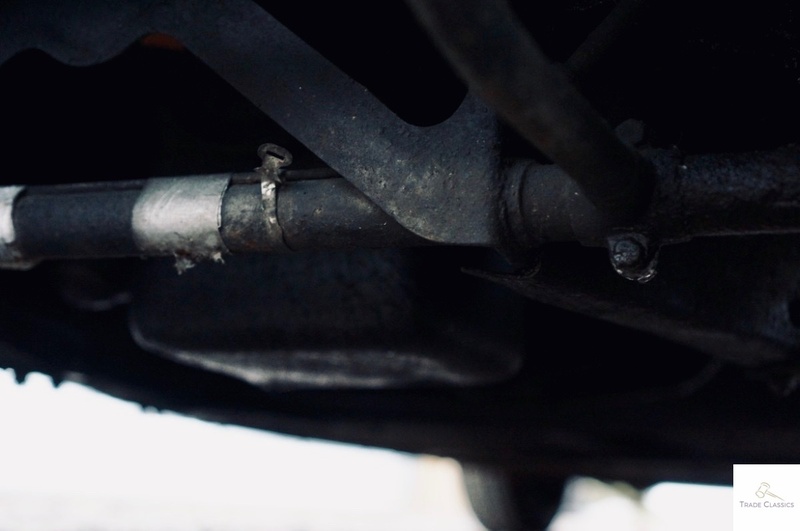 Arun informs us that everything is working on the car as it should. 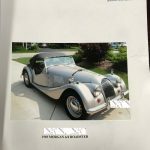 Arun acquired this car with the help of his uncle, with the car coming from a friends estate after they passed away. 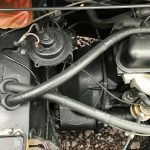 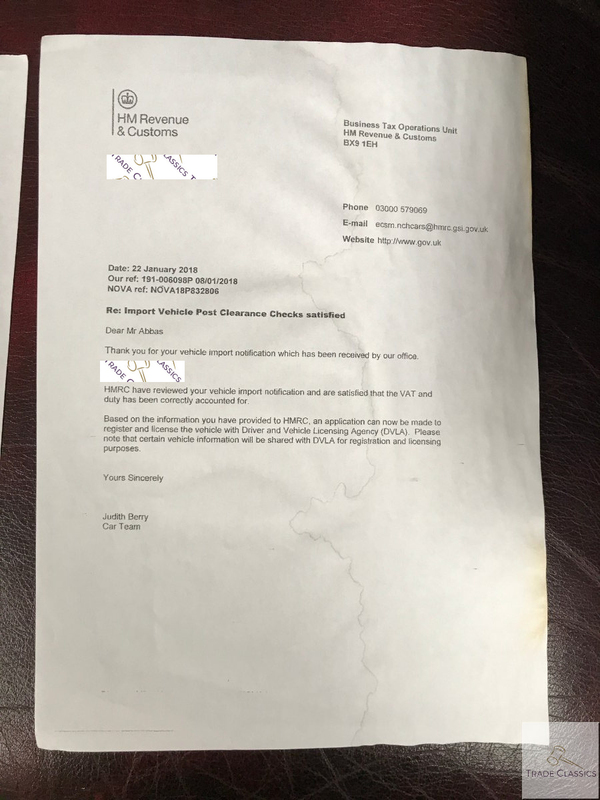 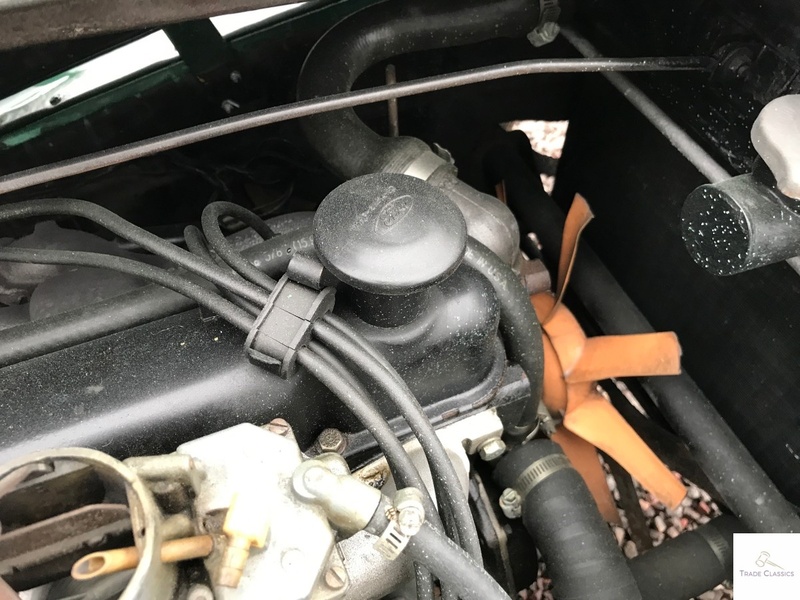 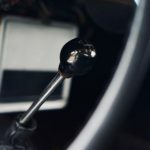 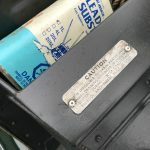 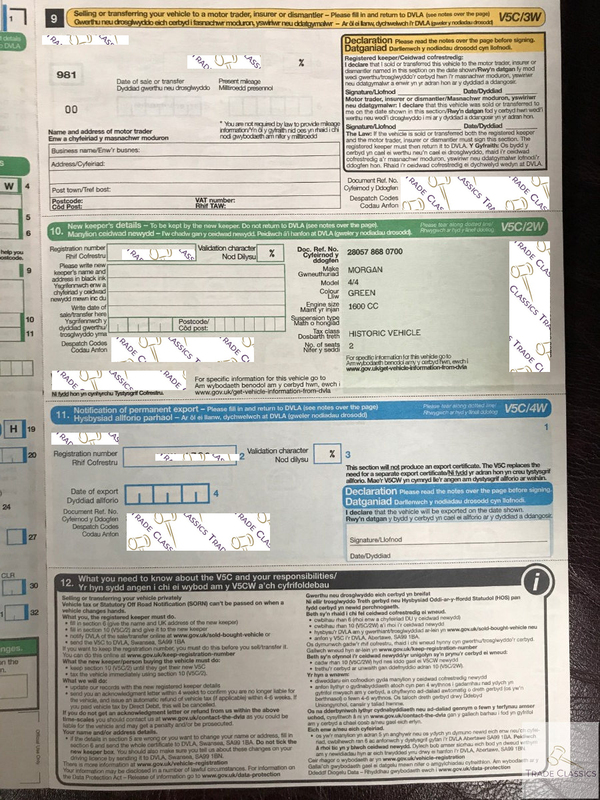 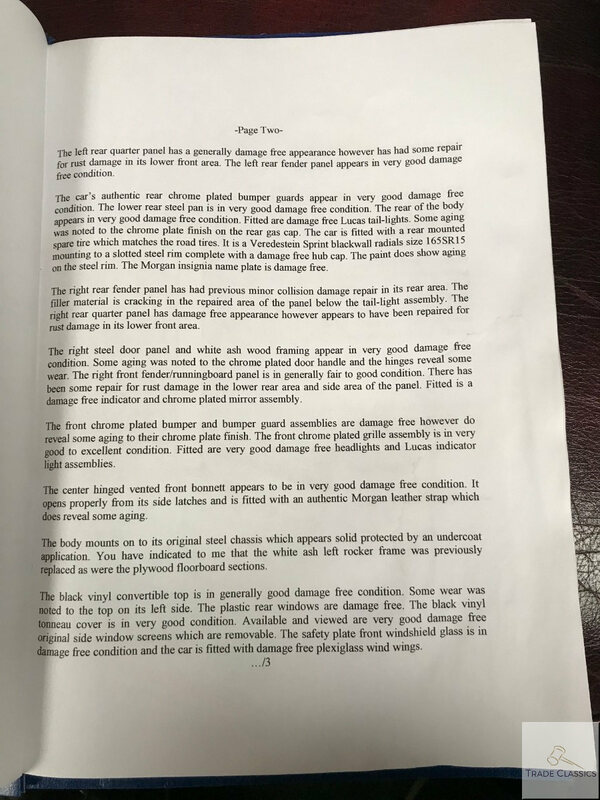 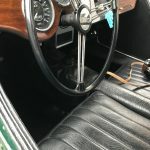 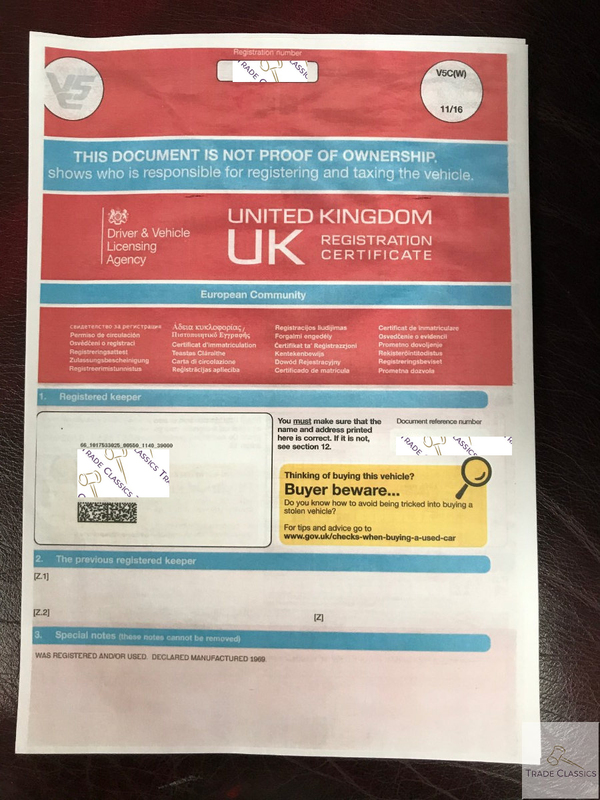 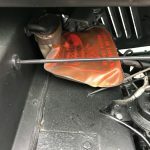 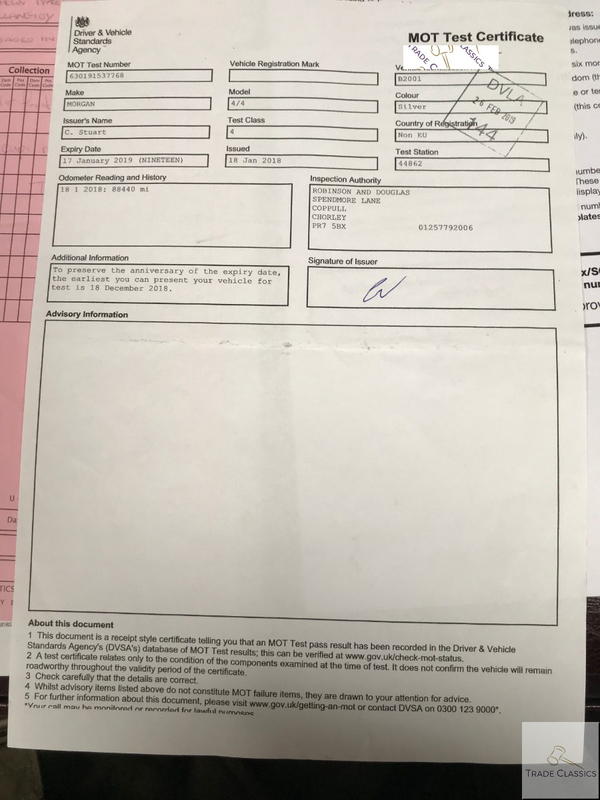 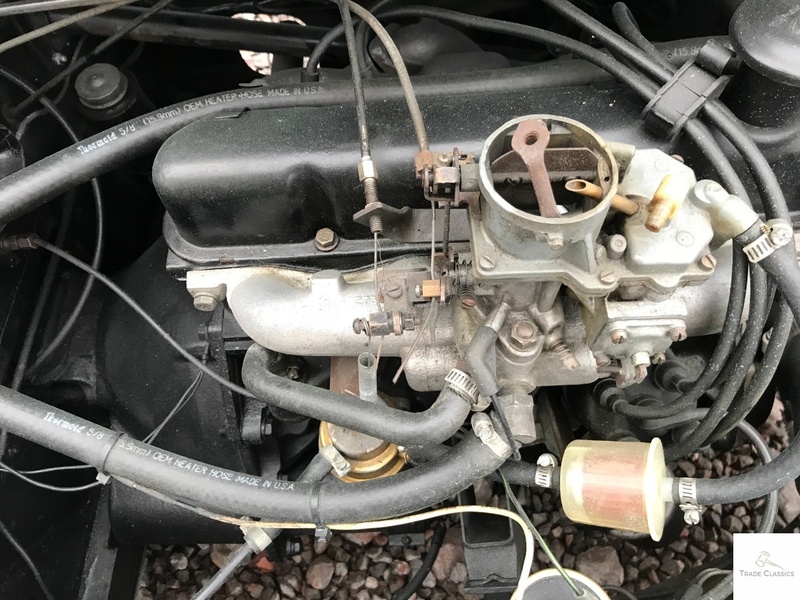 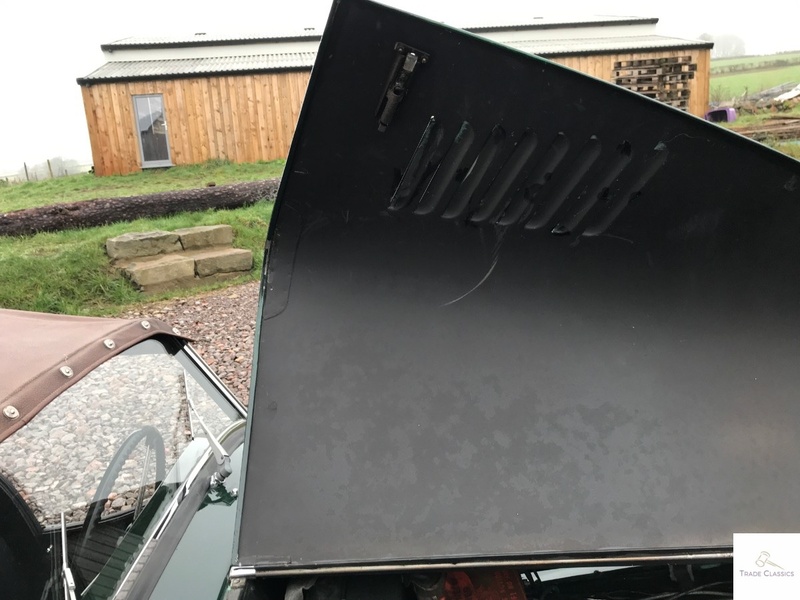 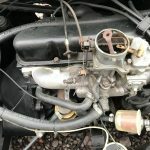 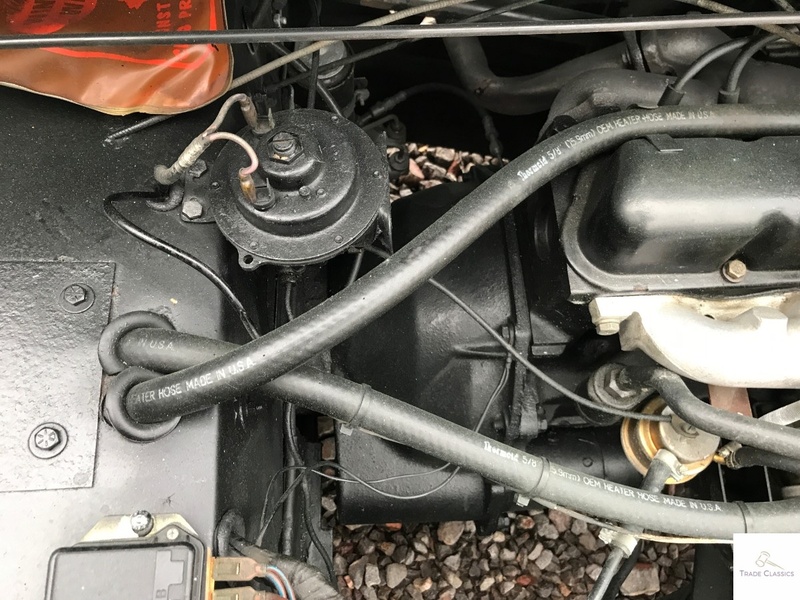 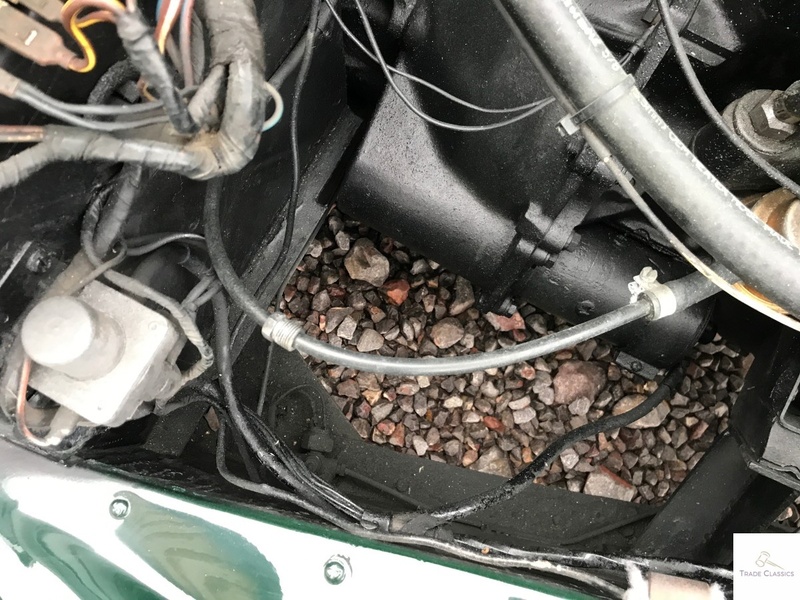 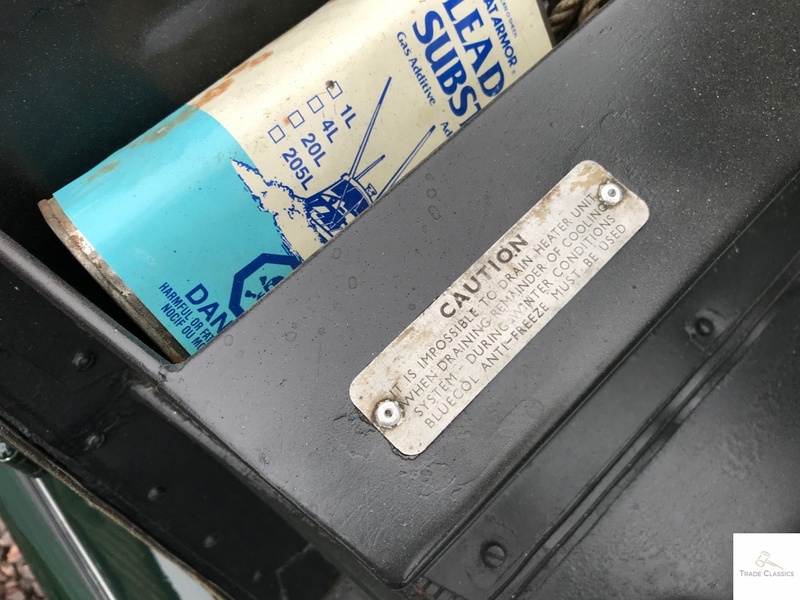 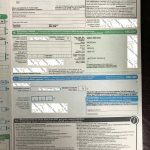 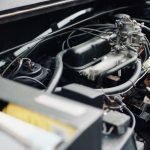 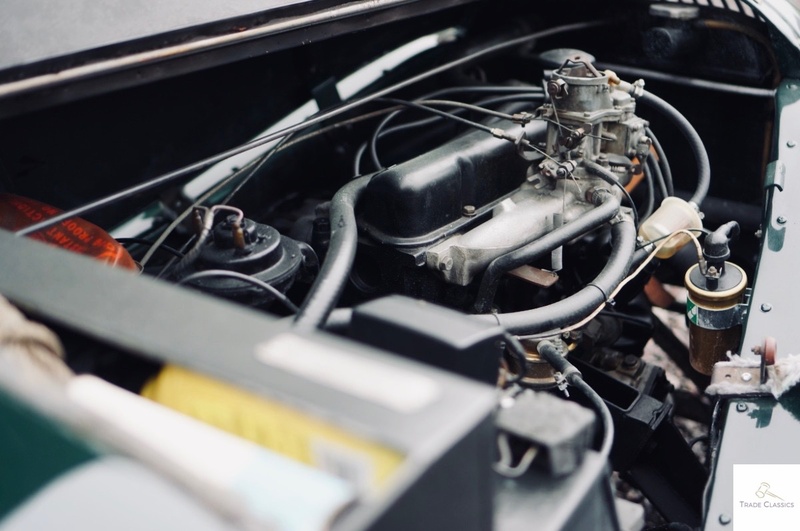 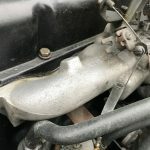 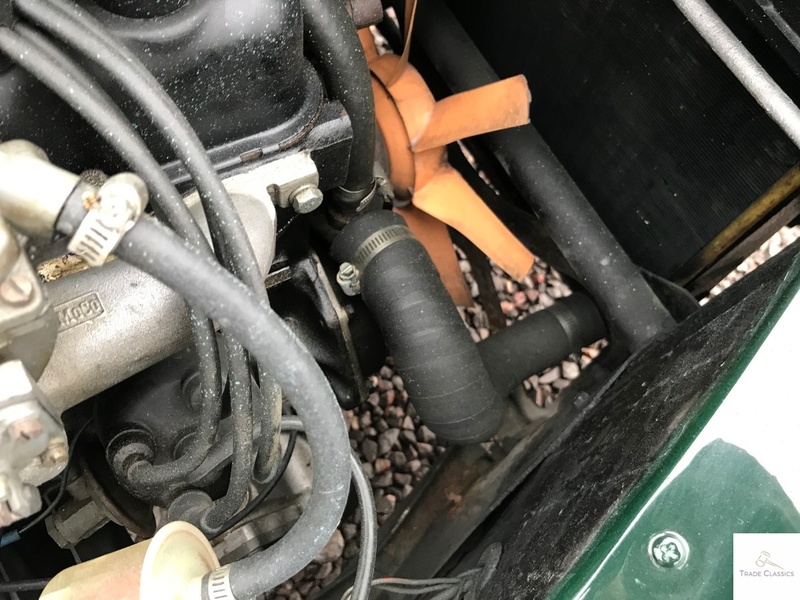 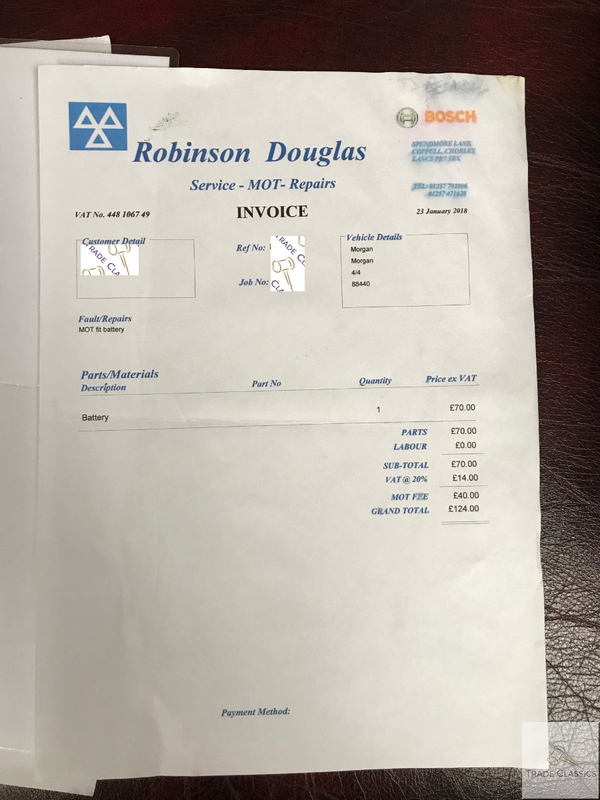 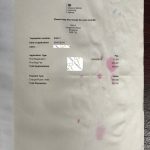 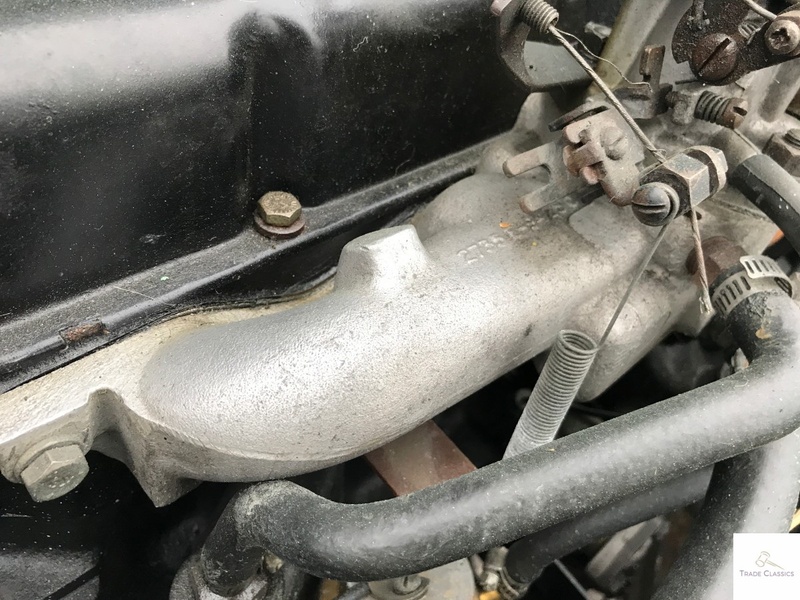 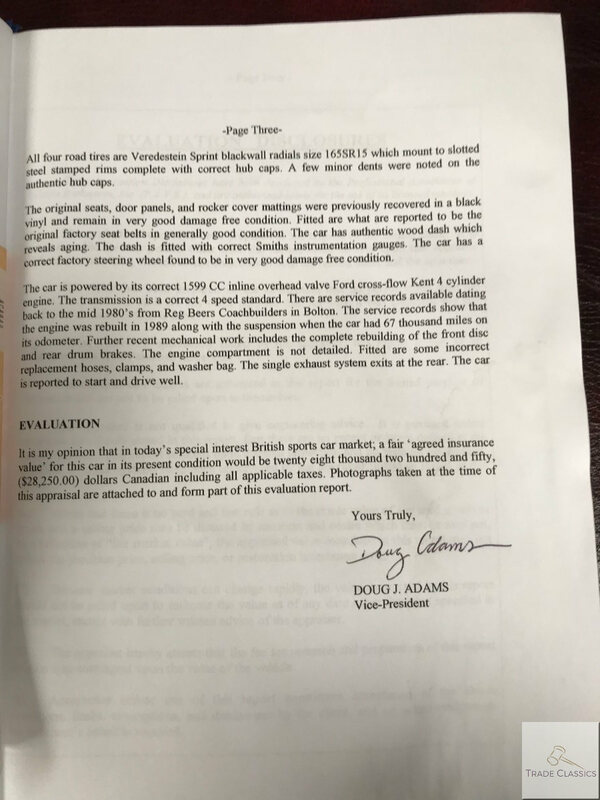 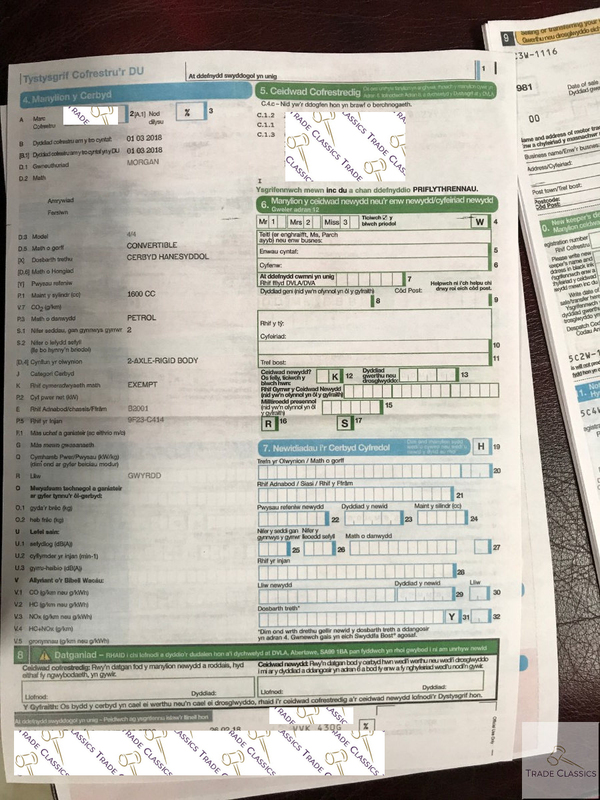 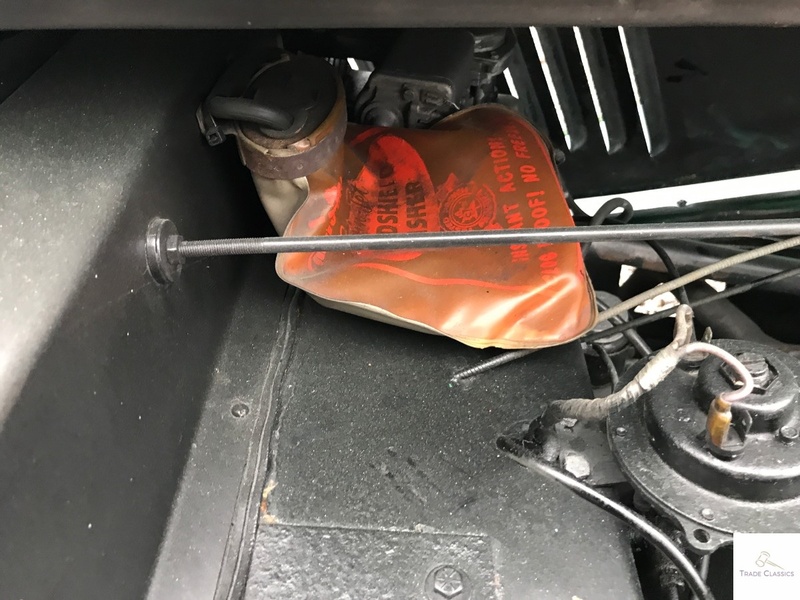 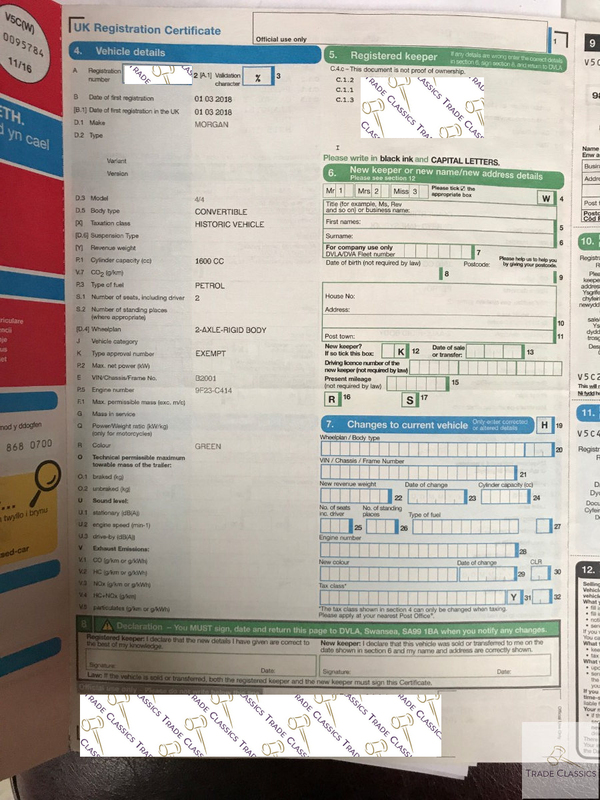 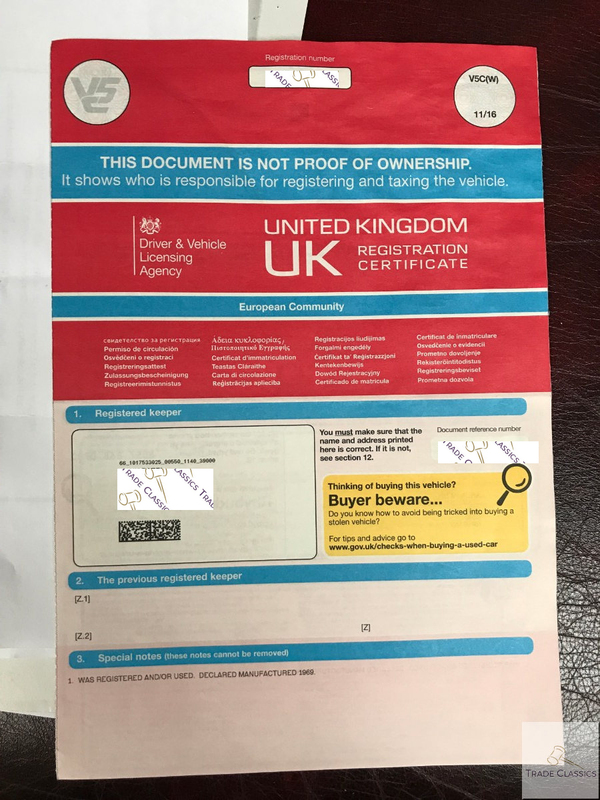 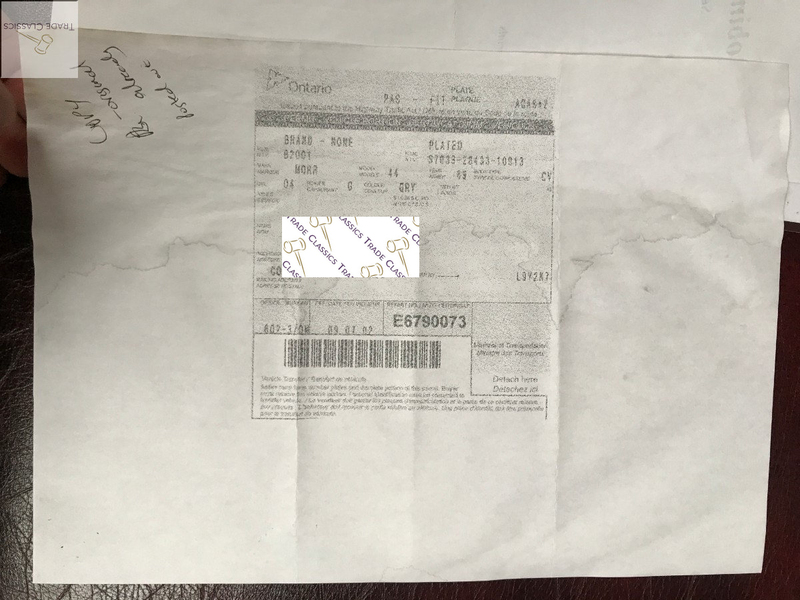 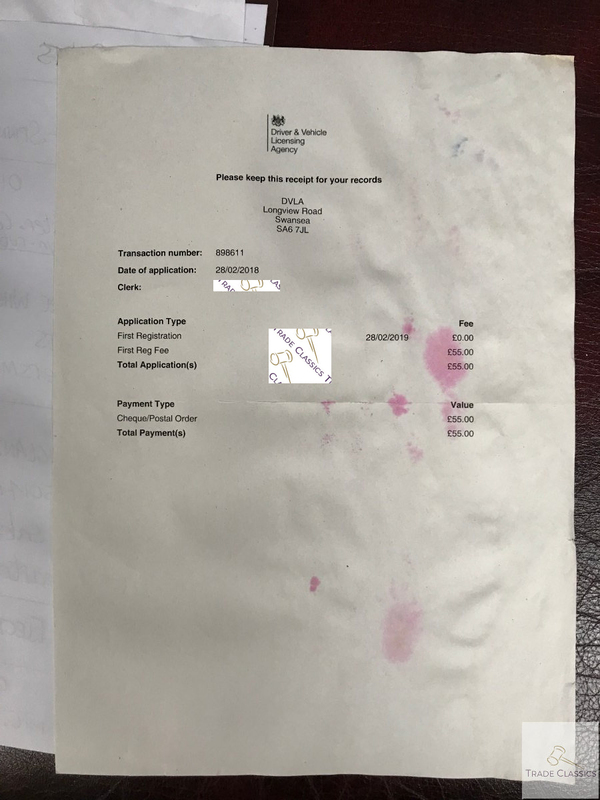 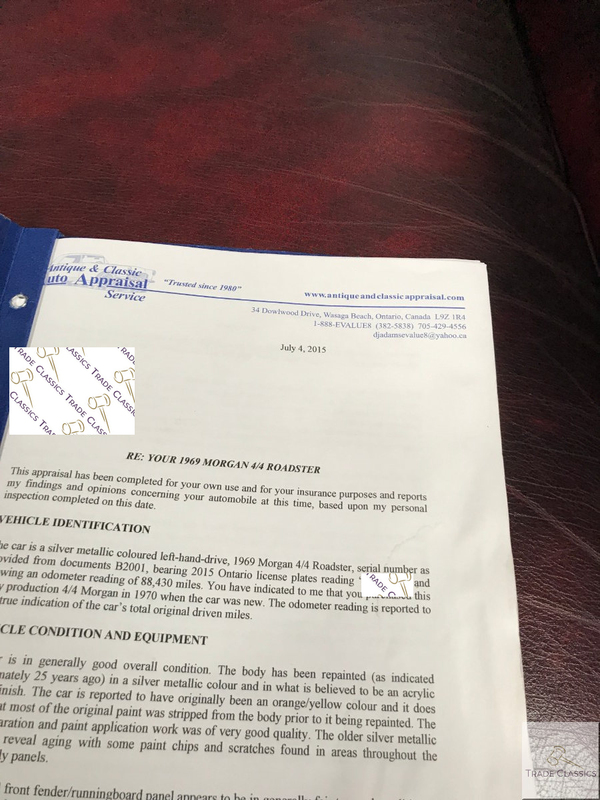 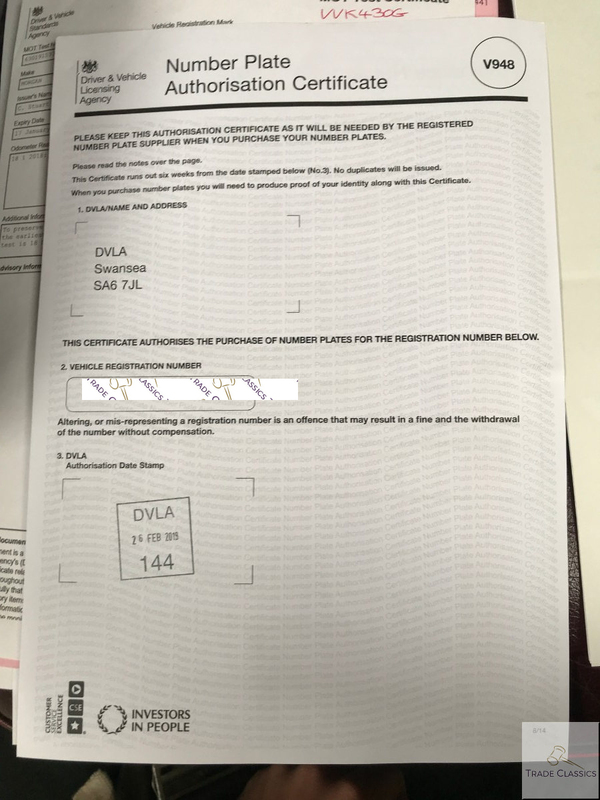 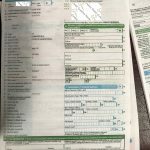 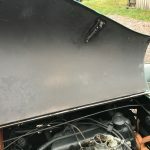 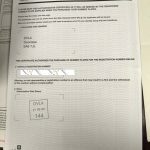 The previous owner completed a valuation that indicates the car had an engine rebuild in 1989, and the car is a factory correct matching numbers example (with the exception of the paint). 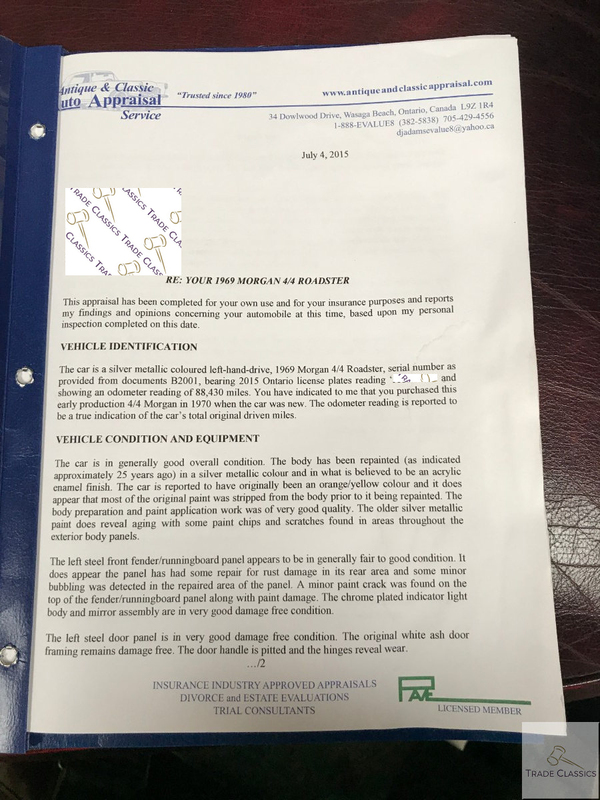 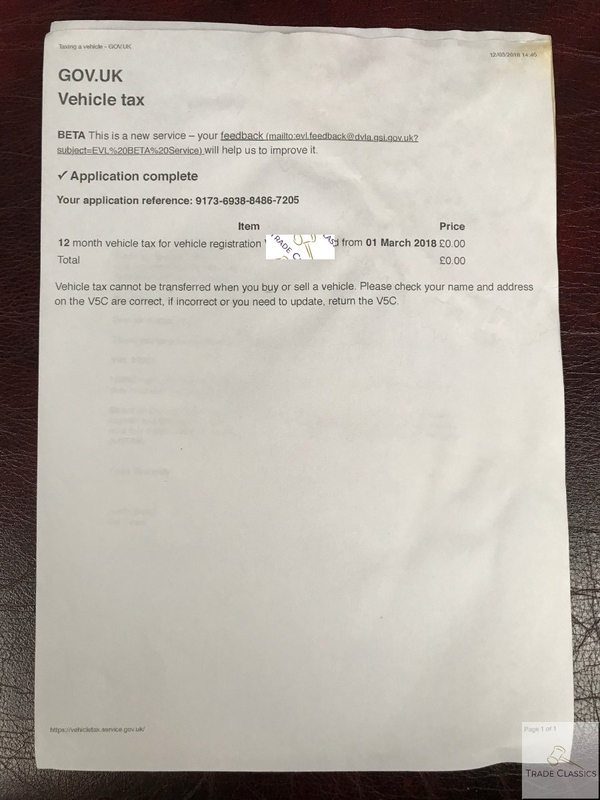 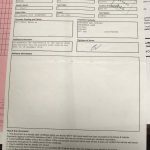 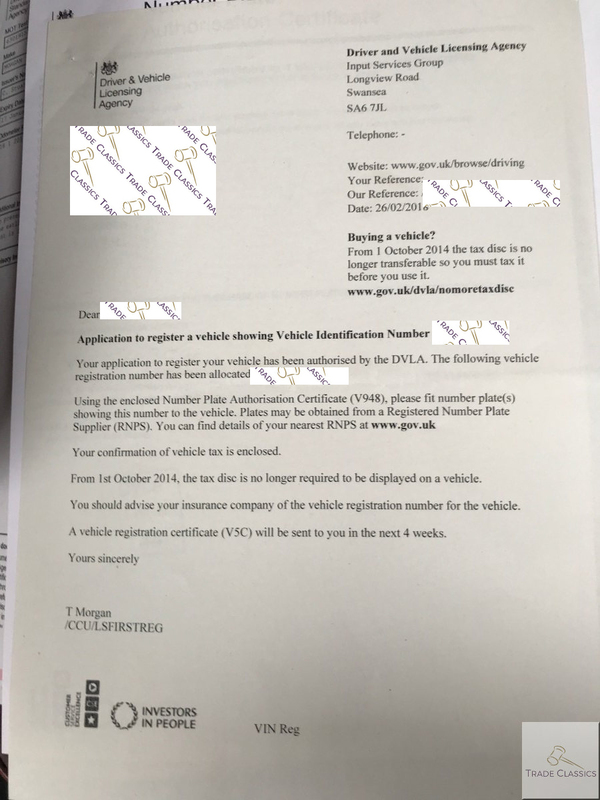 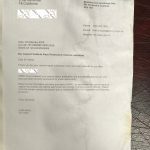 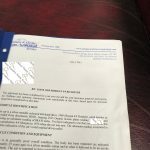 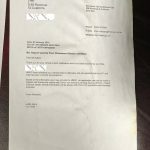 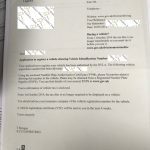 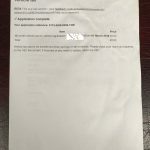 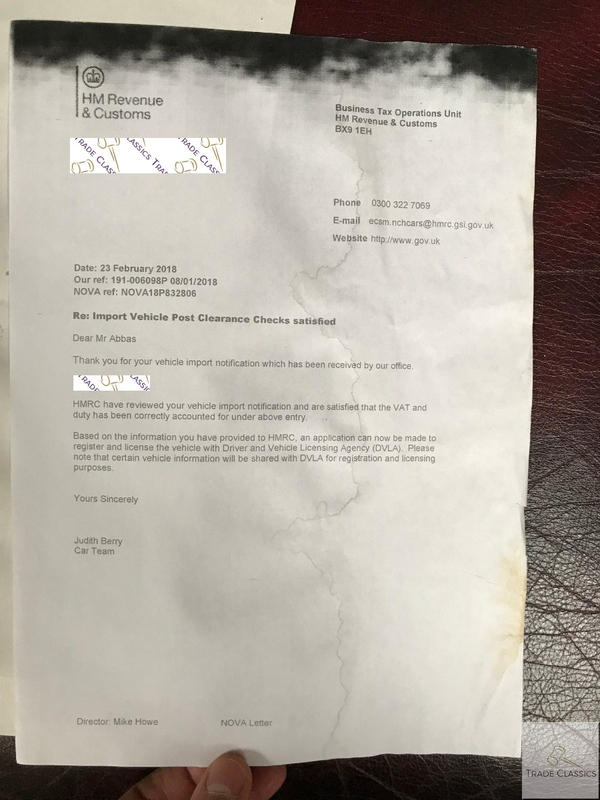 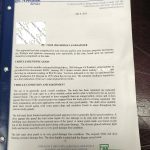 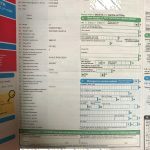 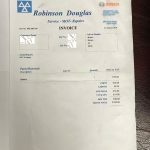 Sadly, the old invoices etc were not found when the car was sold. 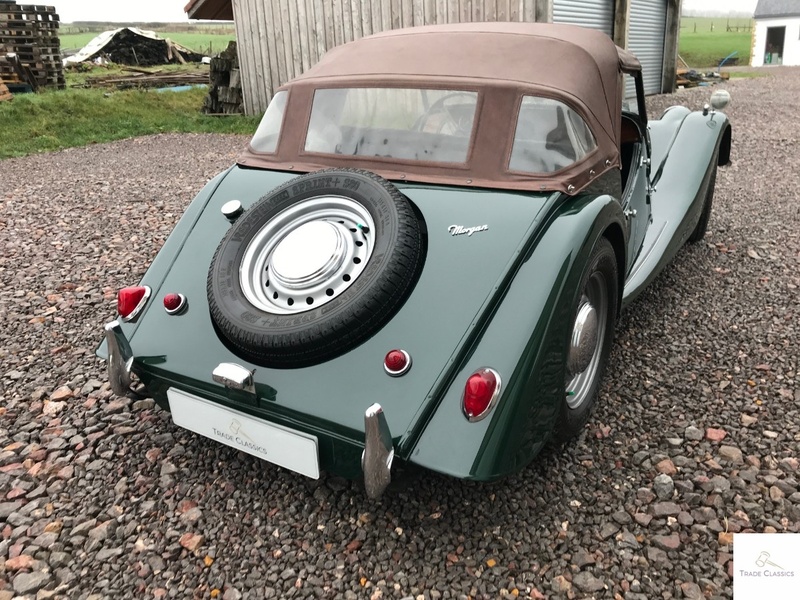 The car is showing just over 88,440 as of 20.01.2019. 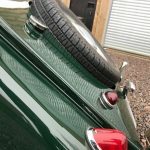 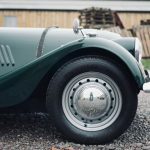 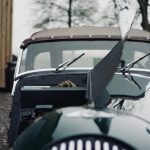 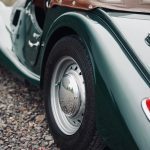 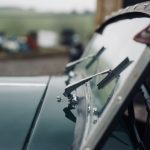 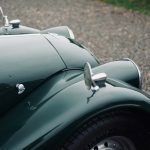 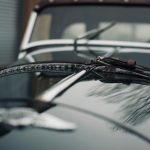 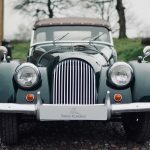 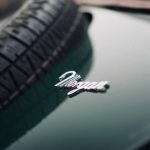 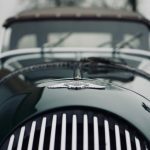 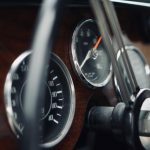 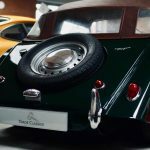 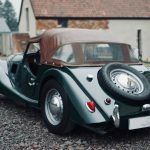 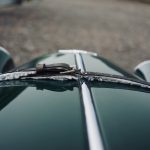 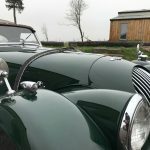 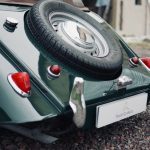 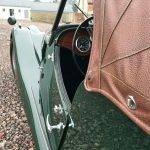 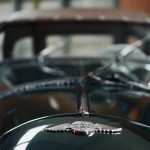 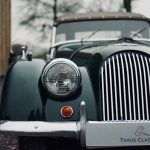 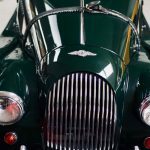 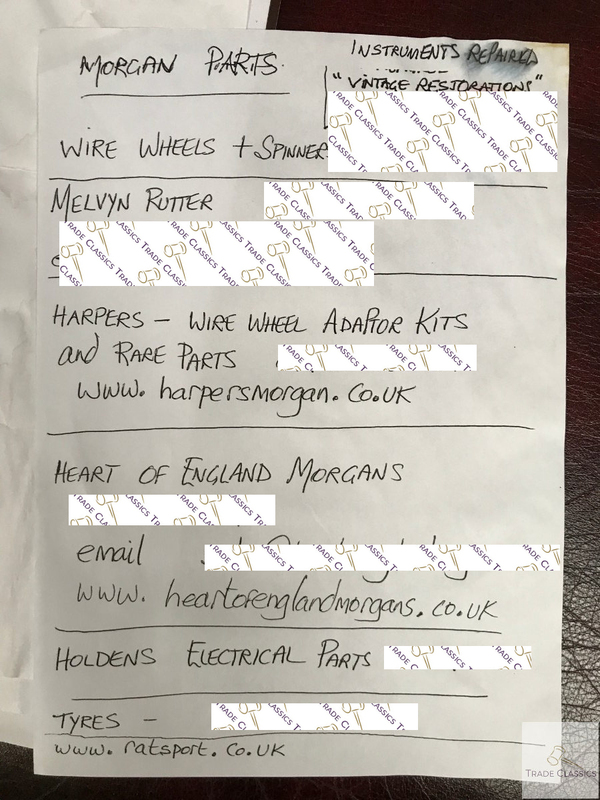 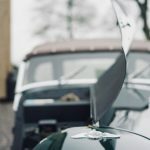 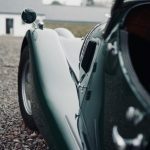 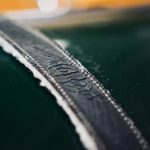 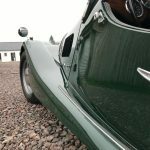 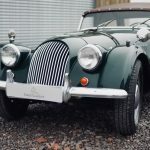 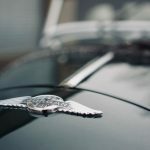 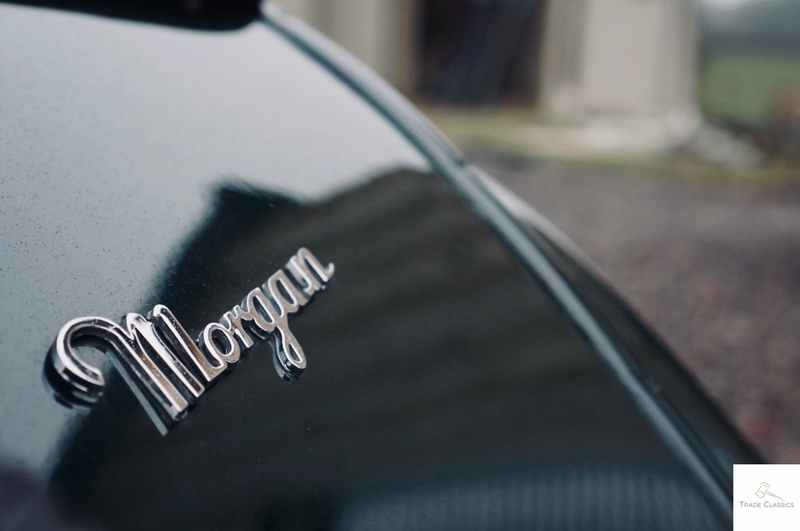 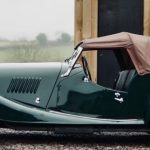 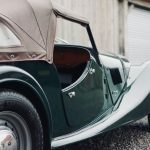 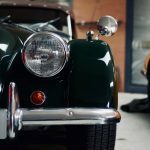 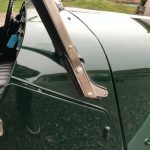 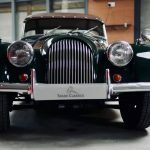 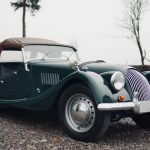 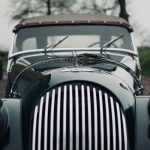 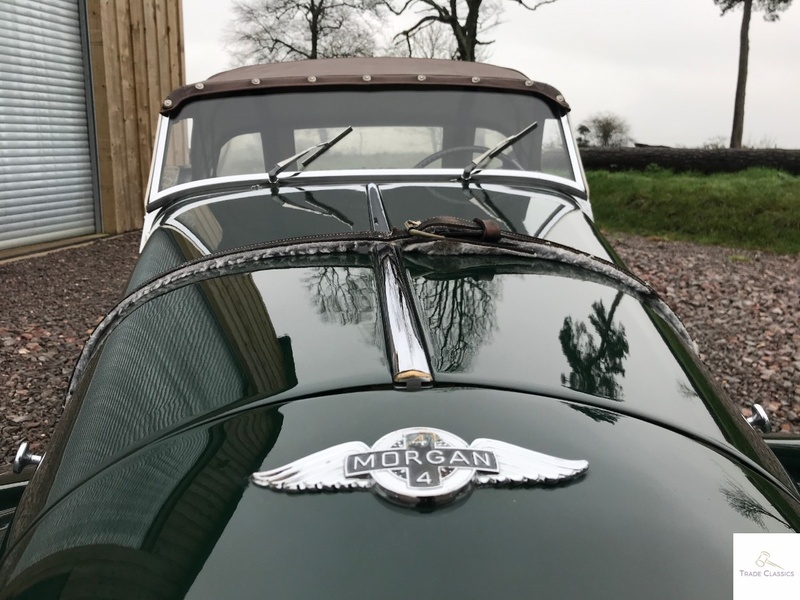 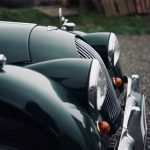 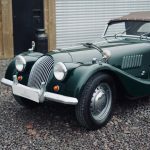 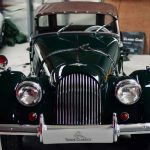 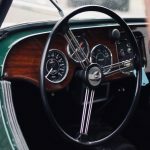 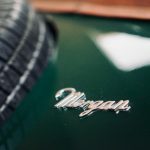 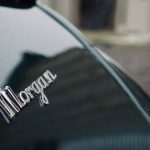 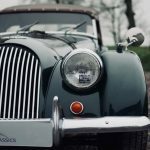 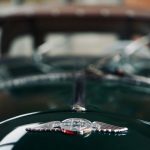 It’s amazing that Morgan are still going strong with their artisanal techniques. 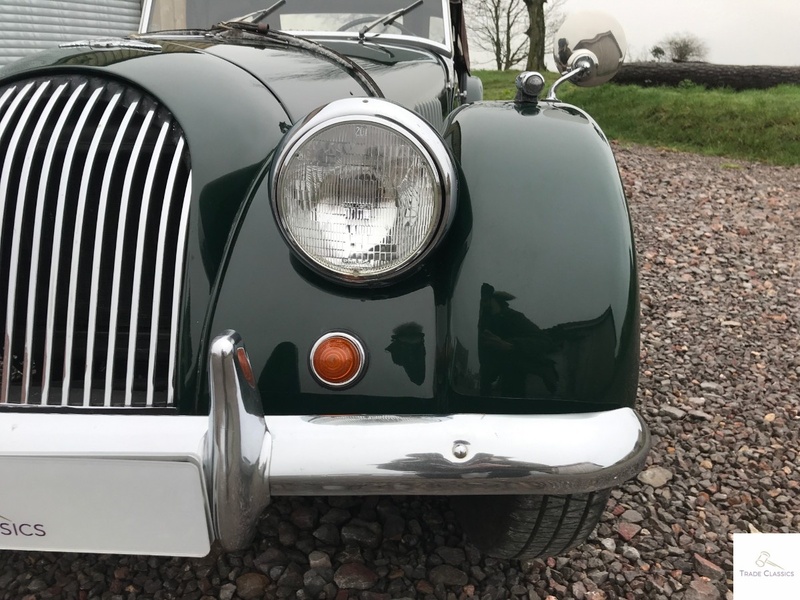 You could argue that it is a tried and tested model that has provided smiles per miles for a long long time, so why be surprised at all! 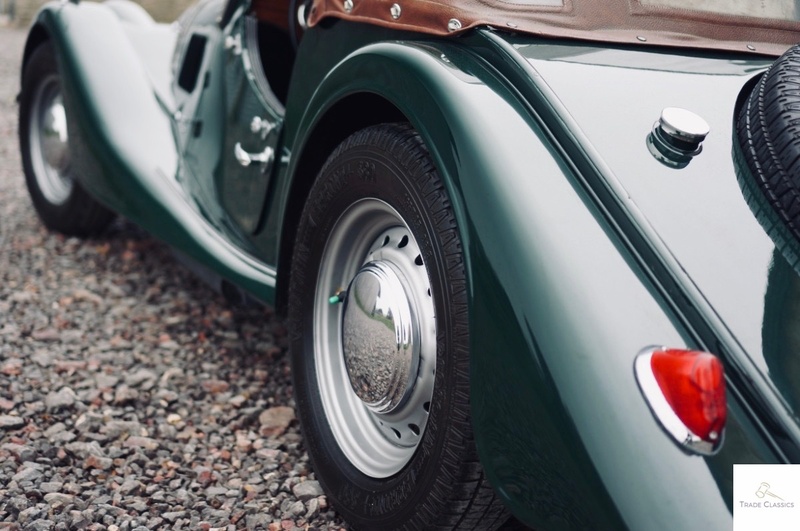 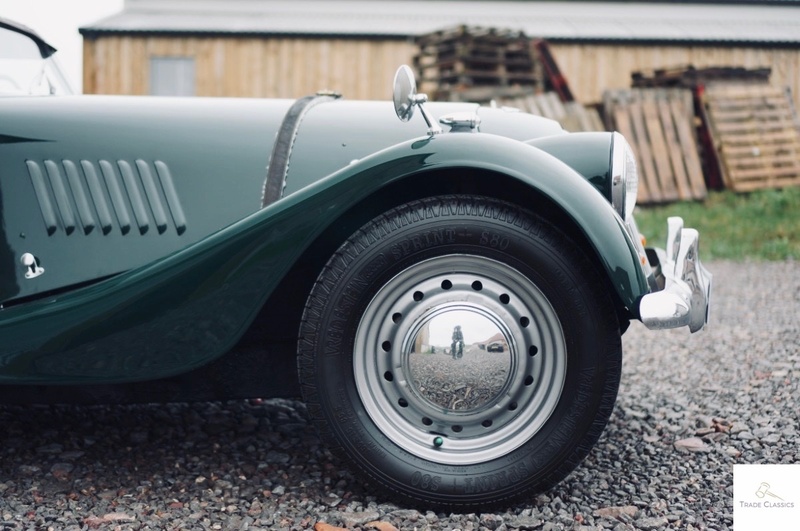 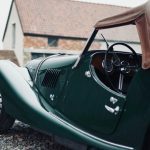 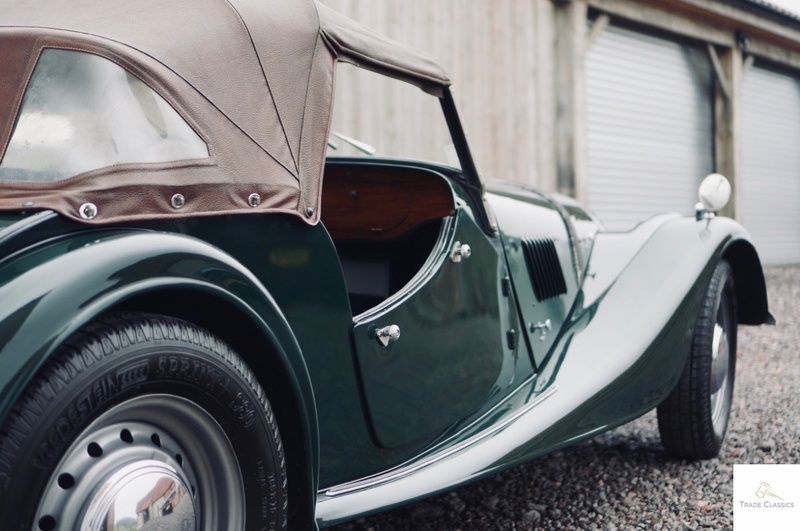 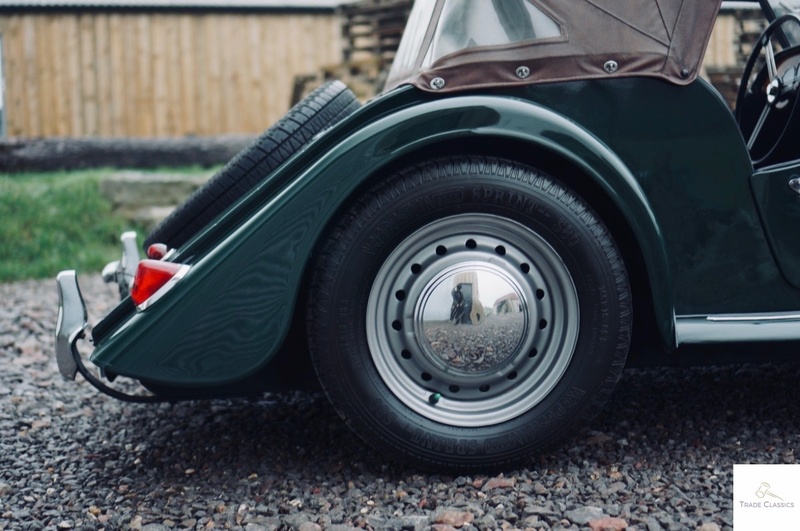 The 4/4 gives you a step in to the Morgan world, the wood body framed, but without the quirkiness of just 3 wheels. 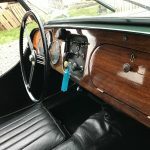 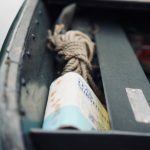 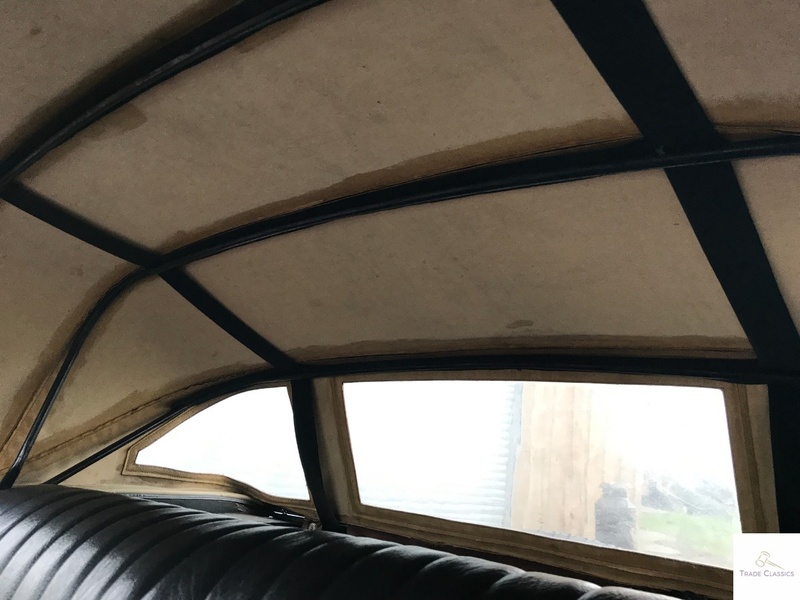 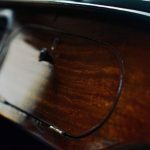 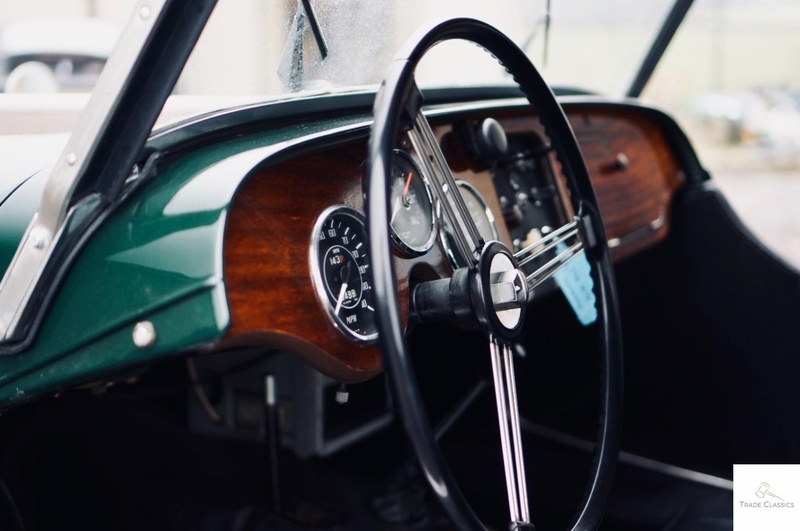 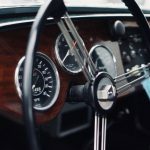 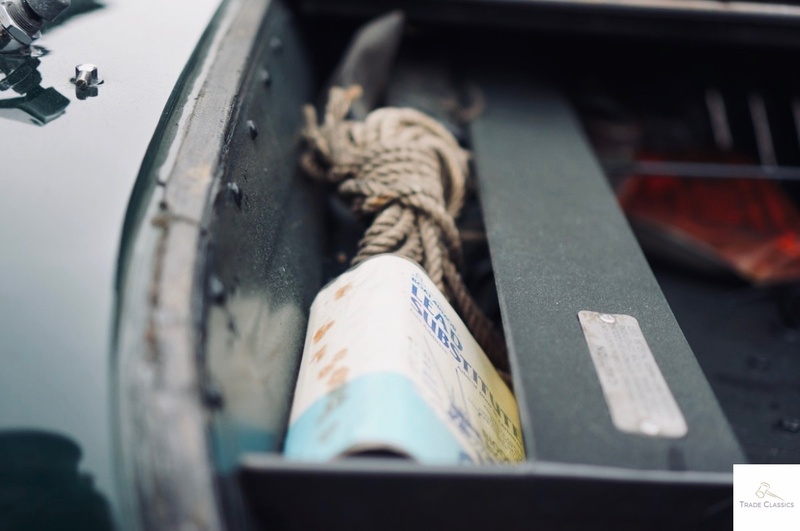 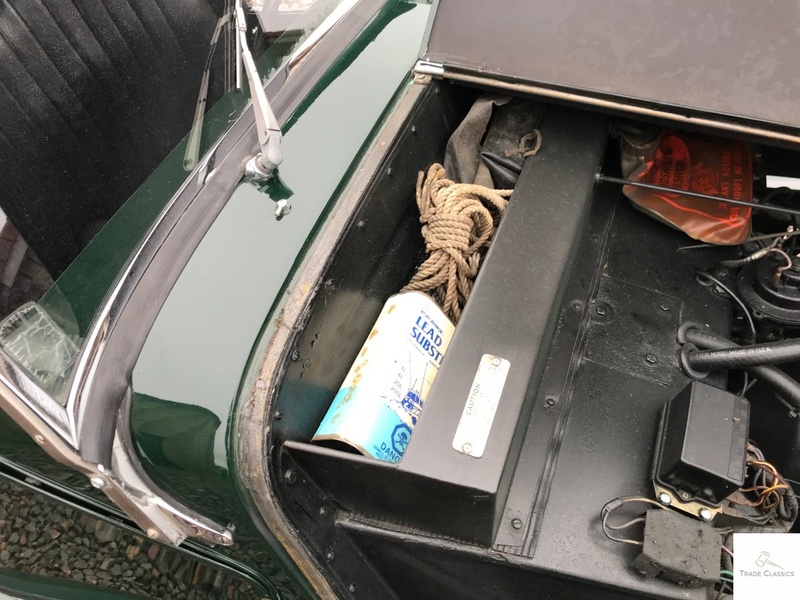 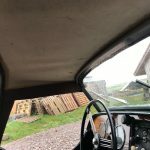 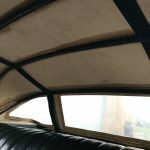 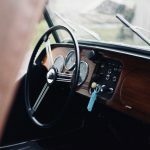 With the cars featuring a lot of wood in the body construction, how they are stored and maintained is an important thing to look out for. 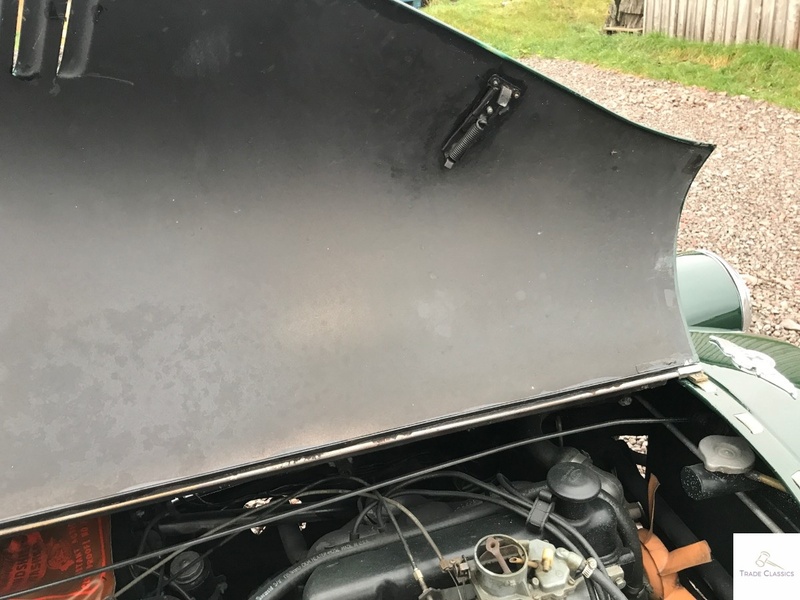 Arun has kept this example in a dehumidified garage that has helped preserve it. 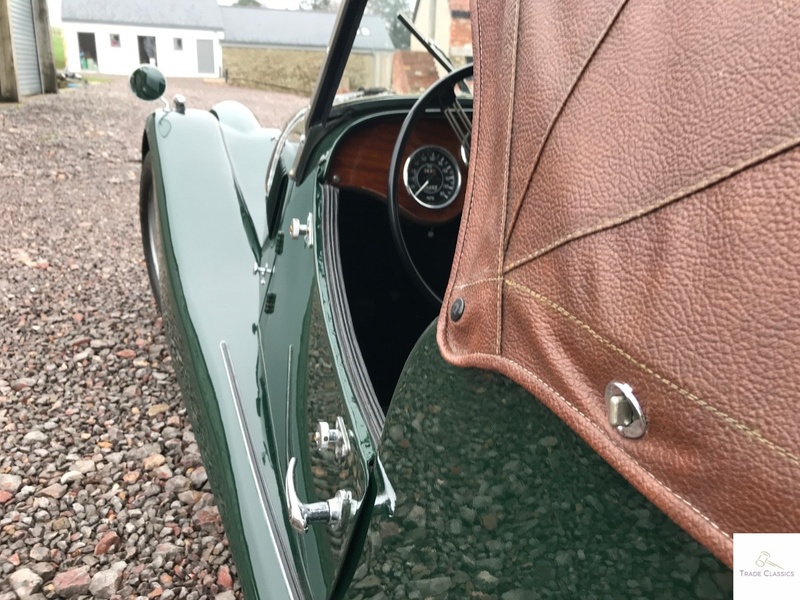 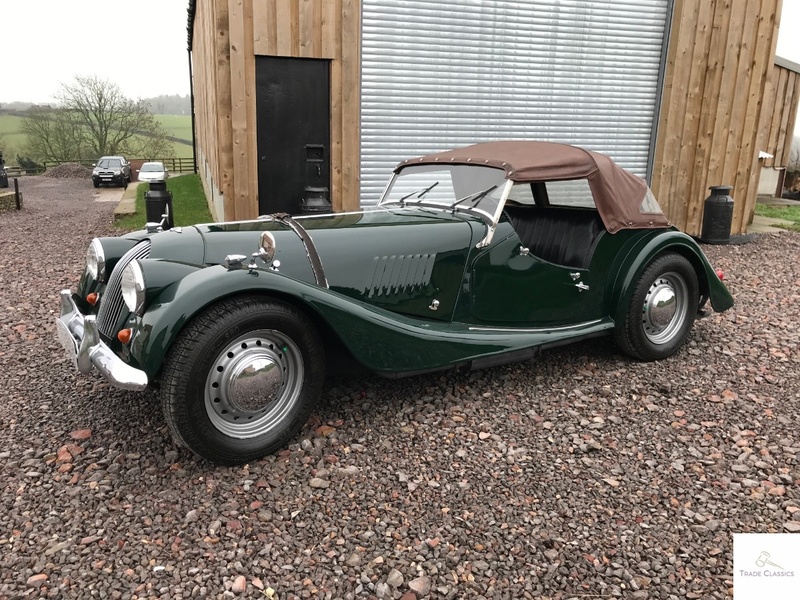 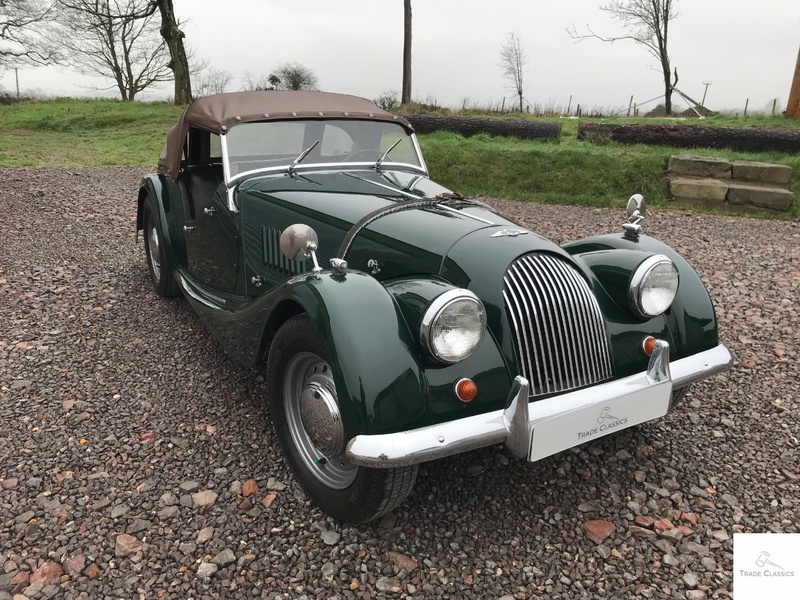 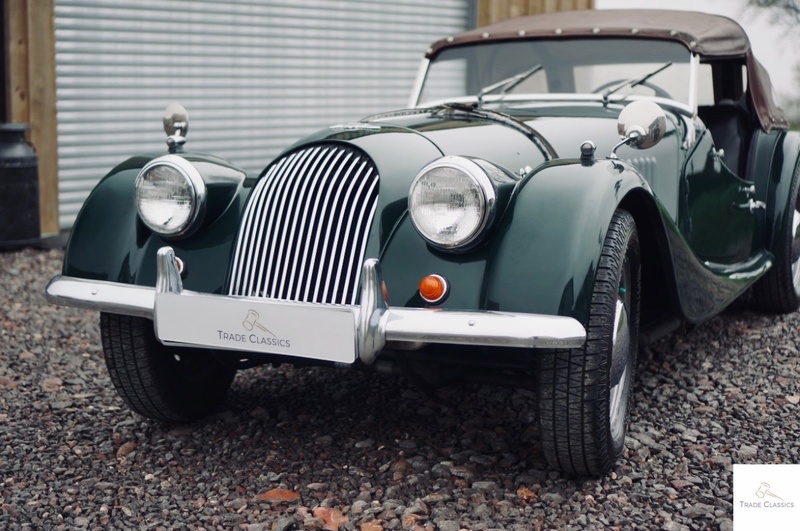 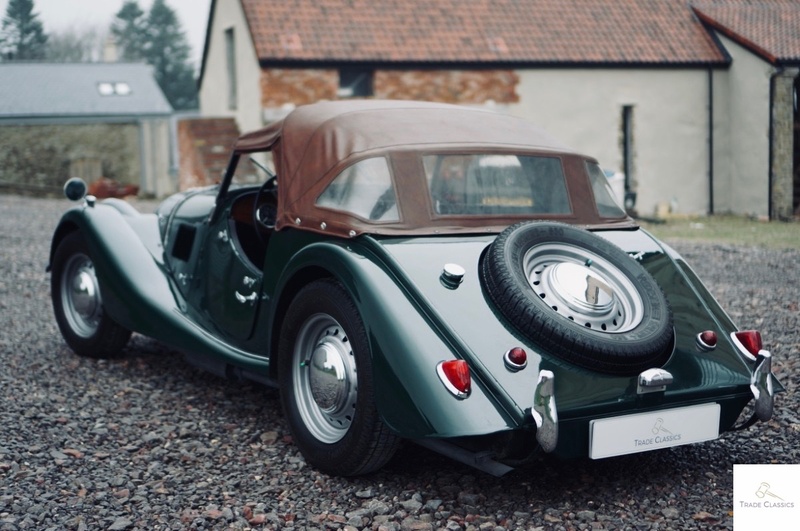 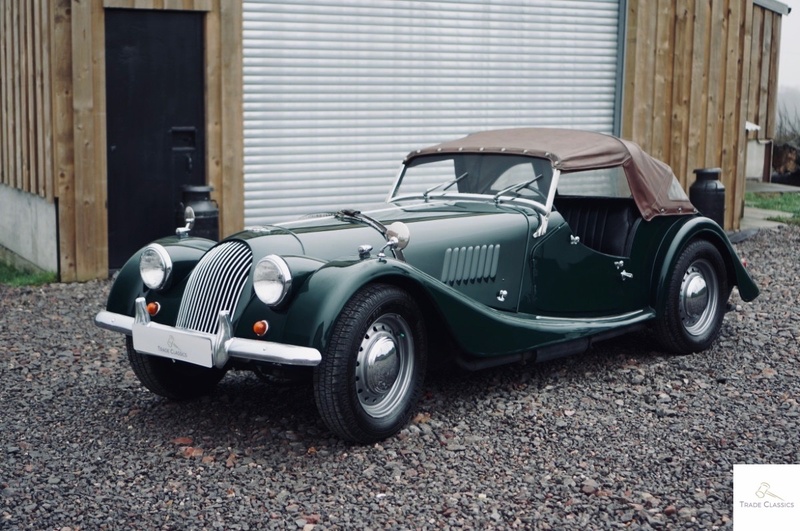 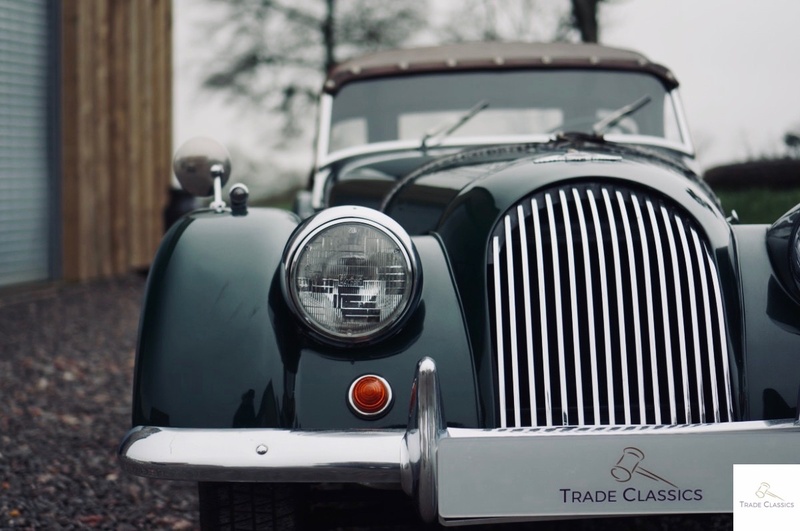 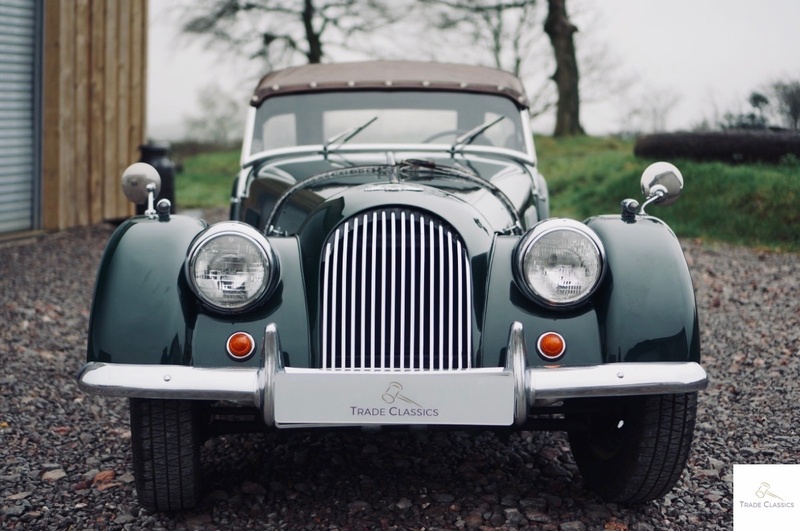 If it’s a Morgan you are after, then this is certainly a nice example to consider, so get in touch with us to find out more.